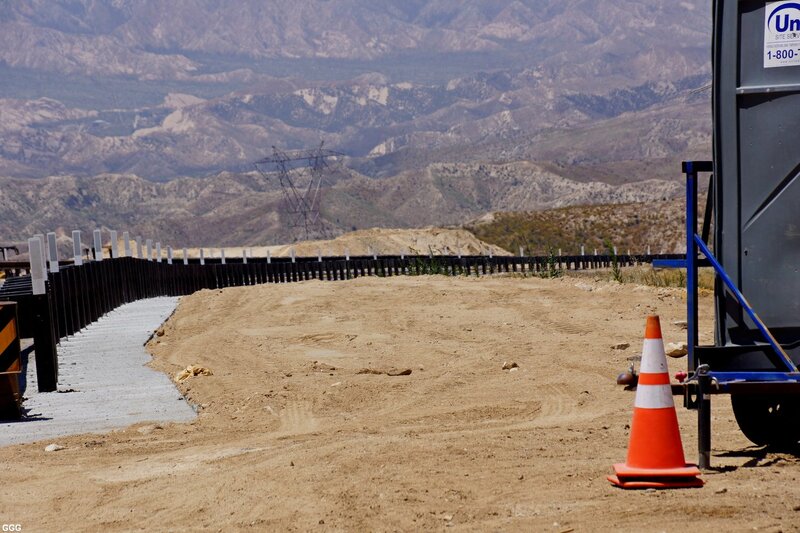 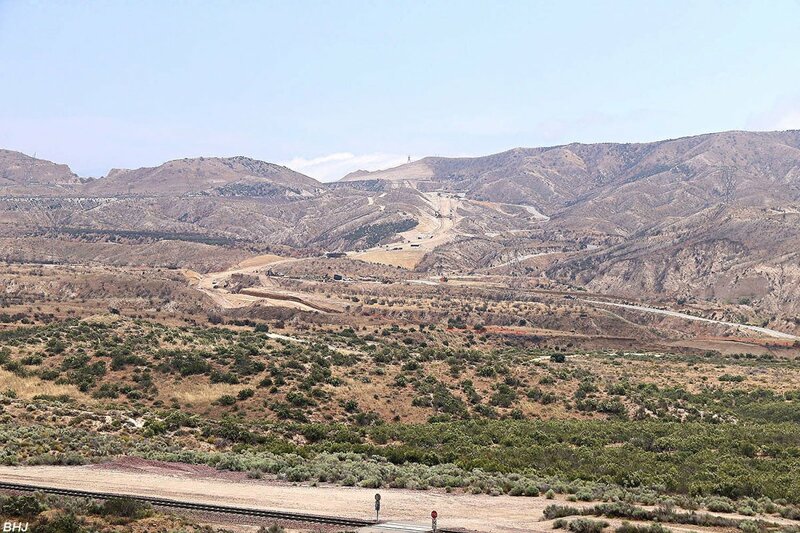 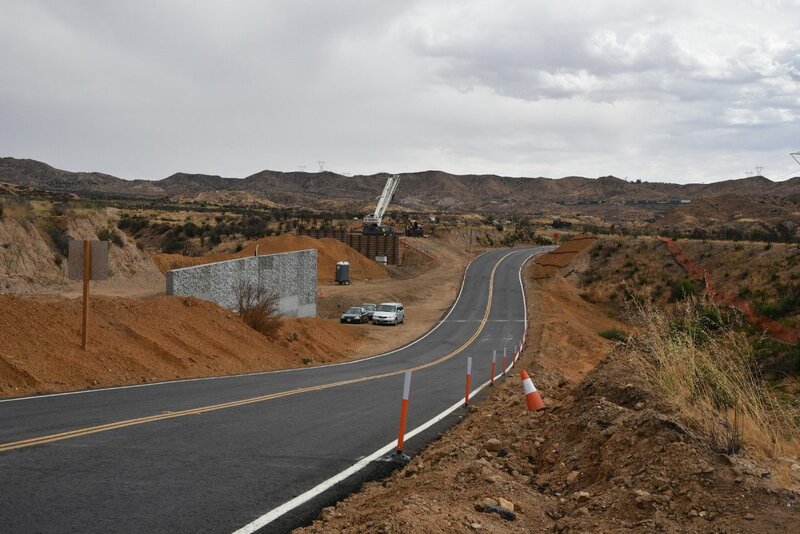 The project to realign SR-138 is essentially complete and the road is fully open to traffic. 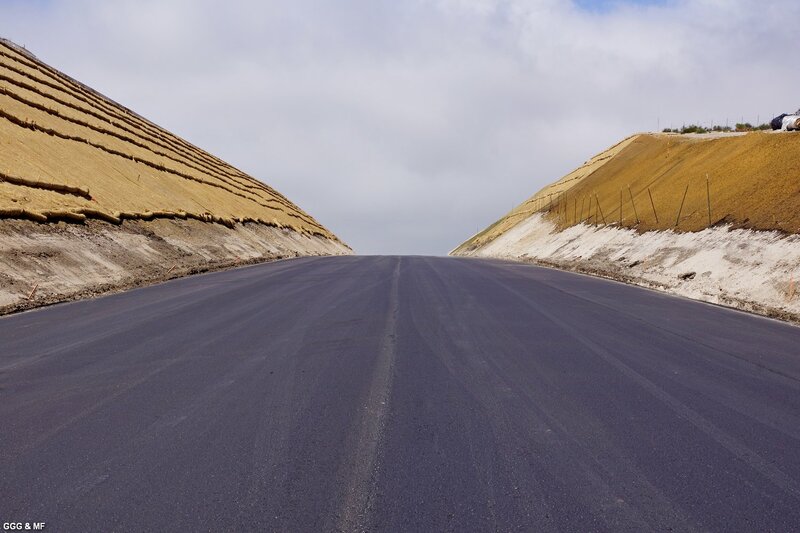 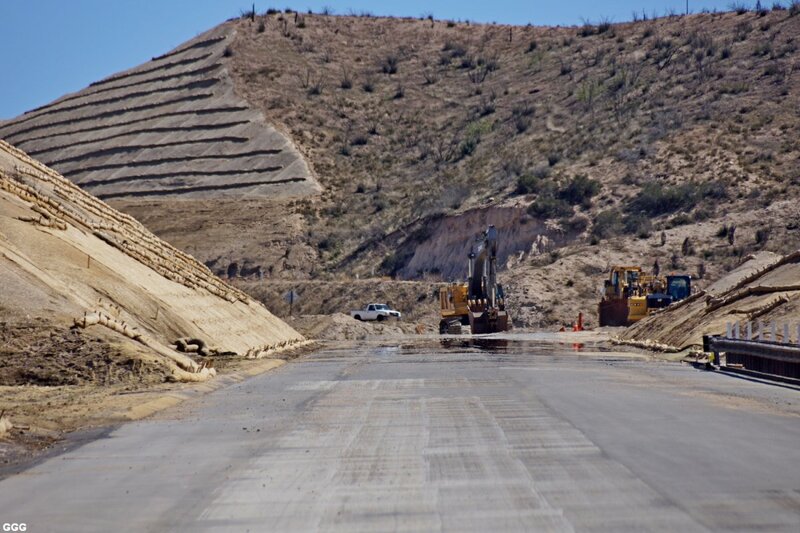 May 31, 2018: Highway 138 (East) Realignment Project is completed. 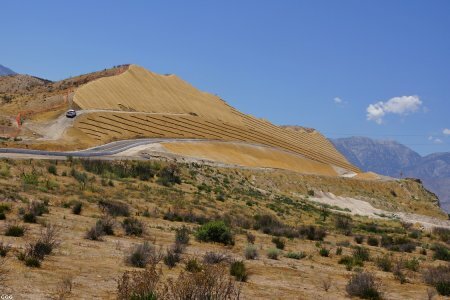 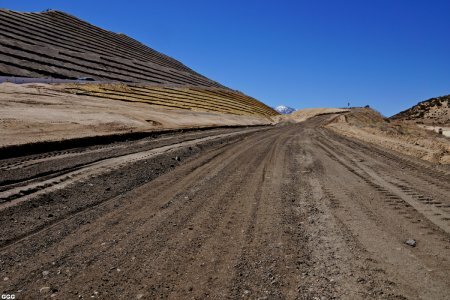 For all who are familiar with Hwy 138 while visitting Cajon Pass, are aware of the old two lane and curvy Highway 138 coming from exit # 131 (I-15) and going to Summit. 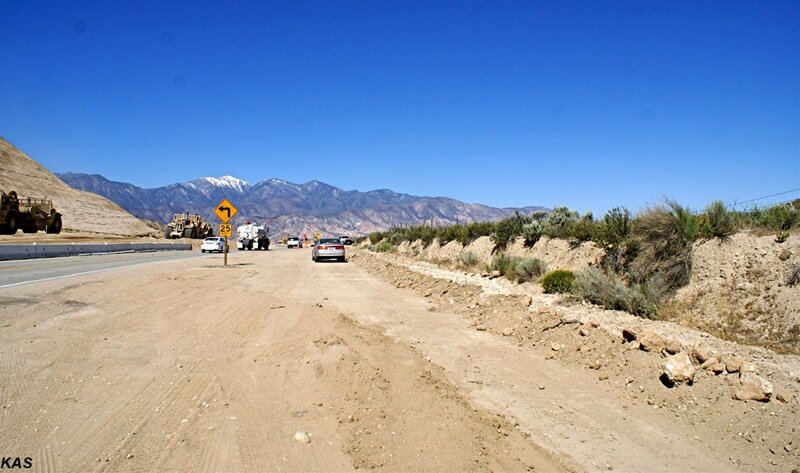 Several years ago, Hwy 138 has been widened after the exit toward Summit for the first 1.9 mls. 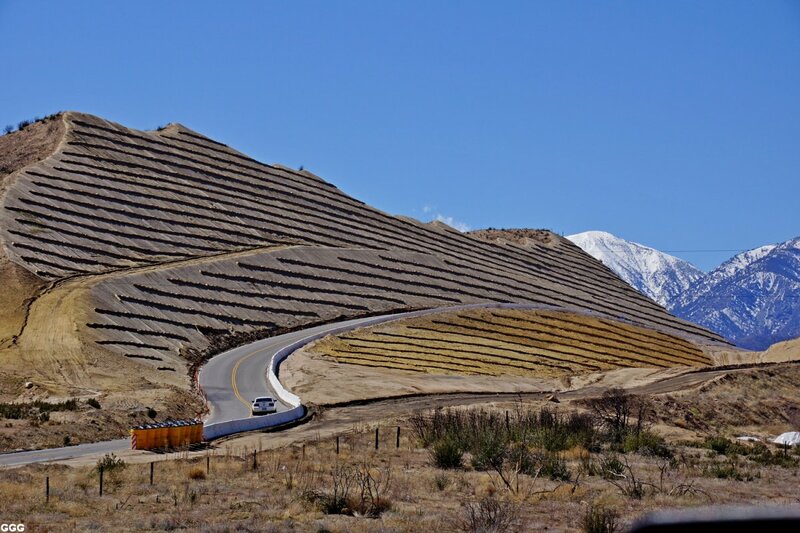 But from that point up to Summit, it is a curvy up and down slow speed (mountain) road. 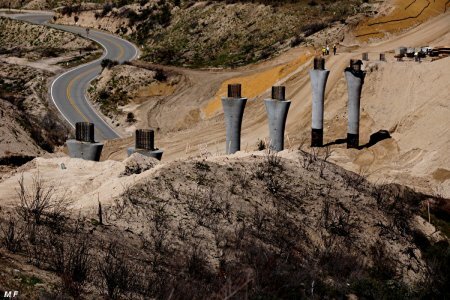 Three bridges and one undercrossing will be built. 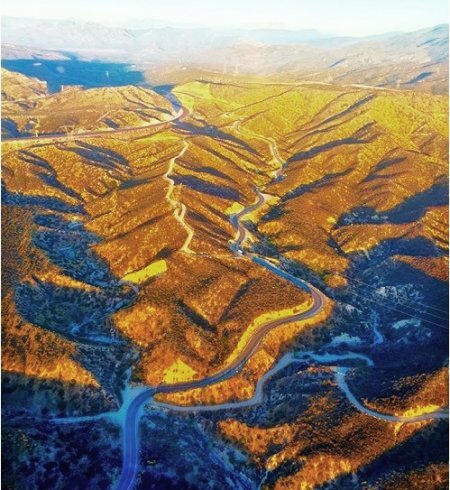 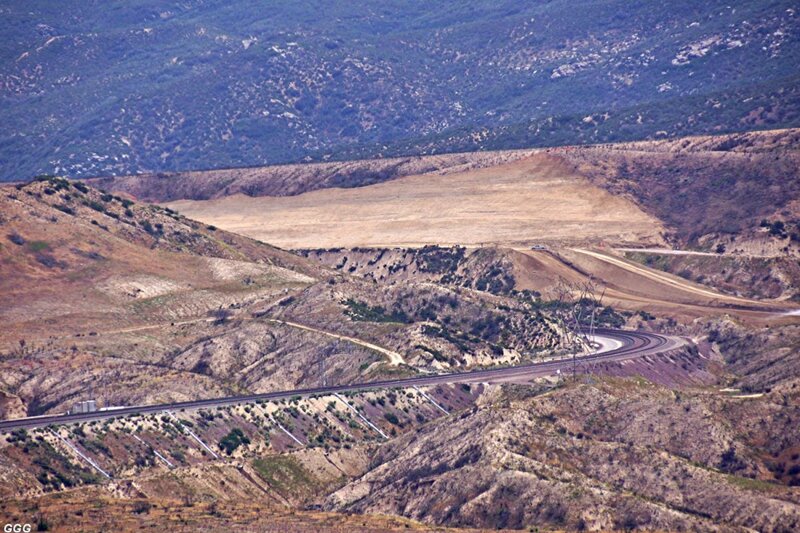 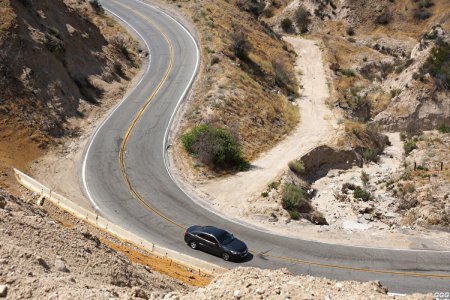 Hwy 138 is famous for the mountain style road with tight curves, up and down with grade up to 15 %. 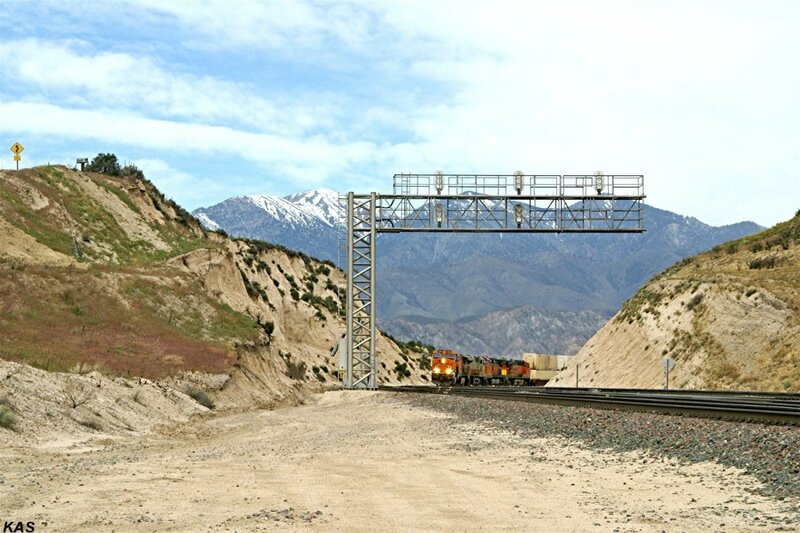 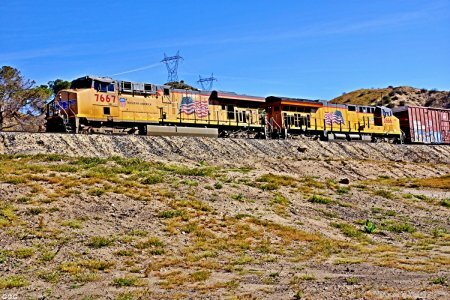 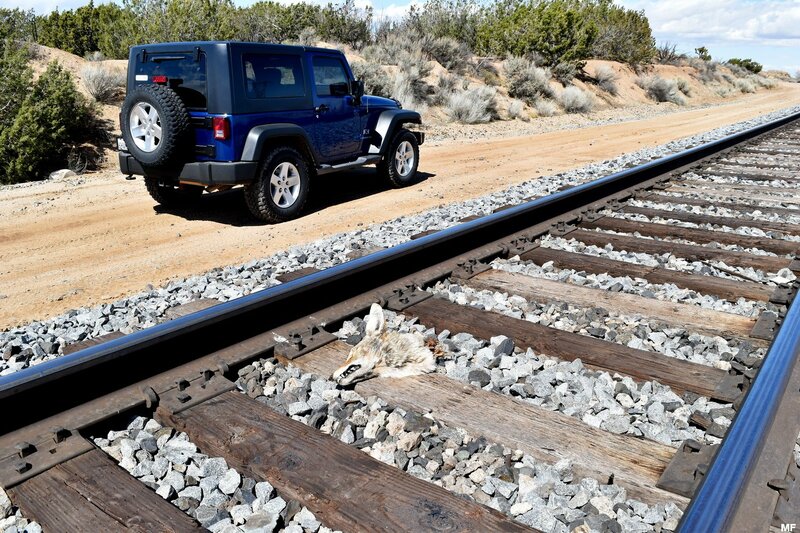 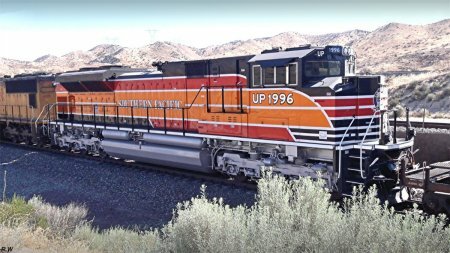 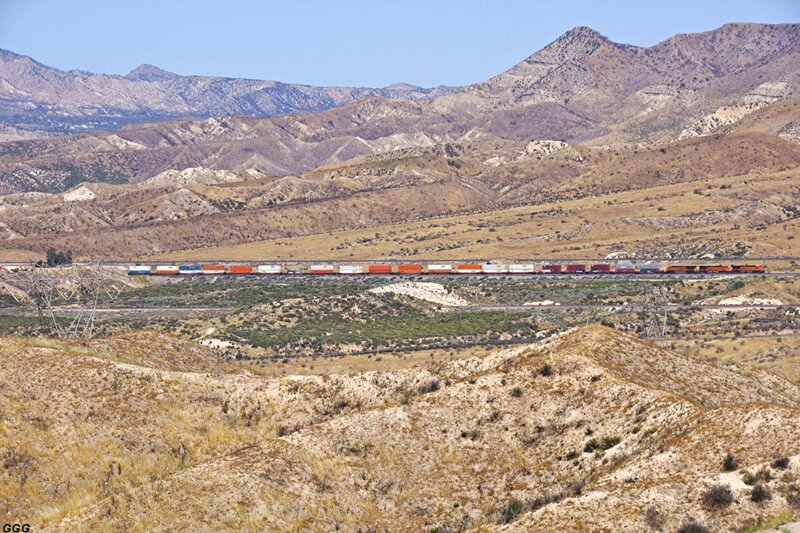 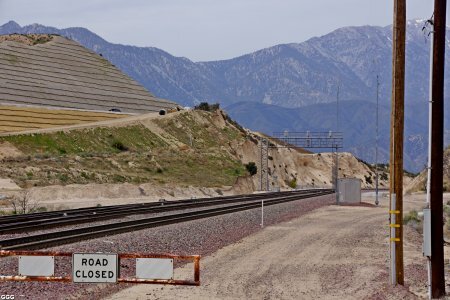 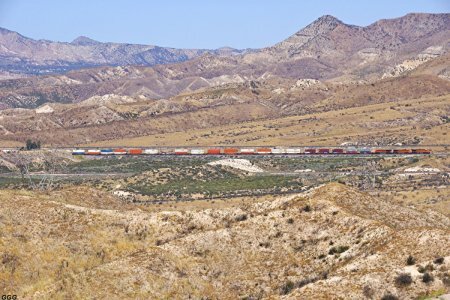 Every railfan knows this road very well while hanging around Cajon Pass. mentioned with each picture. 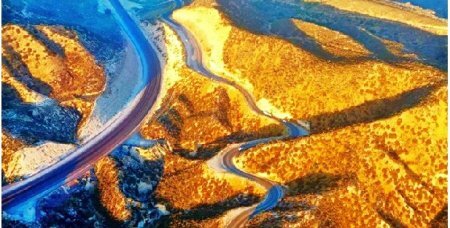 This curvy and hilly road will be history in 2018. 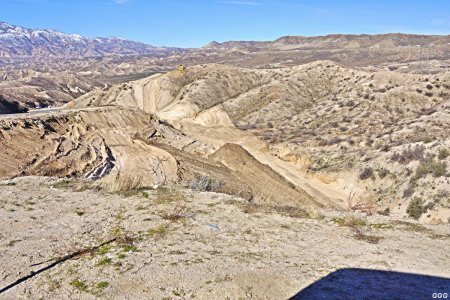 For bigger size photos - please click on the 3-digit number below each photo (the first letters specify the photographer). 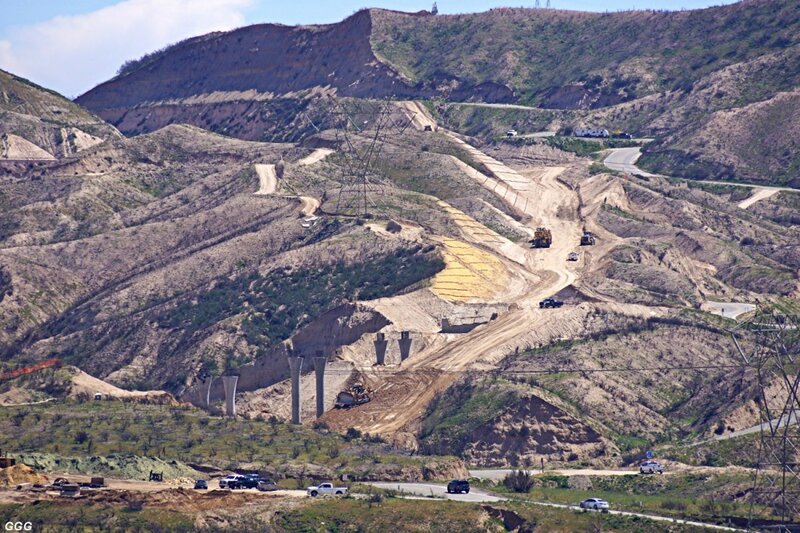 This video was taken on May 12, 2011 and shows a bike ride from I-15 Eastbound uphill to Summit. 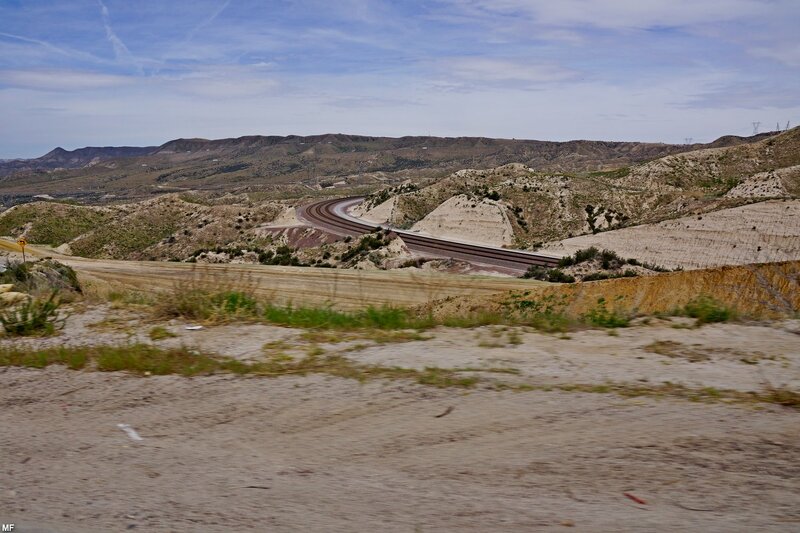 Enjoy the "old" Hwy 138. 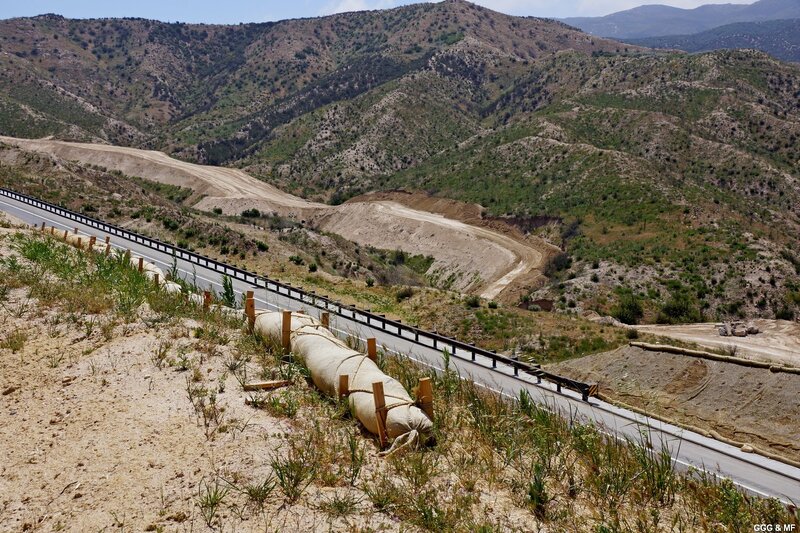 Here is another video taken on July 19, 2014 and shows also an Eastbound bike ride from I-15 to Summit. October 29, 2016: Highway 138 (East) Realignment Project. 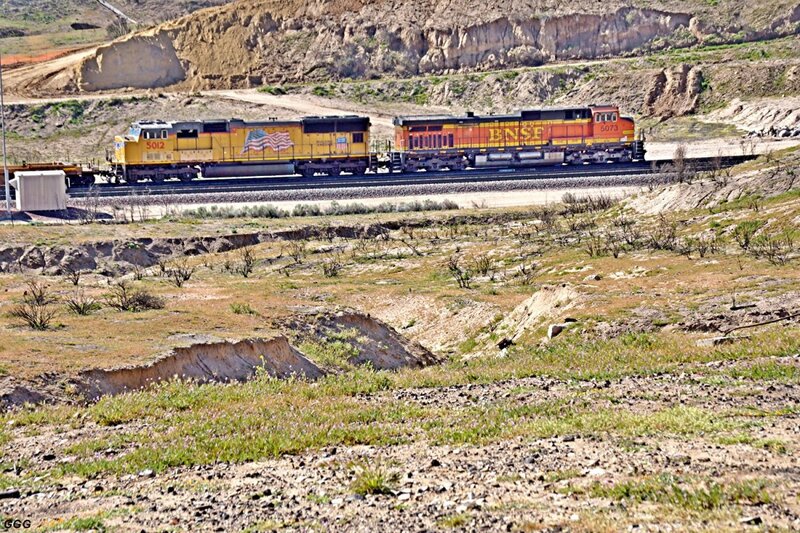 Photos by Michael Frei. 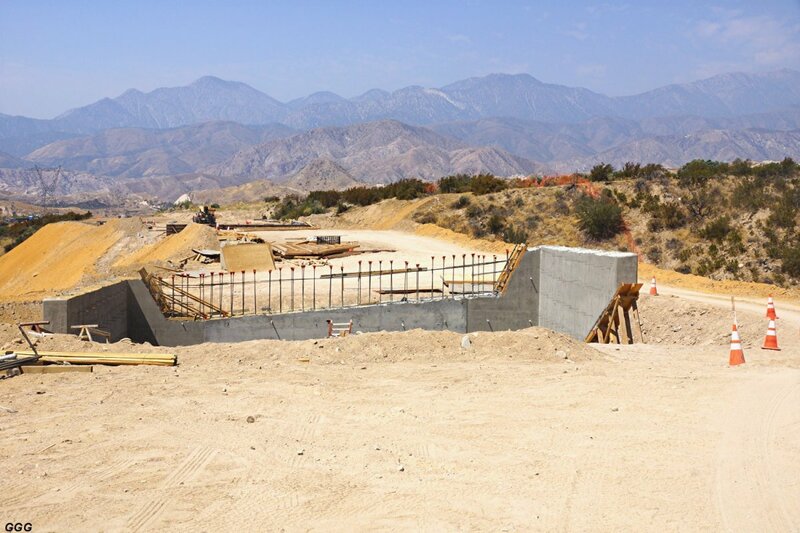 There is not much going on regarding the construction in late October. Lots of equipment and huge pipes are on a fenced site. 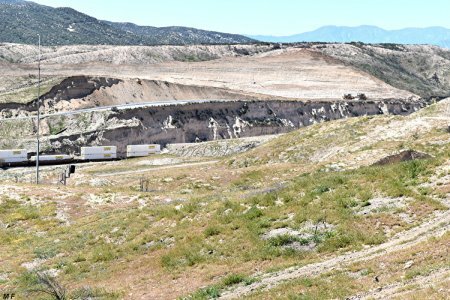 This video shows a car ride from Summit Valley Road Westbound down to Wagon Trail Road just East of I-15. Enjoy the "old" Hwy 138. 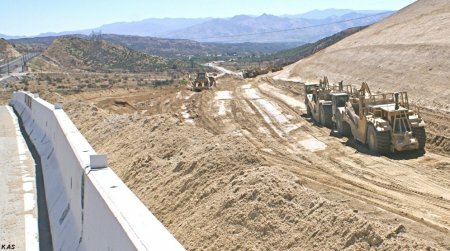 January 30, 2017: Highway 138 (East) Realignment Project. 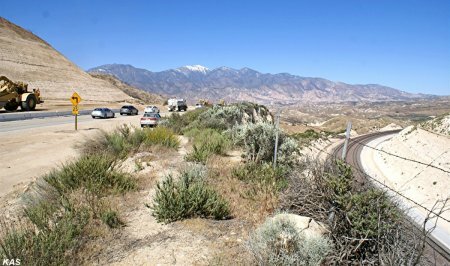 Pictures #008 - #013 were taken between (A), the HWY 138 Summit & (BR-3)-Bridge #3. 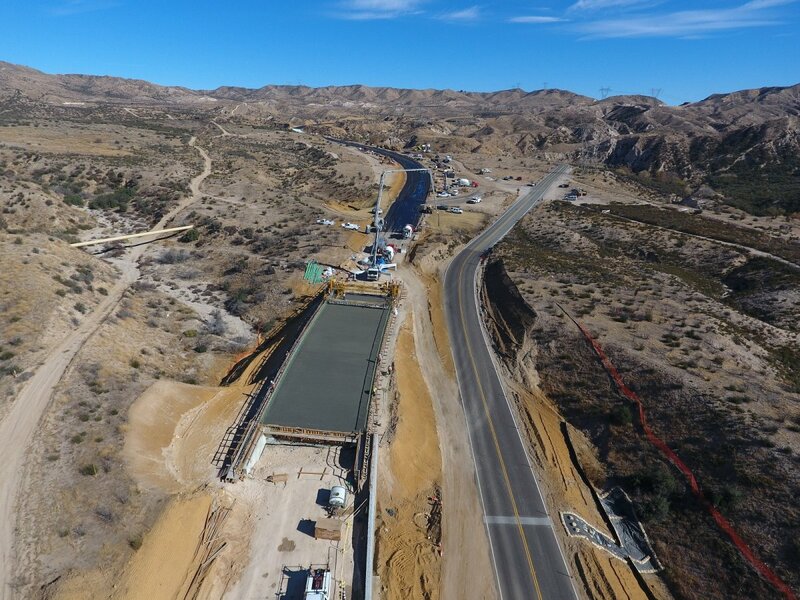 #014 & #015 Looking East from (BR-3), the Eastern abutment and Eastern pier of Bridge 3 are pictured. 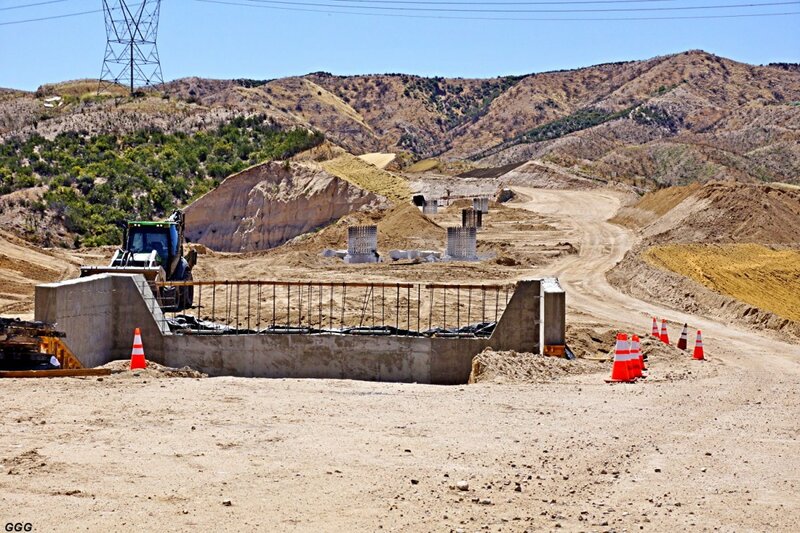 It is our understanding that after the abutments and piers are completed, the entire area will be filled in and the bridge will be built on solid ground. 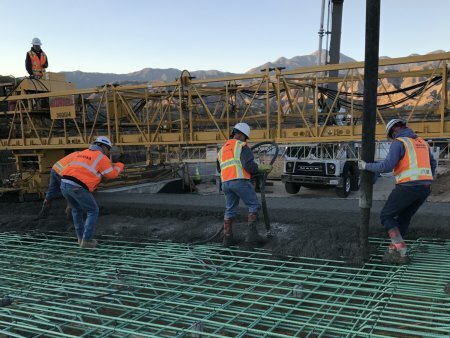 That technique eliminates much of the expensive false work & concrete pumping. 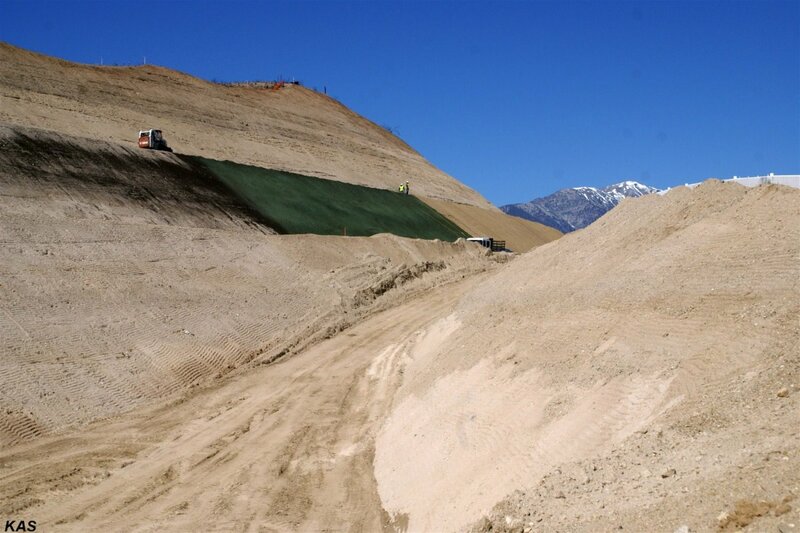 Of course, after bridge completion, the excess dirt will be dug out returning normal drainage to the area. March 1, 2017: Highway 138 (East) Realignment Project. 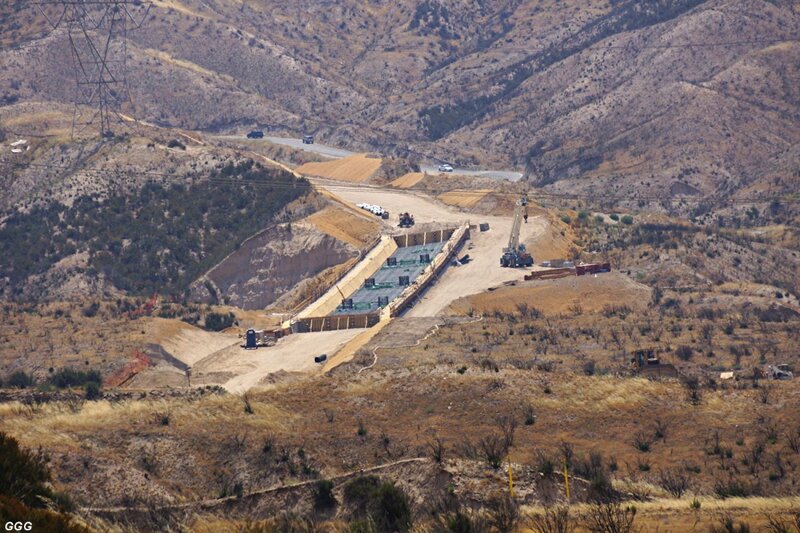 Bruce "Doc" Jones made some accurate pictures on March 1 of the Hwy 138 construction site at Summit incl. 4 photos of train action as seen from the Summit overlook. Please refer position (A) and (BR #3) on the map (007) above. BHJ 3/01/17 From the Overlook, West showing both old & new SR 138 alignments. - 020 BHJ 3/01/17 From (BR #3), pier & abutment progress on new Bridge #3. 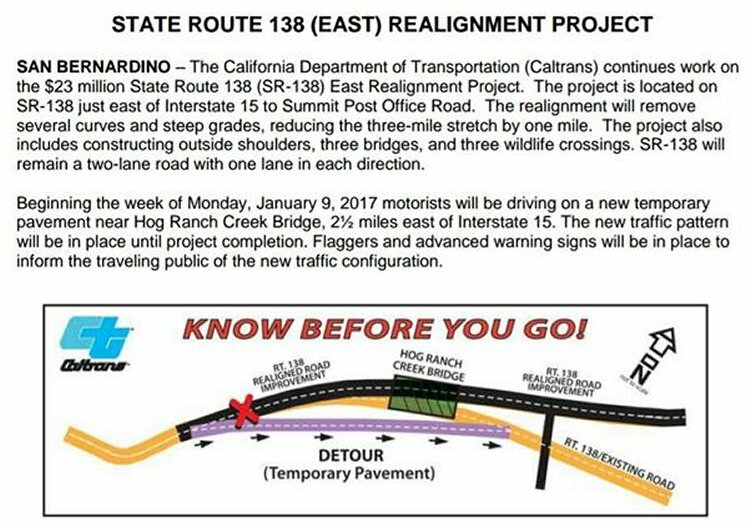 March 9, 2017: Highway 138 (East) Realignment Project. BTW, there is a road closure in effect from March 21 to April 4. I'm assuming (dangerous again) that it will begin at the I-15/138 junction. Not sure where it will be on the east end. 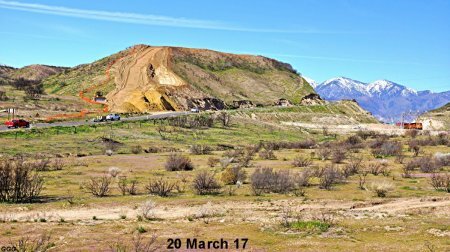 March 20, 2017: Highway 138 (East) Realignment Project. From (BR #3), the Eastern abutment & three sets of piers for Bridge #3 are shown. Much of the dirt removed from Summit Hill will be used to build up the area to the tops of the abutments so that the bridge can be built on solid ground. 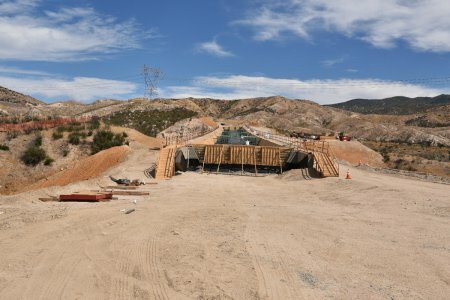 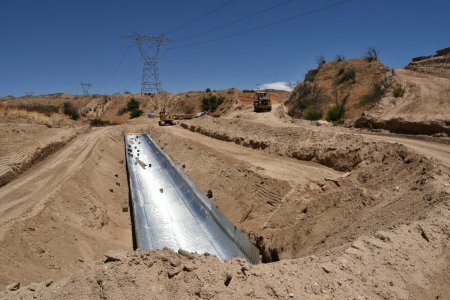 This technique will eliminate the tremendous cost of building all of the support structure & 'false work', strong enough to support tons & tons of steel and concrete 30+ feet above the existing grade. 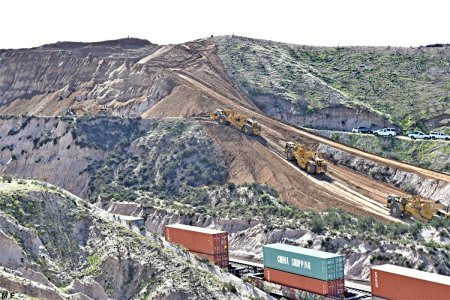 Obviously, after bridge construction is complete, the supporting dirt will be removed and the terrain restored to it's present contours. March 22, 2017: Highway 138 (East) Realignment Project. 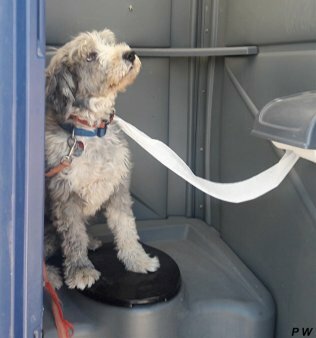 With the SR 138 closure, MAD Marc has spent the last few days searching for and finding a new viewpoint to show the project. 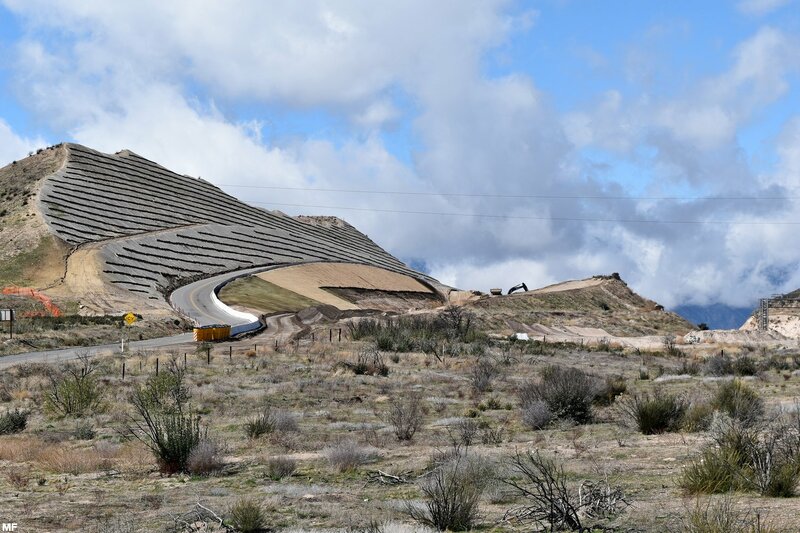 The work, for the last week, has centered on cutting away the Summit Hill (above the Summit Overlook). 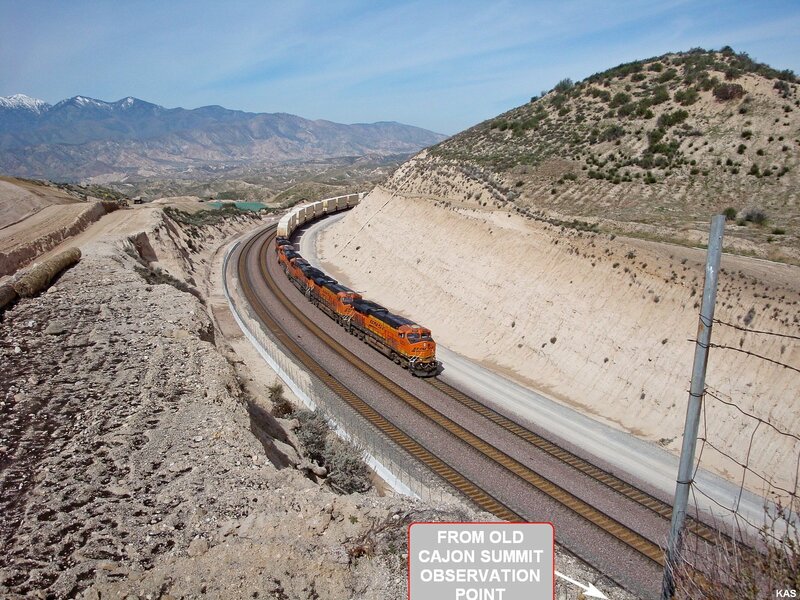 Marc's new vantage is across the BNSF triple mains from the SR 138 Summit Overlook. 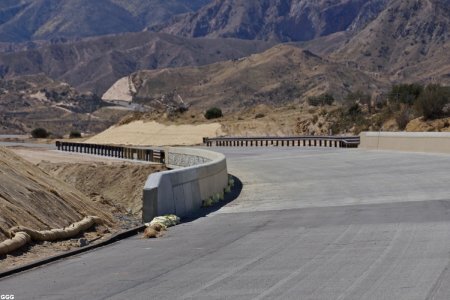 As normal with MAD MARC, the off the road King, getting there is MORE THAN HALF the "FUN". 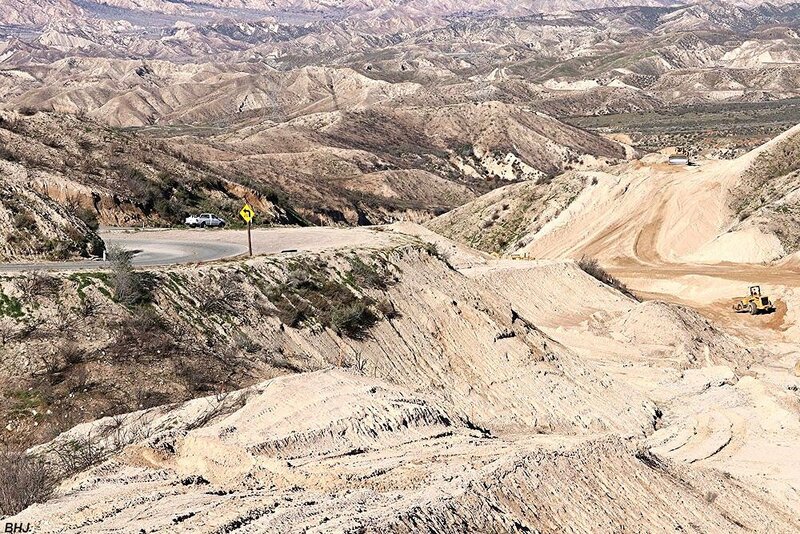 This new place where no man has ever wanted to go is now officially known as MARC'S MADNESS !!! 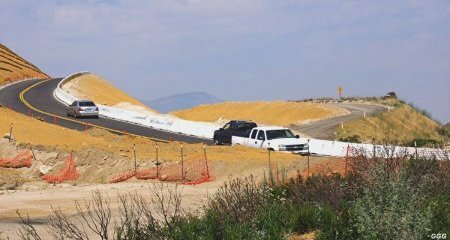 Descend the even steeper WEST ramp to deposit their loads to elevate the canyon between the Overlook and Bridge #3--- (A) & (BR#3) on map. 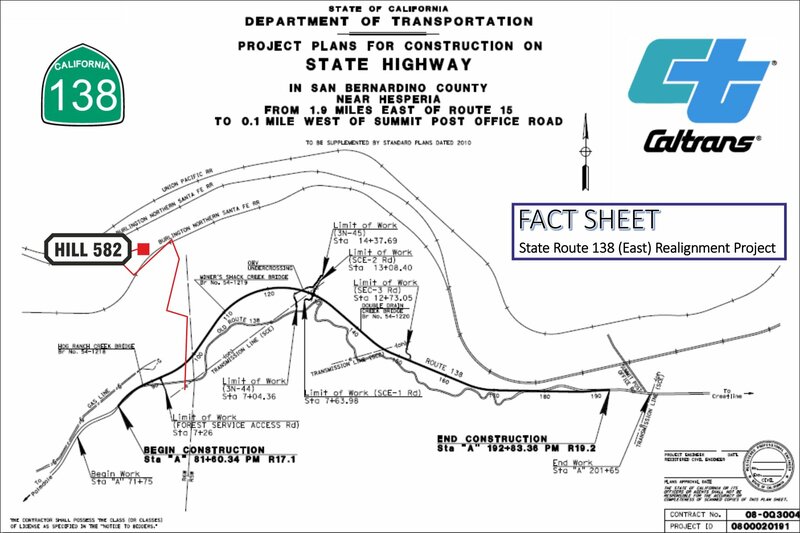 Note that 'down ramp' was built over the existing SR 138. 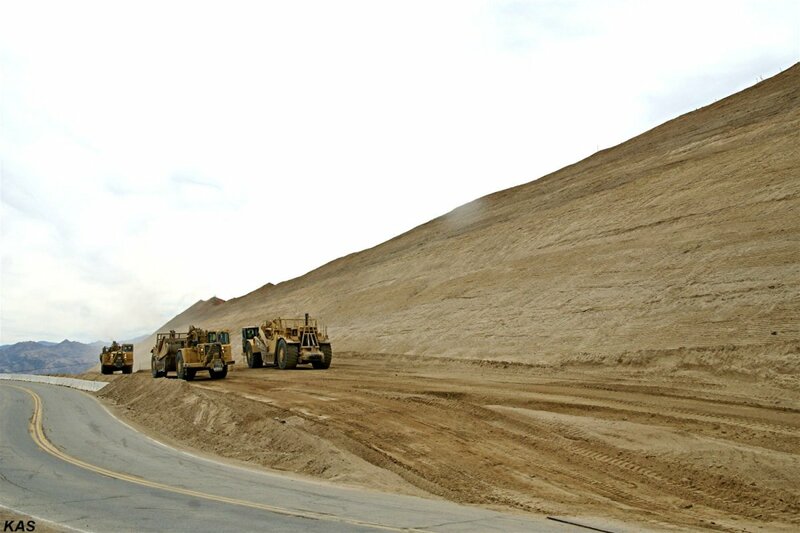 When empty, the scrappers climb the shorter ramp up to SR 138, travel East and repeat the process. 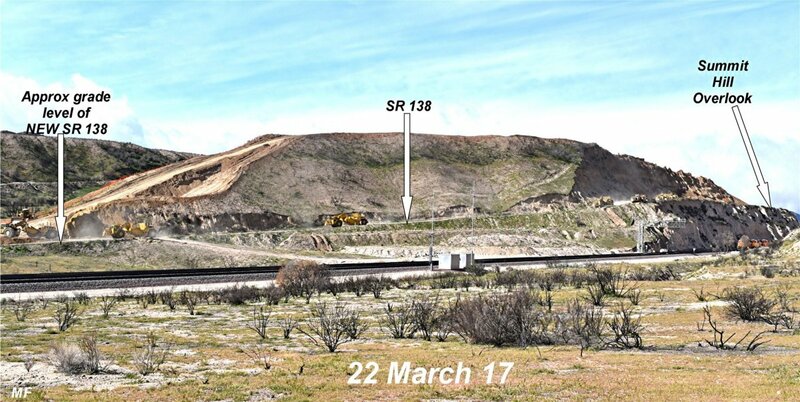 Of course, SR 138 is still closed for any traffic and should be reopened after April 4. 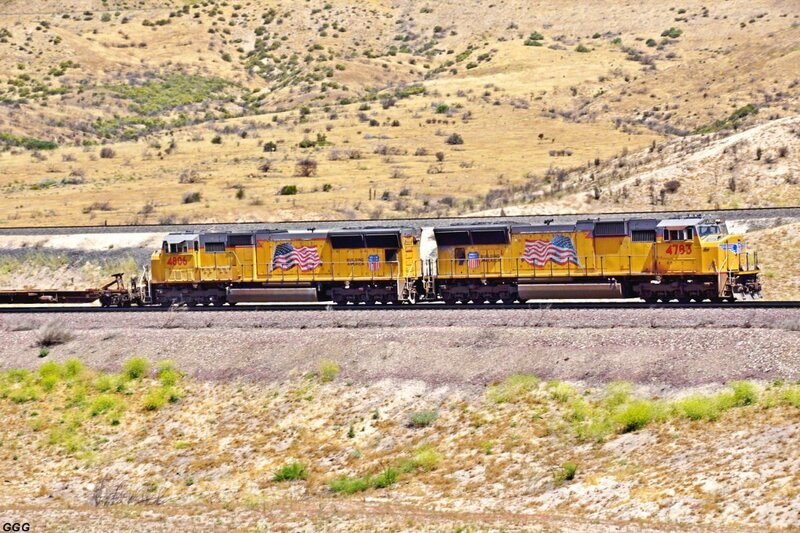 #058-065: UP 6577 with CSX is EB with a second military train. 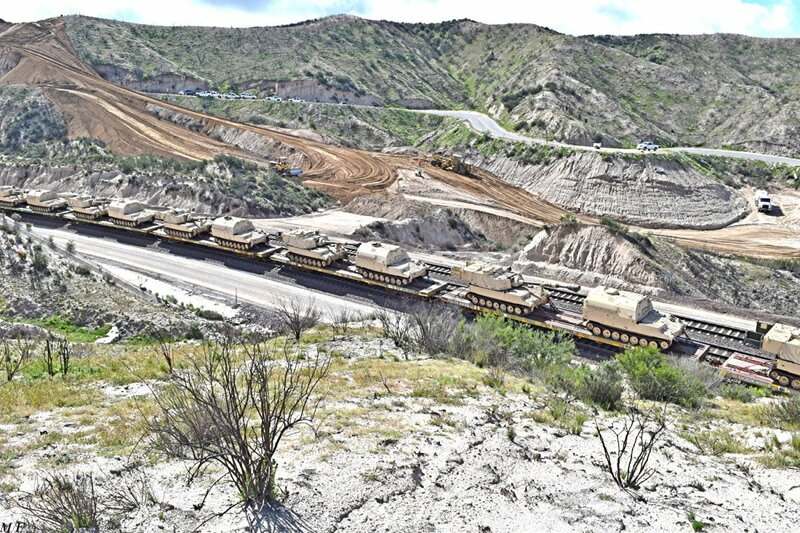 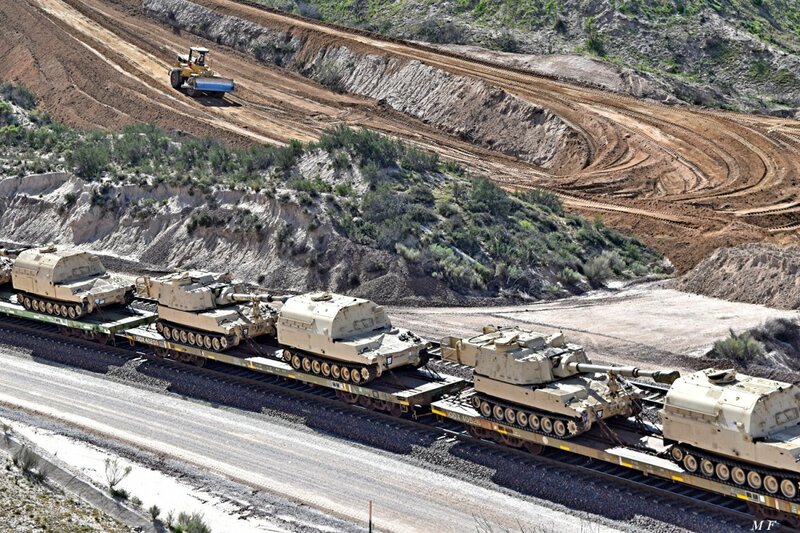 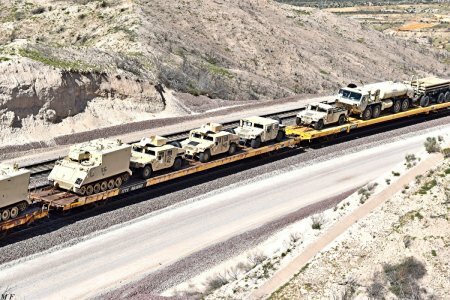 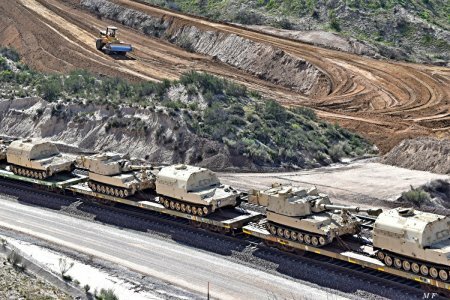 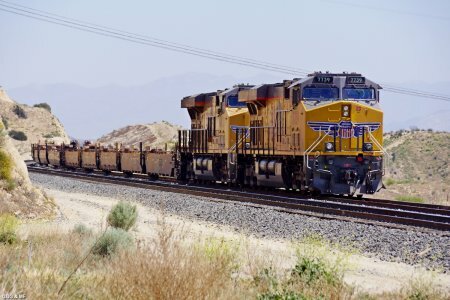 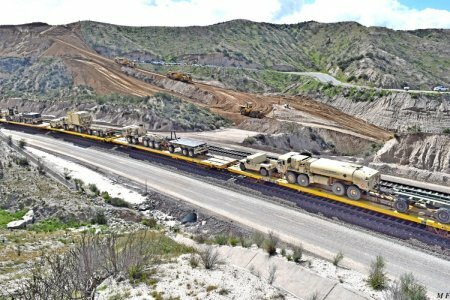 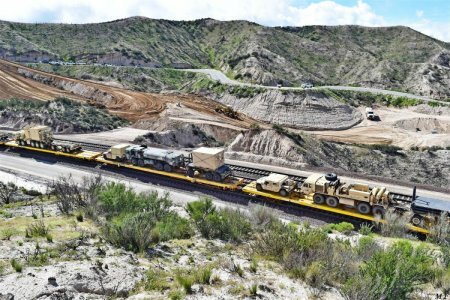 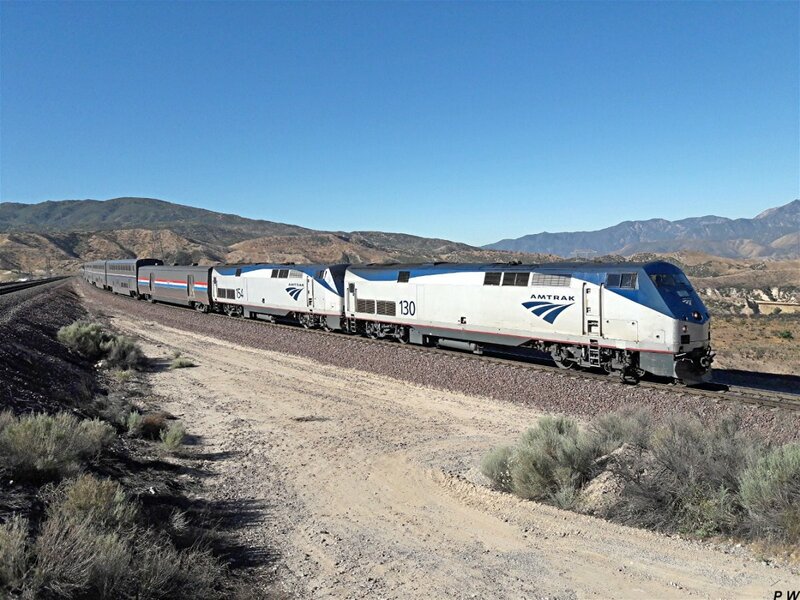 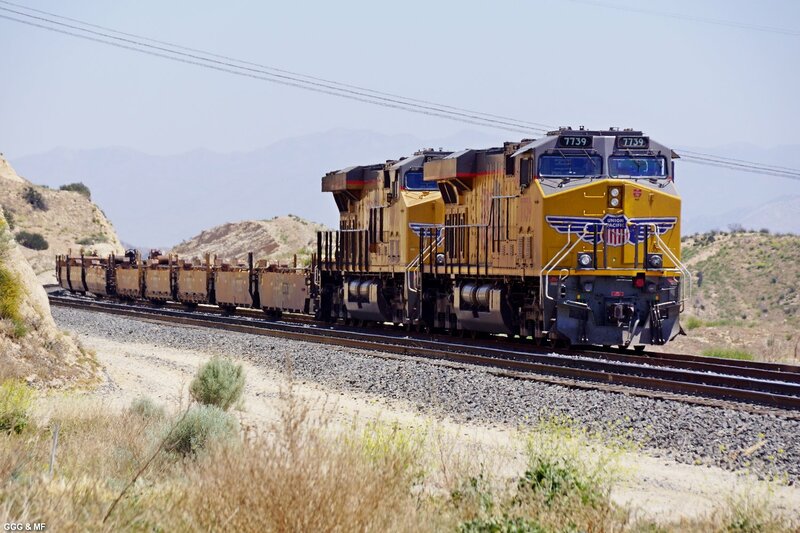 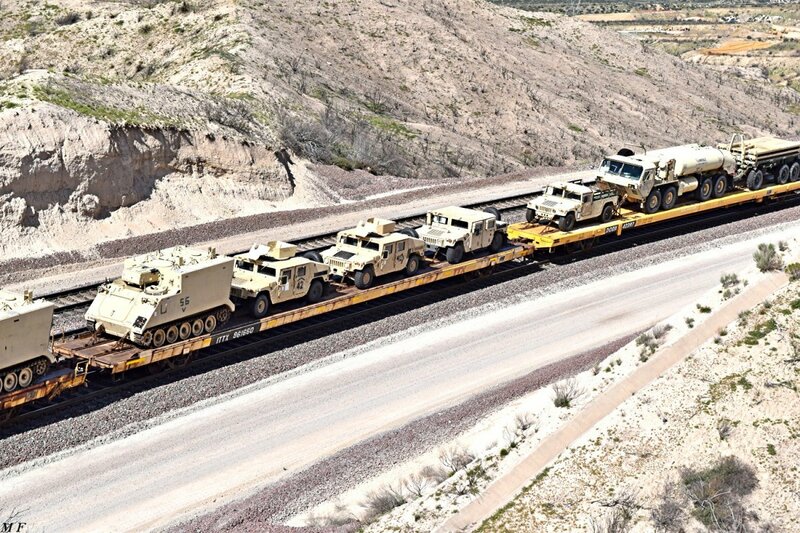 The train, probably headed to Yermo / Ft Irwin, carries equipment of the 3rd Infantry Division including M109A6 155mm Self Propelled Howitzers, M992A3 ammunition support vehicles and various other support vehicles. 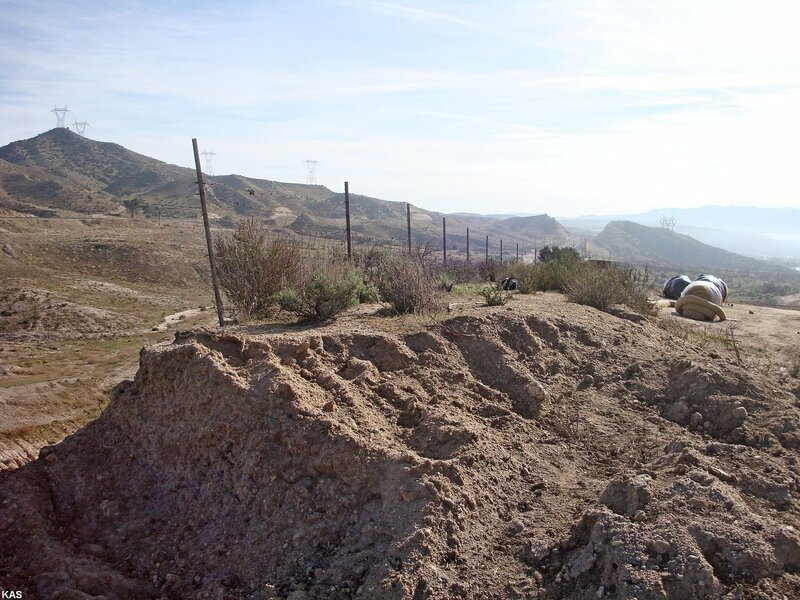 Thanks to US Army Colonel (ret) Chuck Donaldson for his help in ID'ing the military equipment. March 24, 2017: Highway 138 (East) Realignment Project. # 042-045: The machines climb the East slope of the Summit Overlook Hill. 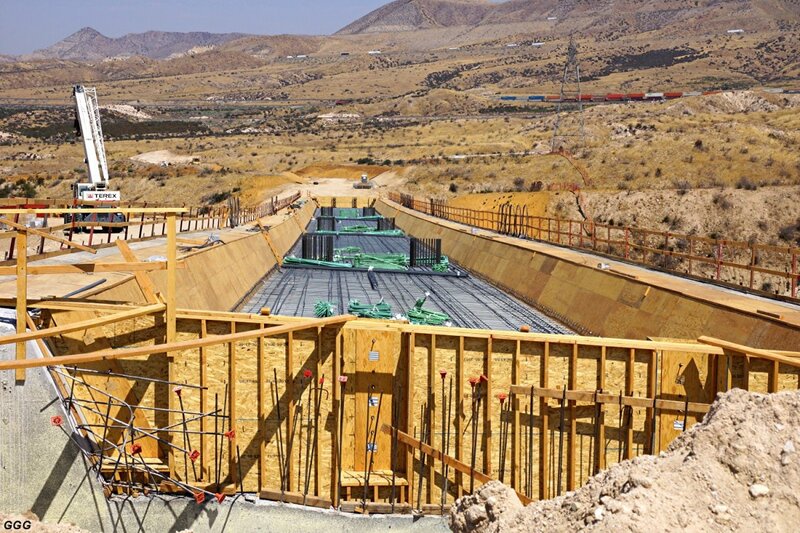 Piers & West abutment for Bridge #3. 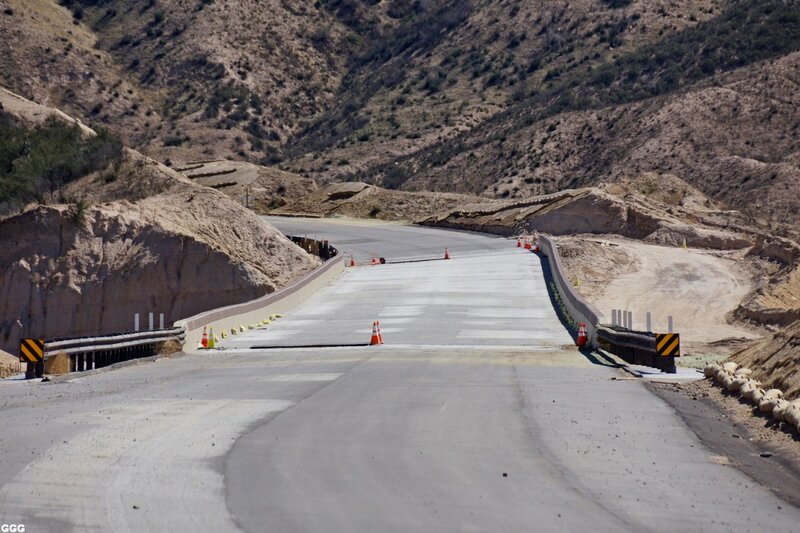 Again, this area will be totally filled- in so that the bridge can be built on solid ground. 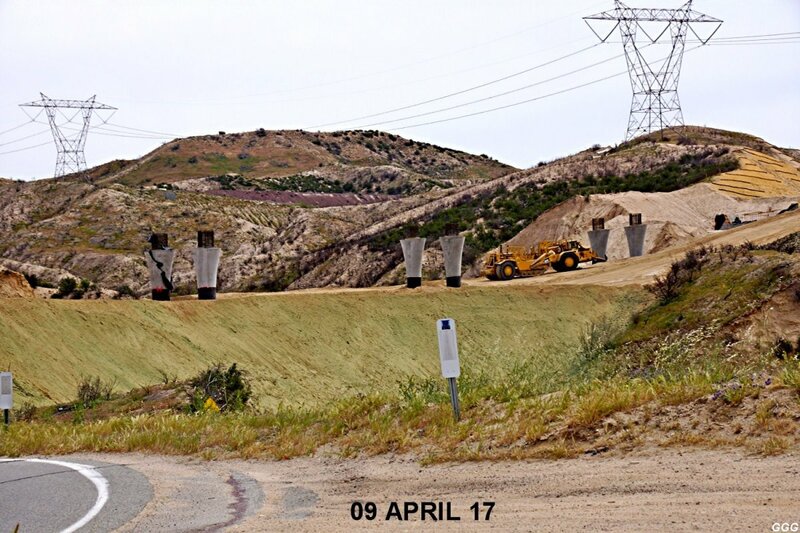 April 2, 2017: Highway 138 (East) Realignment Project. 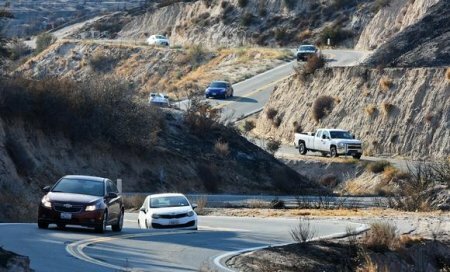 Yes, Highway 138 is open for traffic, again! 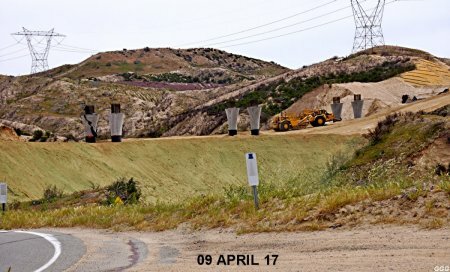 April 9, 2017: Highway 138 (East) Realignment Project. #086 & #087: As reported before, the VERY low areas between the piers of the three new bridges will be built up so that said bridges may be built on solid ground - thus eliminating the need for very expensive supporting structures. 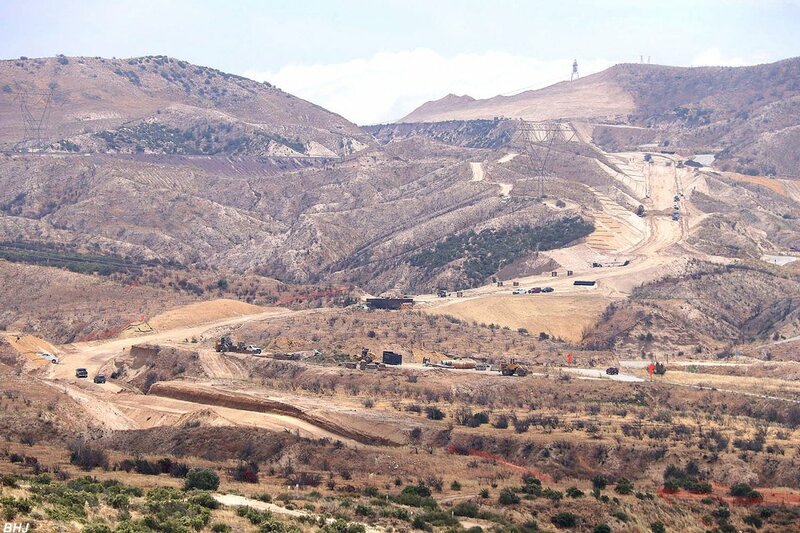 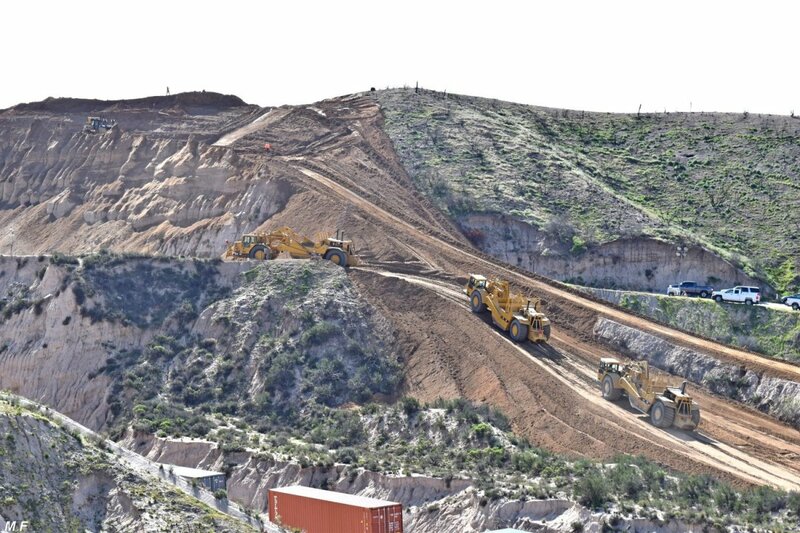 Obviously, the terrain will be returned to its normal contours post construction. 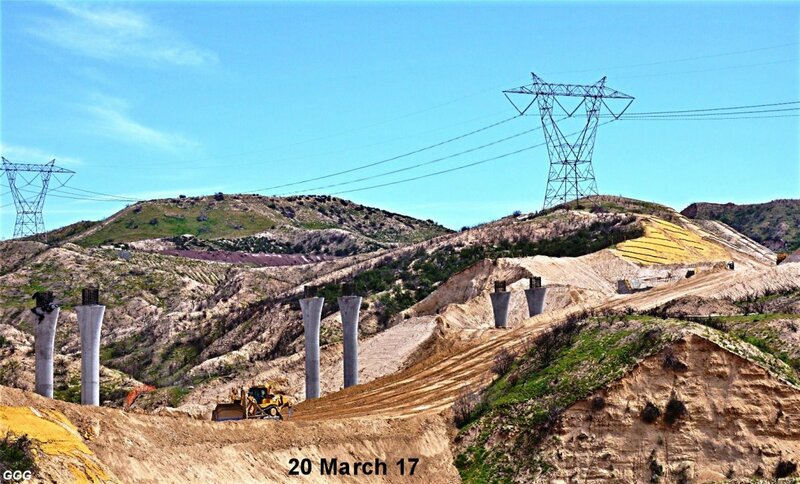 Bridge #3 piers on 20 March and almost buried today. 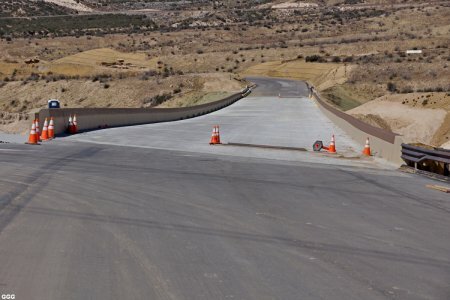 I have been asked, several times, why this very expensive road project is necessary. State Rd (SR) 138, both East & West of I-15, has long been known as "BLOOD ALLEY" for it's numerous accidents and fatalities. 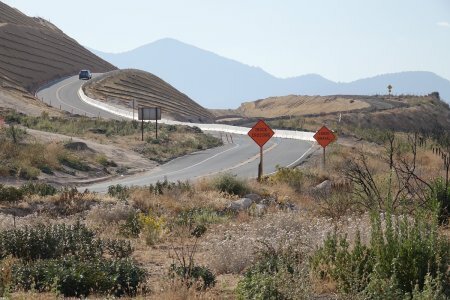 I found a YOU TUBE motorcycle video of the drive between Cajon Summit down to I-15. 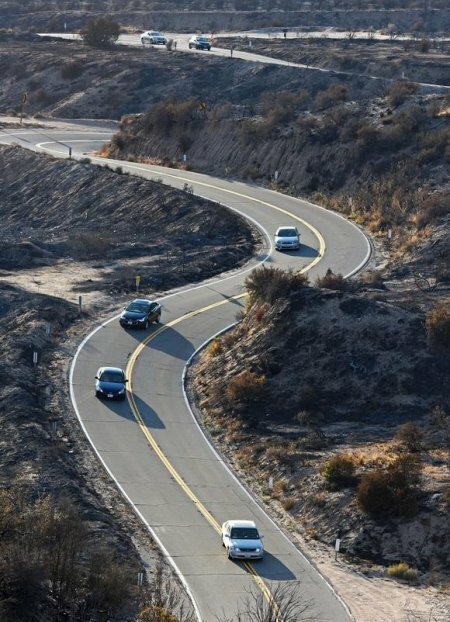 While the drive does not look that bad, remember that SR-138 is very narrow with no escape shoulders and numerous "blind" switchbacks. 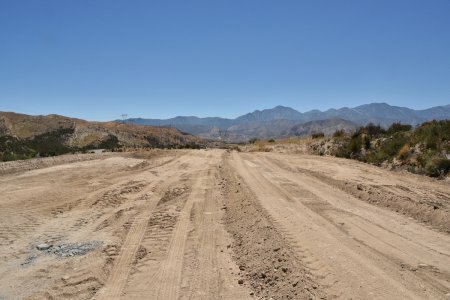 Add in the large number of motor homes & vehicles towing boat trailors to our mountain lakes & parks, and the recipe for disaster is complete. 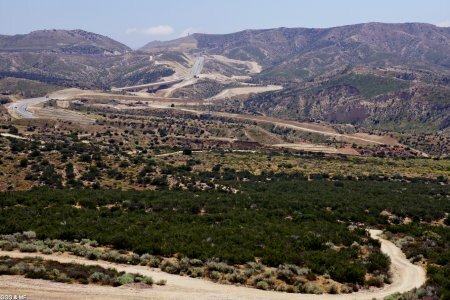 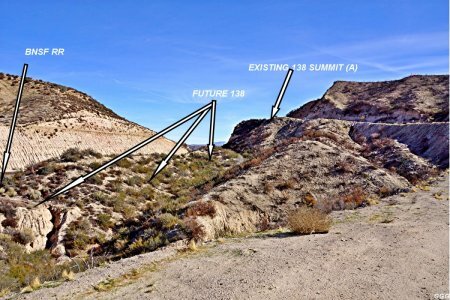 There is a plan to build 13,000+ homes in Cajon Summit Valley --- just East of the Railroad Summit. 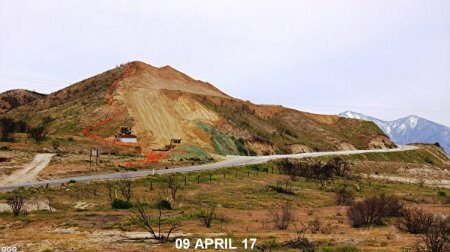 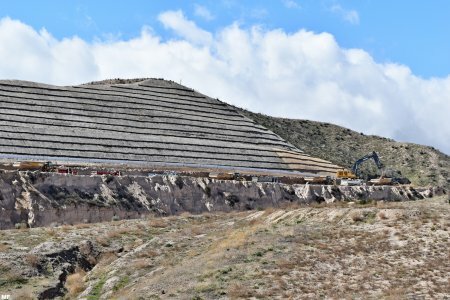 May 6, 2017: Highway 138 (East) Realignment Project - "Hauling out 657 scrapers"
These are the scrapers used on the 138 alignment project - being hauled off to another earth moving project. 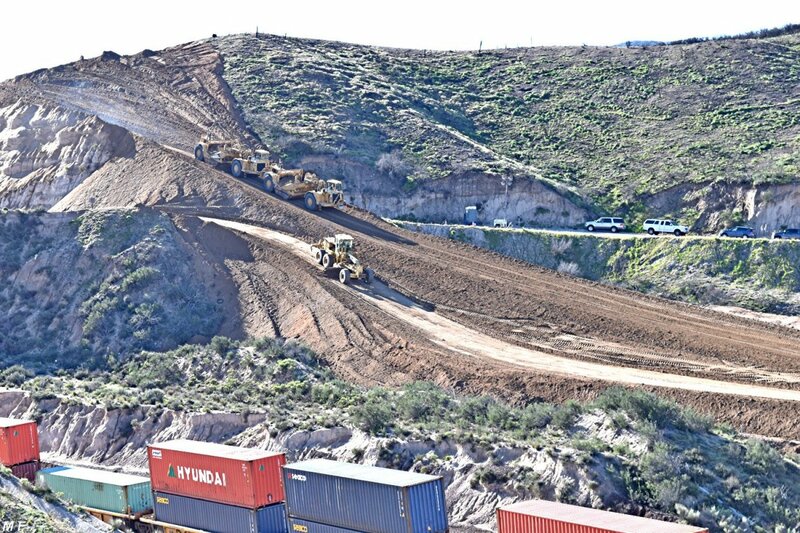 In other words, guess they're finished with the major earth movements on the SR 138 project. 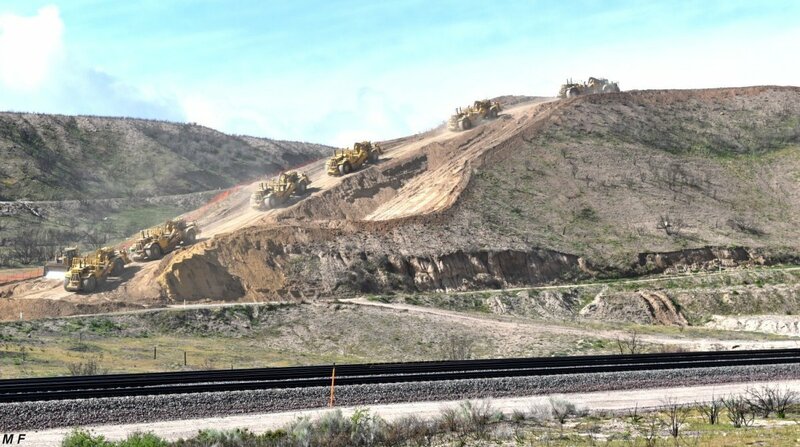 Also nice to see, how these huge trucks are rolling over the temporary pavement connecting old SR 138 section. In the backround we can even see a BNSF EB intermodal train. 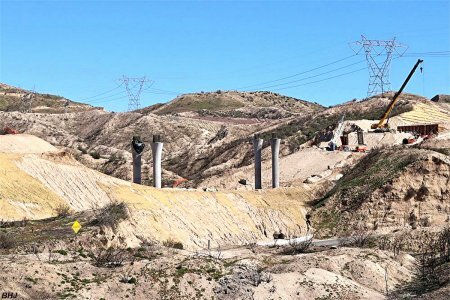 Excellent footage of construction incl. 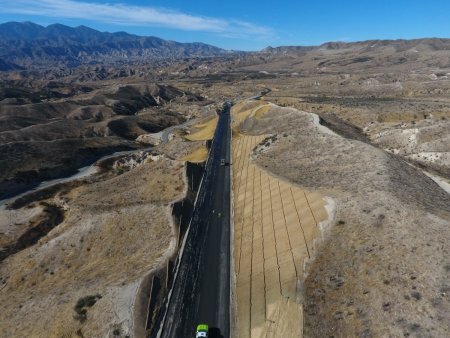 many views from drone by Caltrans. 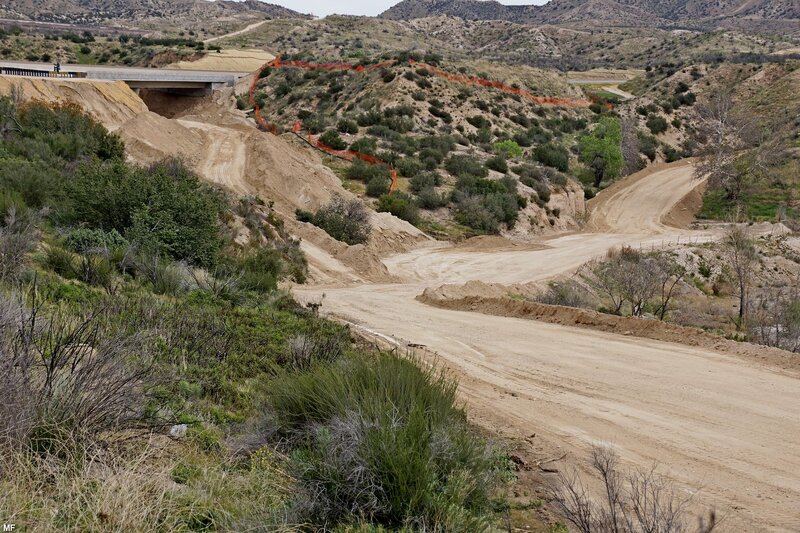 Here are a few of the Hwy 138 project from Hill 582 when Spike and I (Bruce "Doc" Jones) were there on May 10. 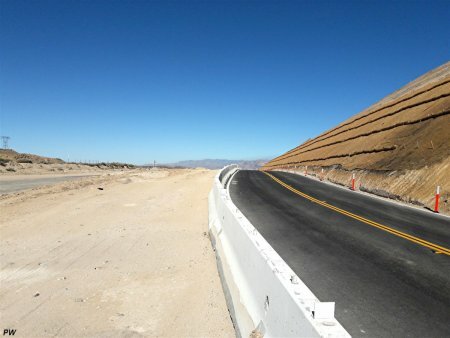 It shows a different more general perspective of where the road is going to go. Note the bridge construction and the path of the old Hwy 138 up the hill toward the Summit Overlook. 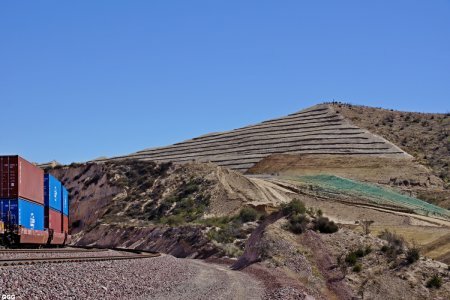 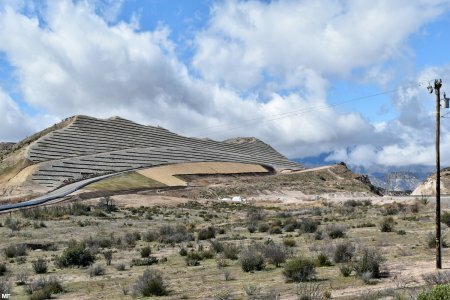 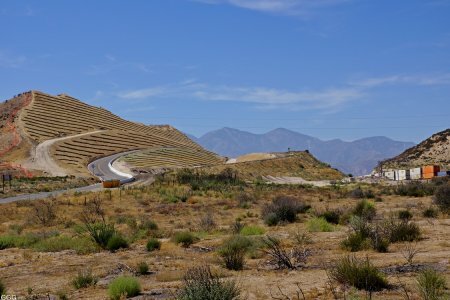 #104-105: Looking across SR 138, from the Cajon Summit Observation area, the double terracing of the Summit Hill can be seen. 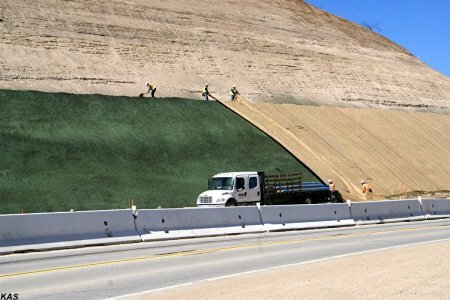 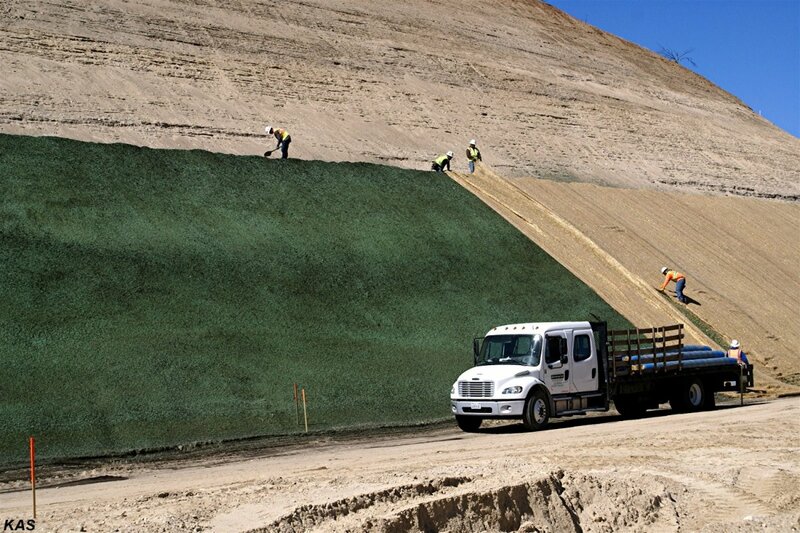 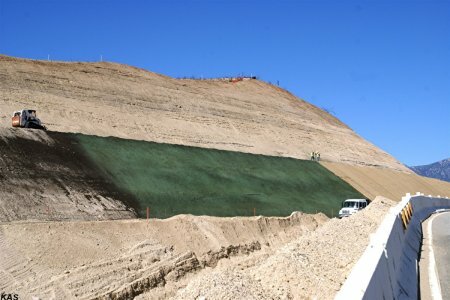 The crews are installing a green mesh, probably infused with the seeds of native desert plants, to battle the inevitable future erosion. 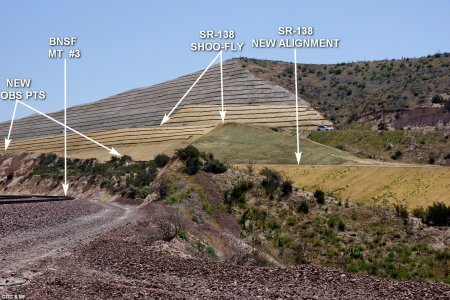 #106-108: With the existing SR 138 on the upper right, it APPEARS ??? the new SR 138 alignment will be BETWEEN the old SR 138 Road /Summit Observation area and Summit Hill. 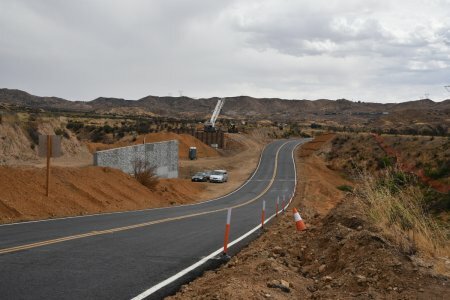 Last SUNDAY (5/28/17), Marc & I decided to do a an in-depth trip to document progress on the SR-138 realignment project. 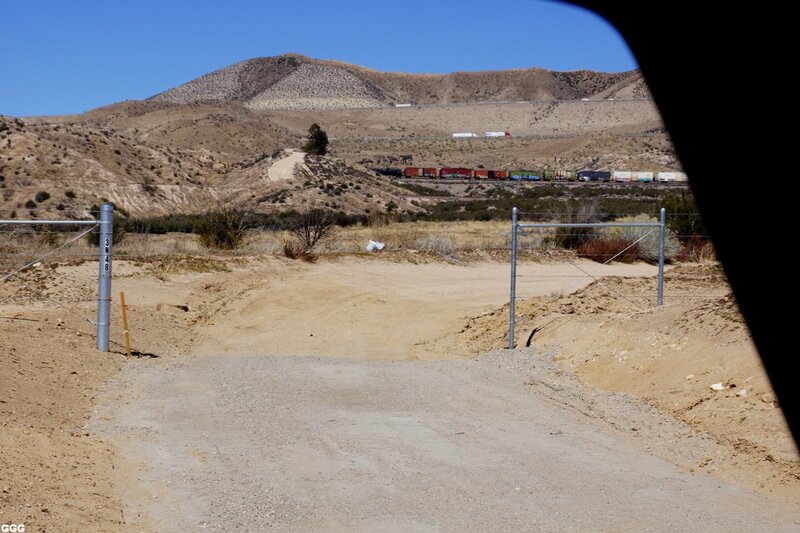 With MAD MARC driving, I never know where I will wind up --- but it's always a fun adventure!!! 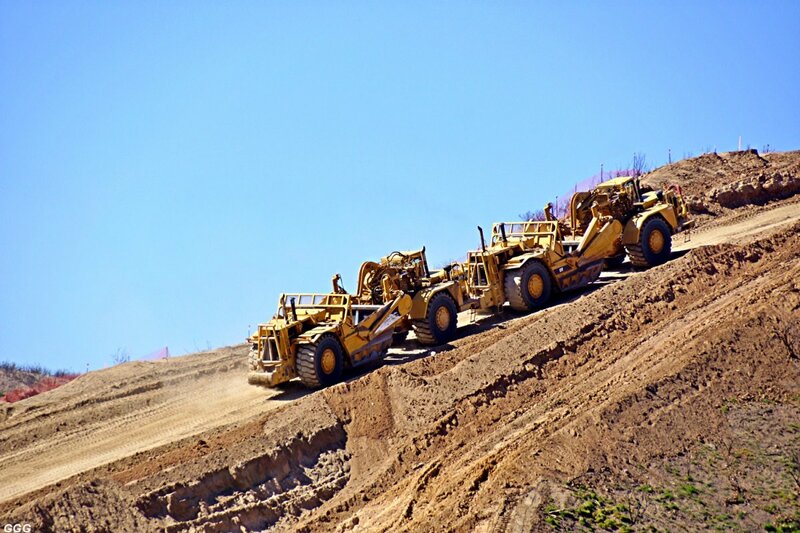 Being a Sunday and a NON-work day, we were somewhat confident about not being flattened by some HUGE earth mover. #114 & #115 Using the UPRR / USFS road from Oak Hills to Summit, we caught BNSF 5390 WB heading down the hill. #122 & #123 Bridge #2 looking West. 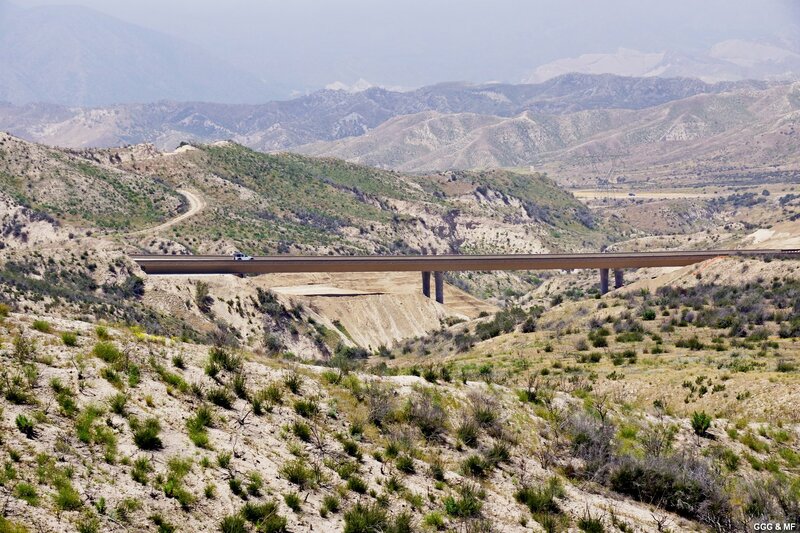 We have been asked why we take no pictures of bridges #1 or #2. 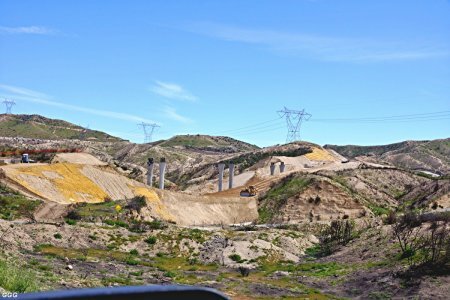 After an "INTERESTING" MAD MARC DEMOLITION DERBY DRIVE (on what's left of Pipeline Road), we could finally see the Bridge #2 area. Obviously, we normally can't use the one construction access road from SR-138 nor the new alignment thus making photography of Bridges #1 & #2 near impossible. 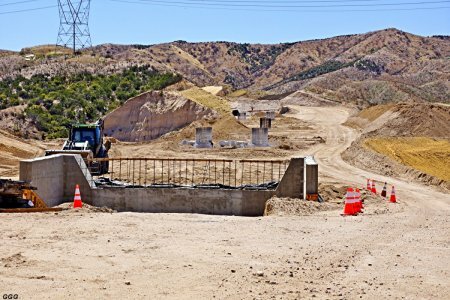 GGG 5/28/17 Bridge #3, looking East, from the new SR-138 alignment. 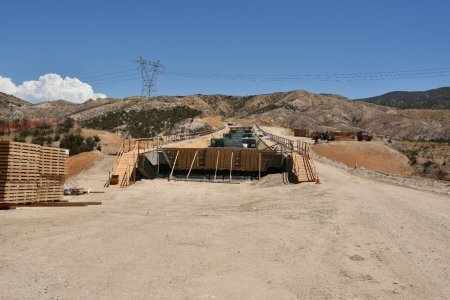 124 GGG 5/28/17 Bridge #3, looking East, from the new SR-138 alignment. 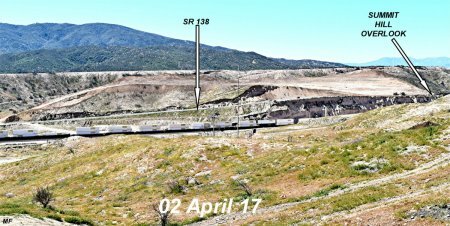 #128: From Right to Left---The new TEMPORARY SR 138, "K rails", the OLD 138 and the OLD Summit Observation area. 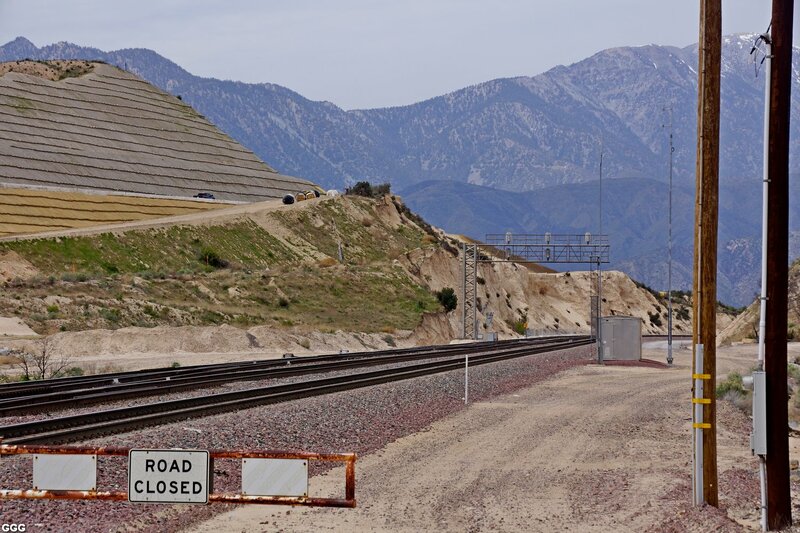 We UNDERSTAND the area left of the "K rails" will be lowered to near track level and will hold the FINAL SR-138 alignment ???? 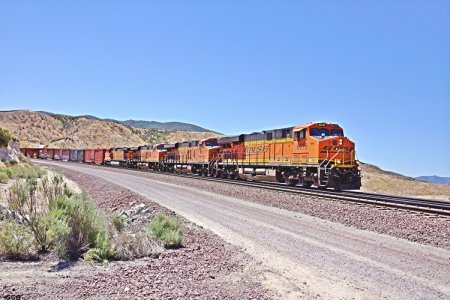 PW 6/27/17 Bridge # 3 under construction - 132 PW 6/27/17 I'm told that Paul "let Bob outta his cage for this picture"
#134: BNSF 3816 leads a very late AMT #3 West, past West Summit Island. 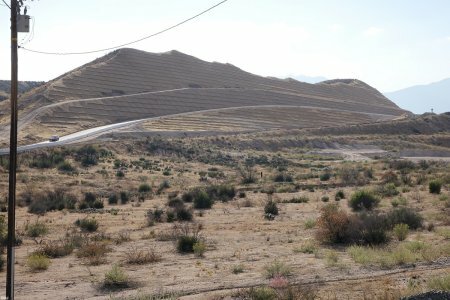 Yesterday (07-16-17) was HOT, HUMID (for here), and SMOKEY (from all of the CA fires). 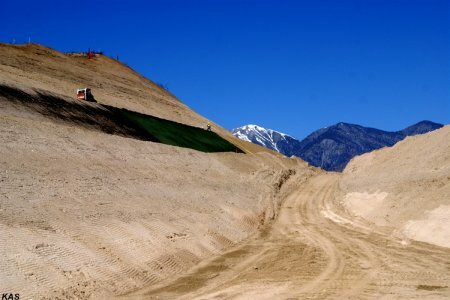 However Marc & I braved??? the Cajon weather to collect the attached. 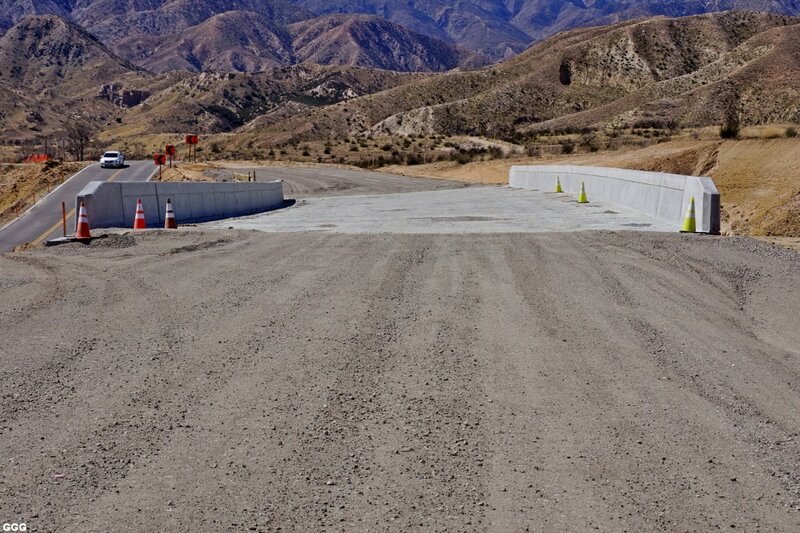 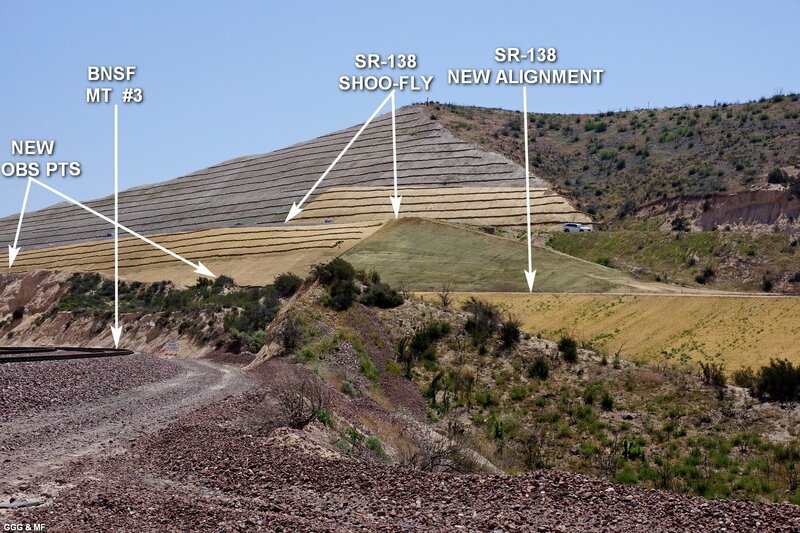 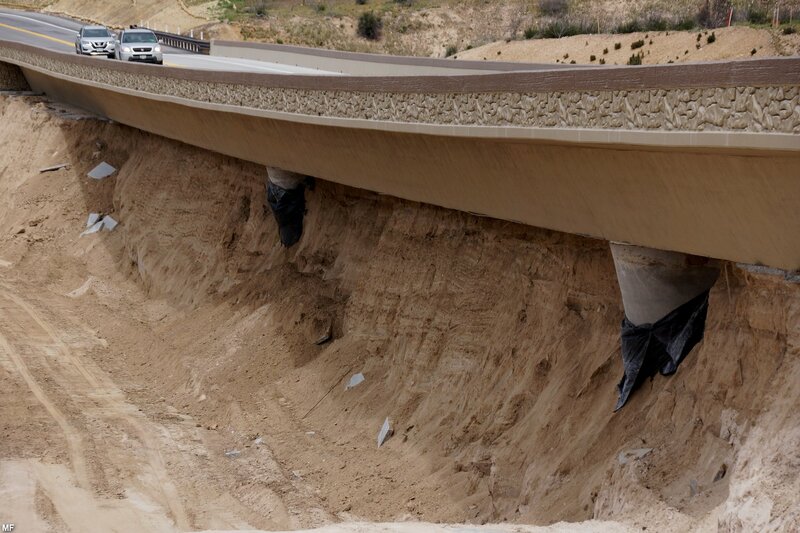 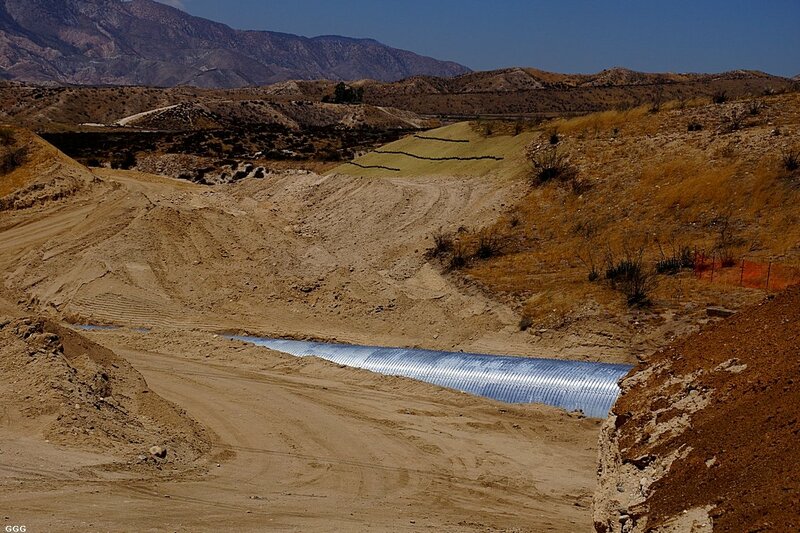 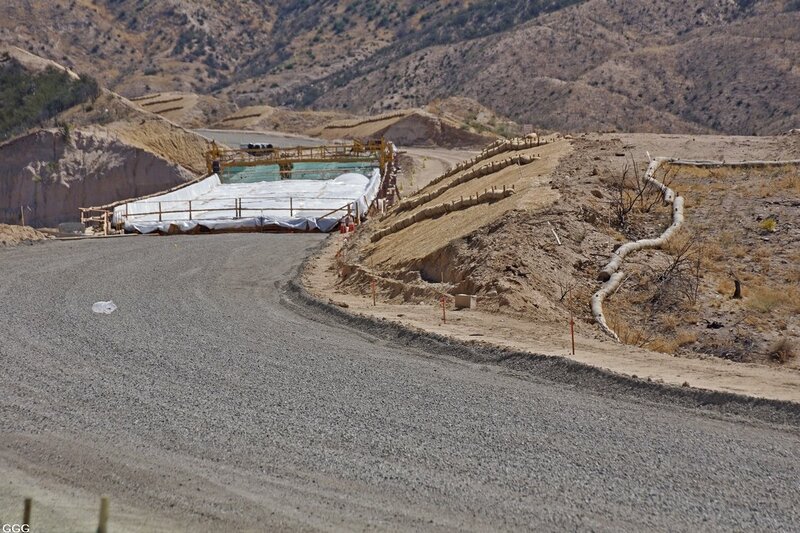 # 146: The contractor has built an SHOO FLY to allow realignment of SR-138 to continue. 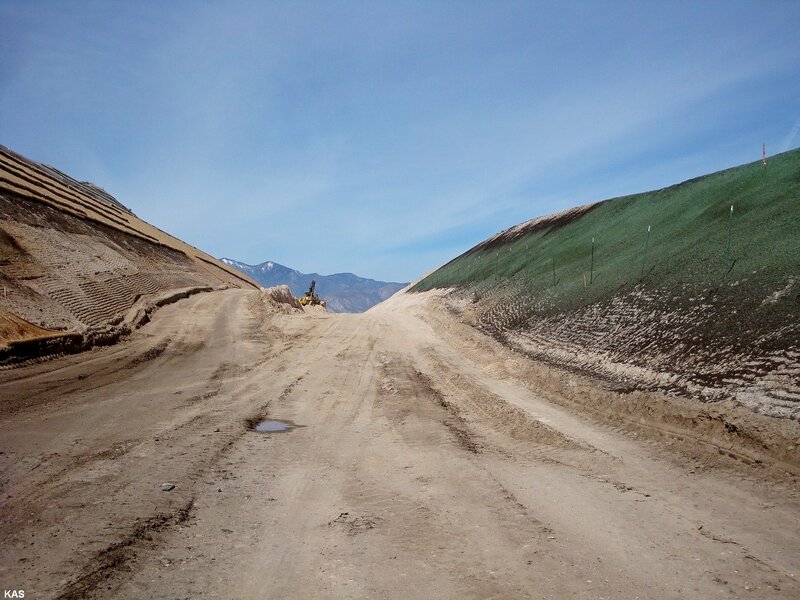 Between the OLD & NEW 138 alignments, a trench is being dug which will hold the SR-138 final alignment. 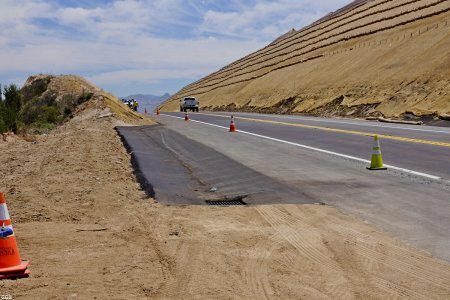 The asphalt has been removed from the old 138. 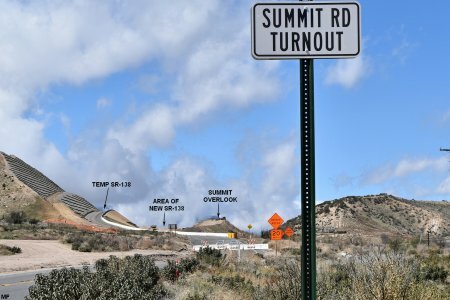 It is unknown, to us, exactly what the fate of the old Summit overlook will be. 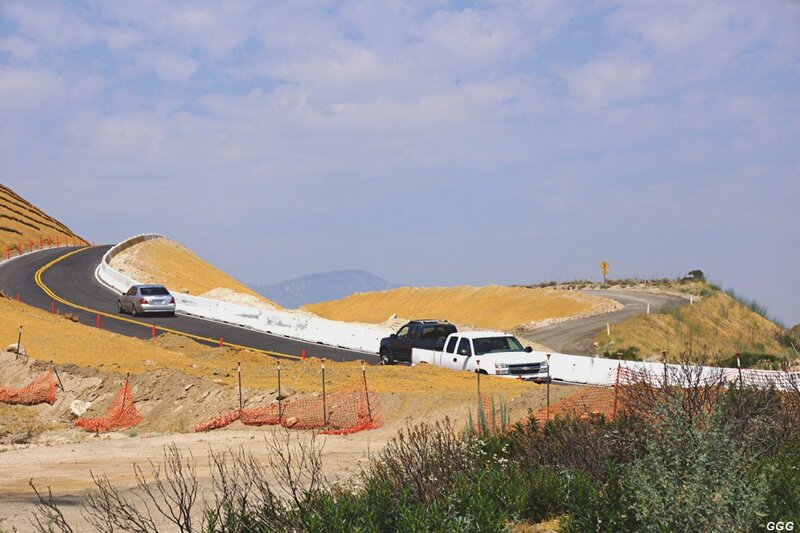 # 147: From the East end of Summit Hill, the new temporary & old SR-138 alignments are visible. Marc & I visited DET on Hill 582 yesterday (Friday). 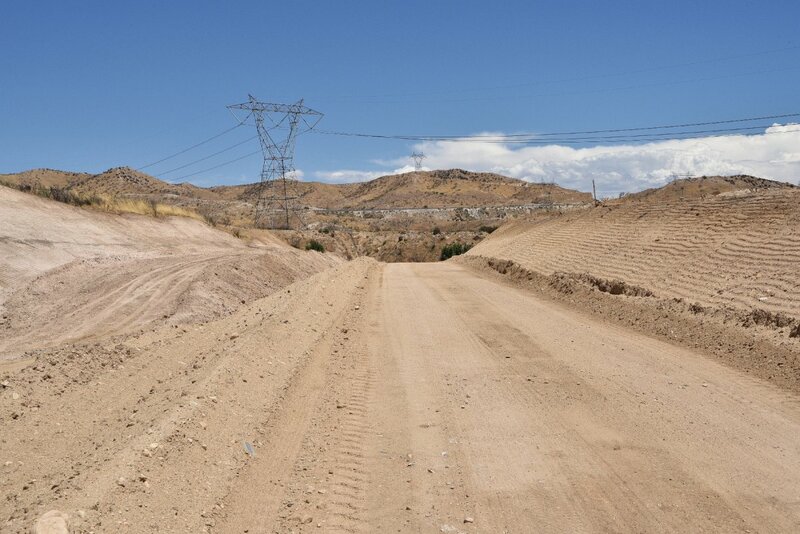 We also checked out the SR 138 realignment project, but found little progress to report. 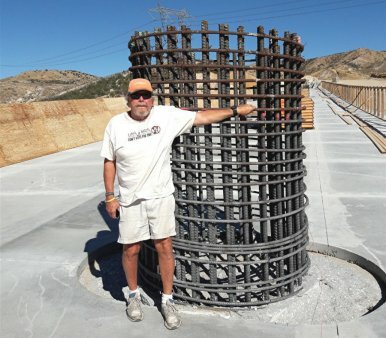 A while back, Bob Widholm (San Diego) camped on West Summit Island for several days. 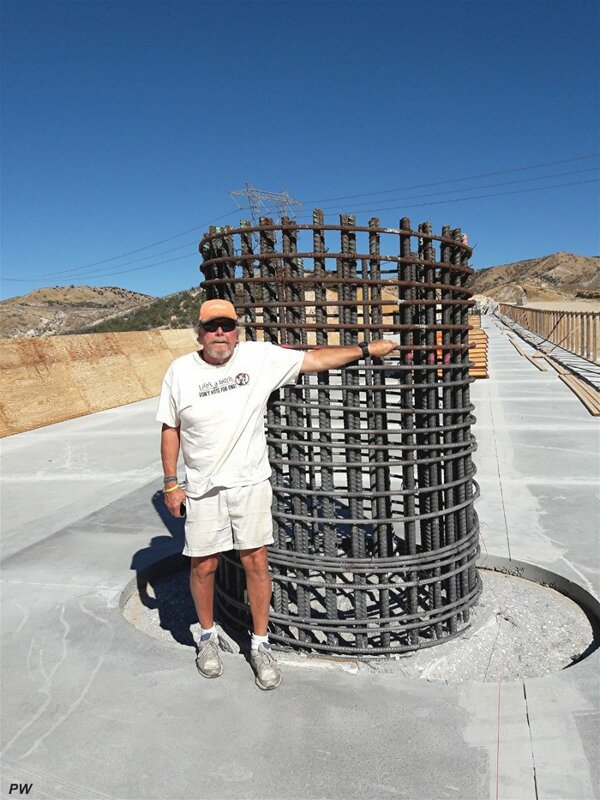 He was joined by Paul Westover (California City) and Lois M. (Hemet) ----- together, they explored the SR 138 Realignment Project. 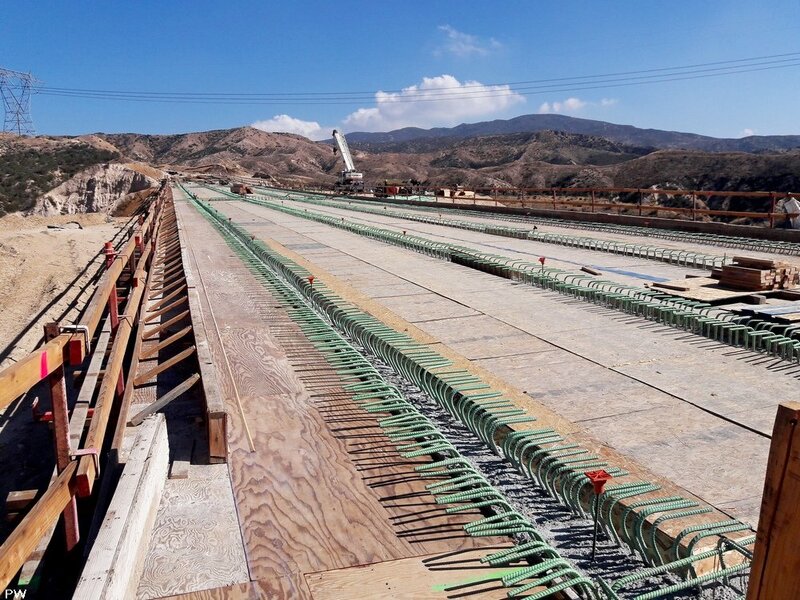 Current contractor efforts appear to be centered on finishing the three bridges. 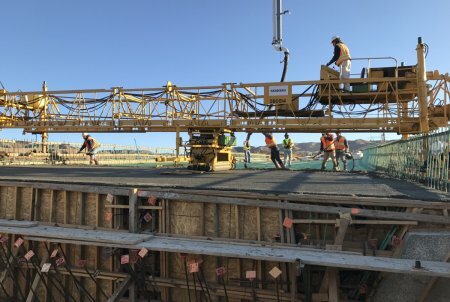 Excellent footage of the construction of a concrete bridge by Caltrans. 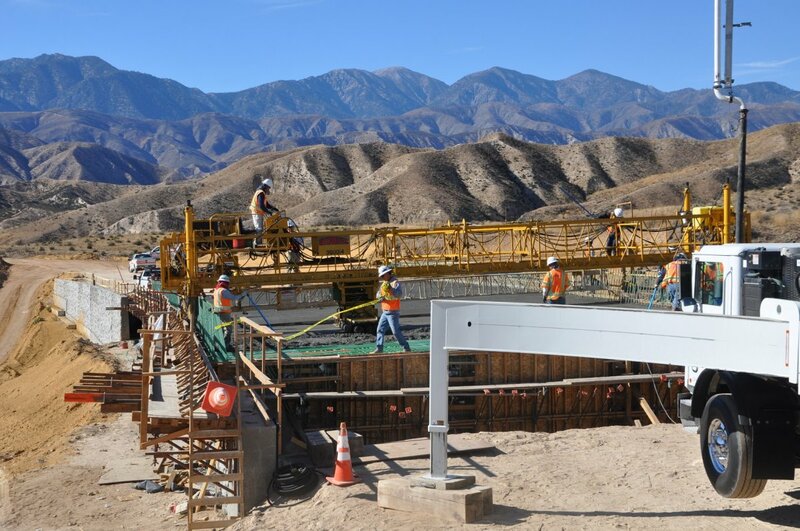 These photos are corresponding to the video about bridge # 1 construction applying concrete. 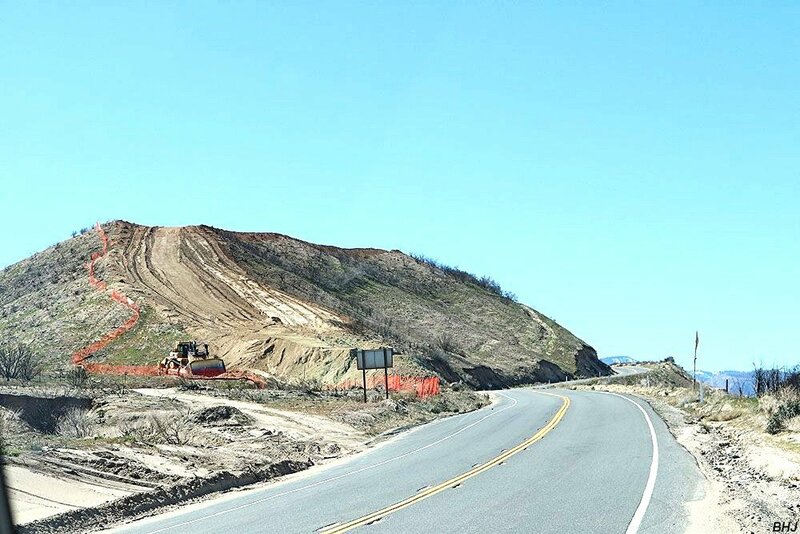 SR-138 will be closed between Interstate 15 and Summit Valley Road on Wednesday, March 7th at 6:00 a.m. until Saturday, March 17th at 6:00 a.m. 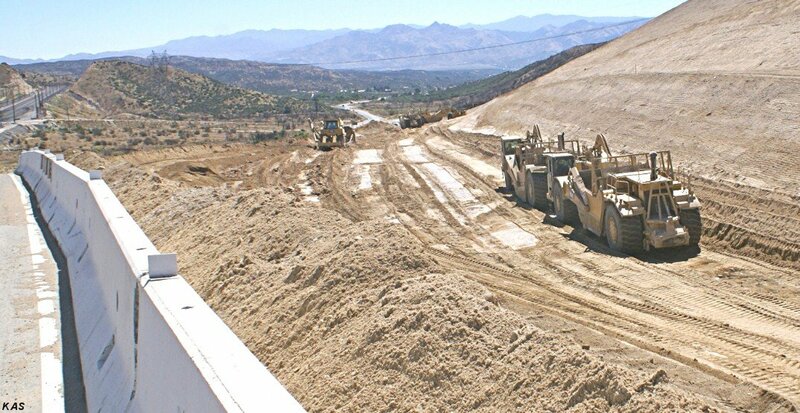 The closure is necessary to complete pavement realignment work. GGG 3/04/18 Parker Ranch Rd (the normal access to Hill 582) with Hill 582 in the distance. There have been questions as to a gate being erected at this spot, however since the USFS has elected to number the road 3N48, we HOPE that the road will remain open to the public. 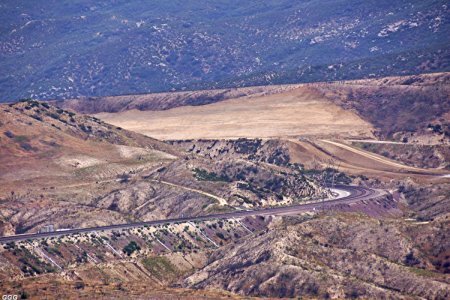 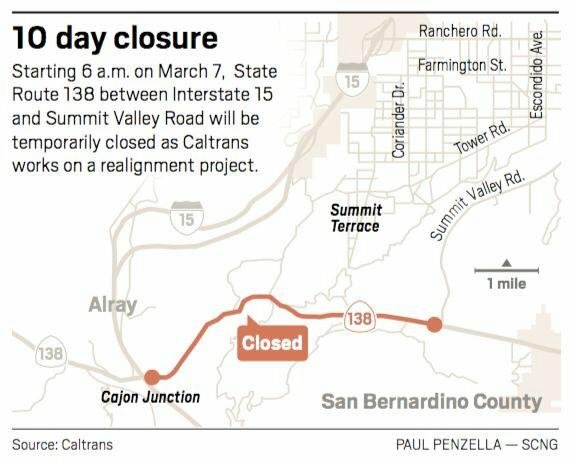 The 10 day closure of SR-138 between I-15 and Post Office Rd (just East of Cajon Summit) is due to end on 03-17-18. It is our understanding that the closure was called to allow the contractor to cut the new SR-138 Summit alignment down to final grade. 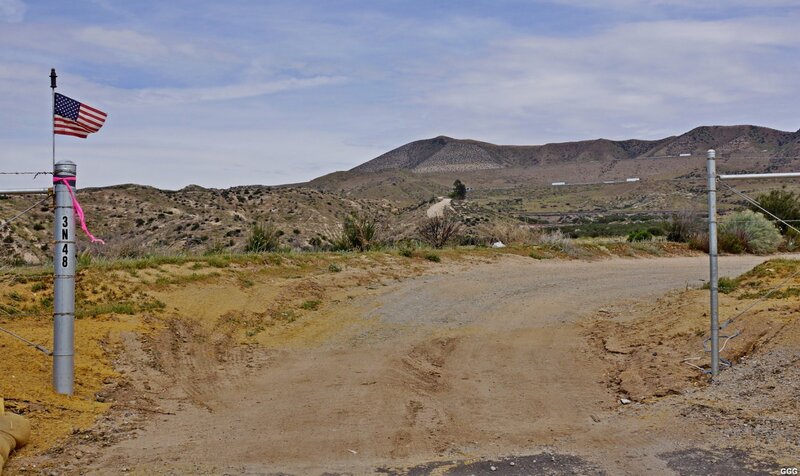 Photo # 204 Labeled view of the project --- Evidently the Rd from SR-138 up to the BNSF Summit crossing is no longer called POST OFFICE Rd or THE SUMMIT TRUCK TRAIL. 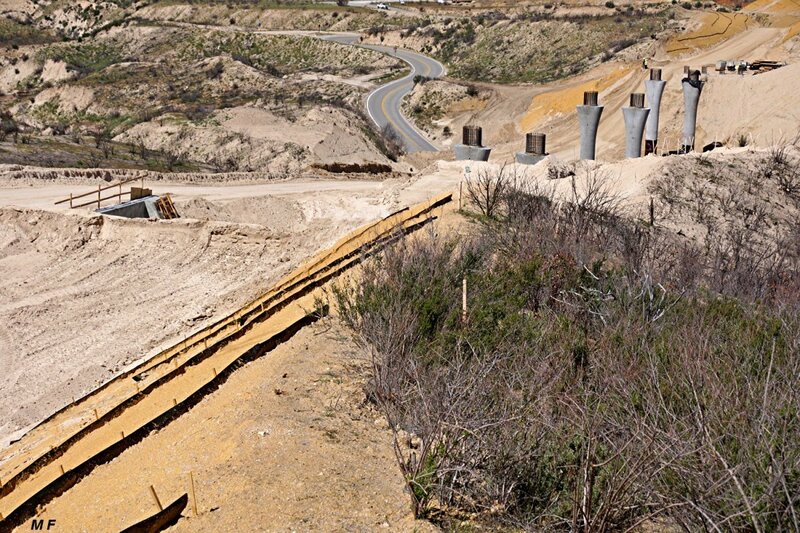 Also, it APPEARS that the Summit Overlook area has been preserved (at least for now). 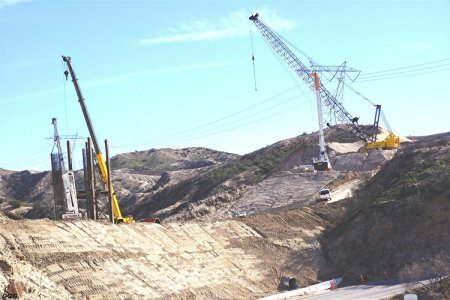 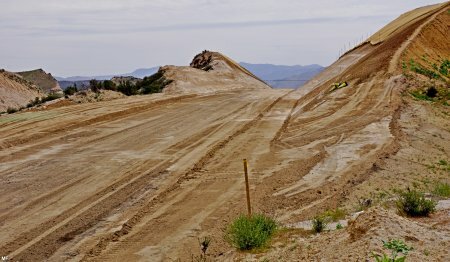 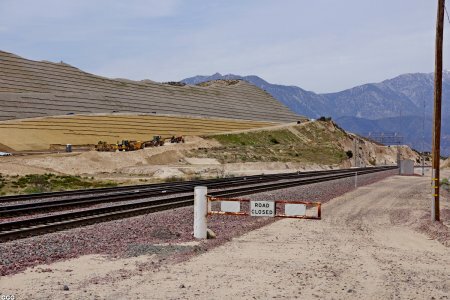 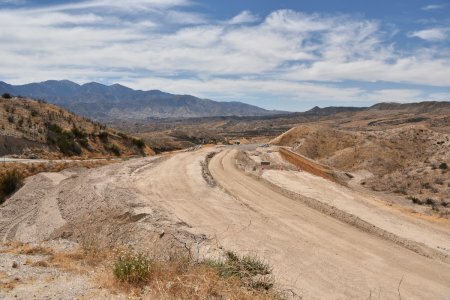 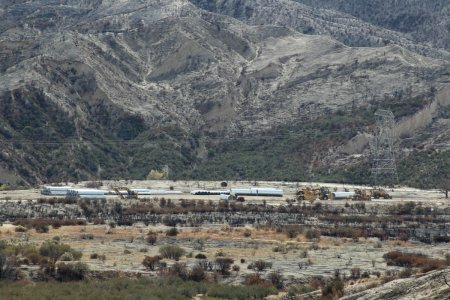 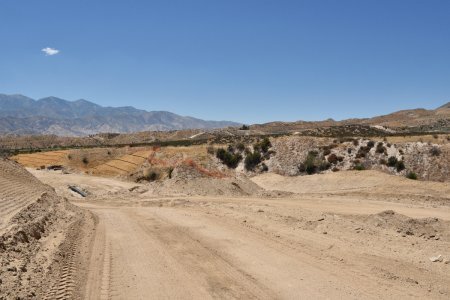 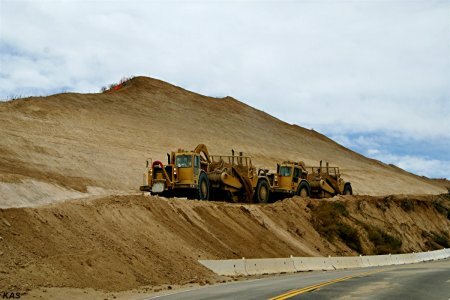 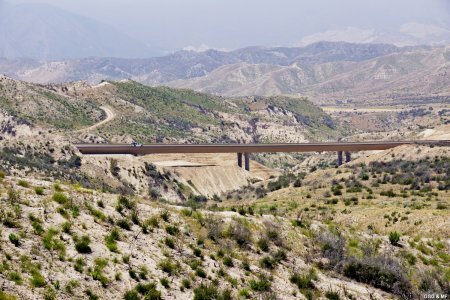 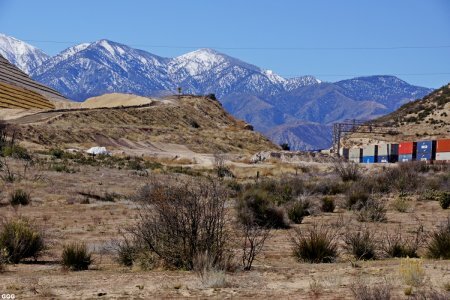 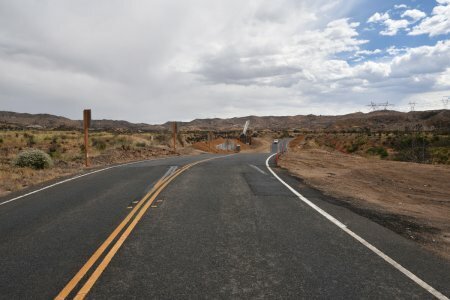 SAN BERNARDINO, Calif. (VVNG.com) — The California Department of Transportation (Caltrans) announced Friday, the full closure of SR-138 has been extended due to recent rainstorms. 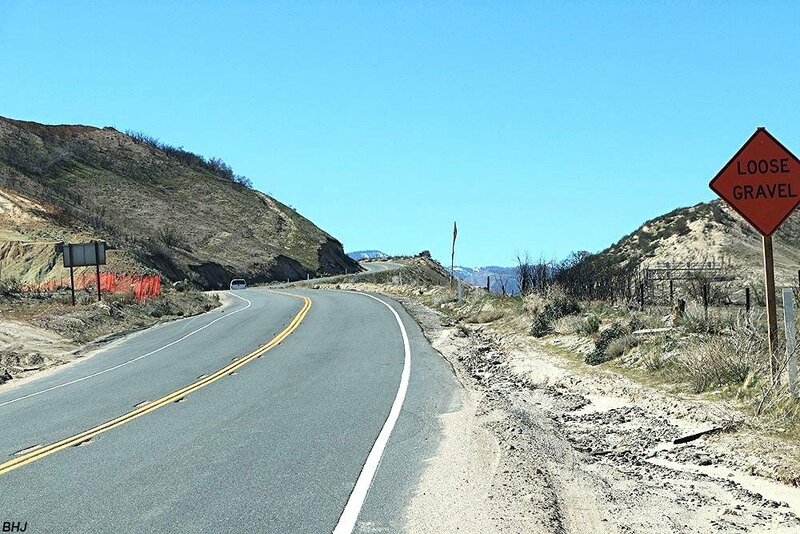 SR-138 will remain closed between Interstate 15 and Summit Valley Road until Friday, March 23rd at 6:00 p.m., Caltrans officials announced. Aerial photo taken March 2018 showing the current progress of the SR-138 realignment project. 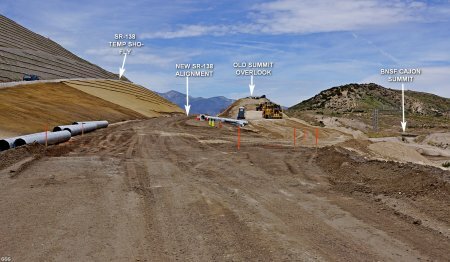 Please note: Even most of the realignment road is in service, there is a section at Summit (red/yellow) not finished, yet! 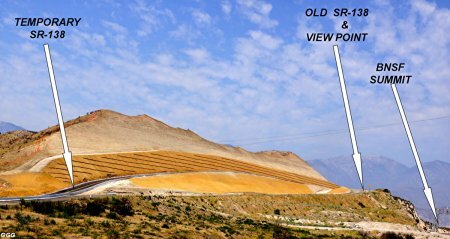 You, may notice on the video below - as we can see the old part still in use just below Summit. 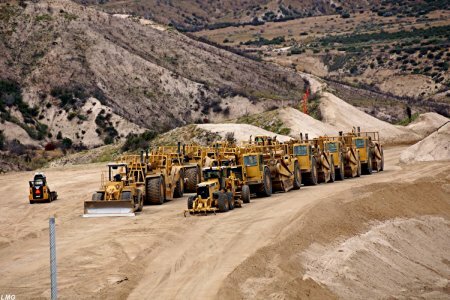 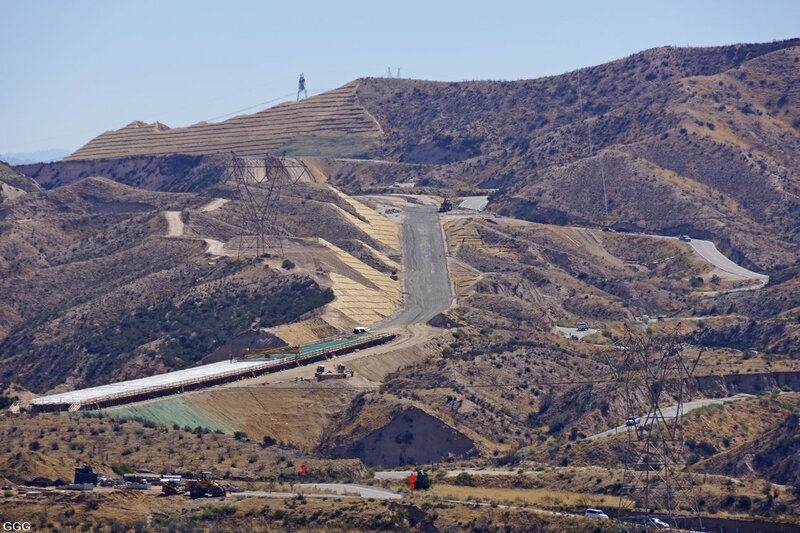 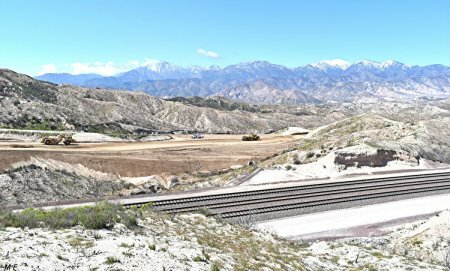 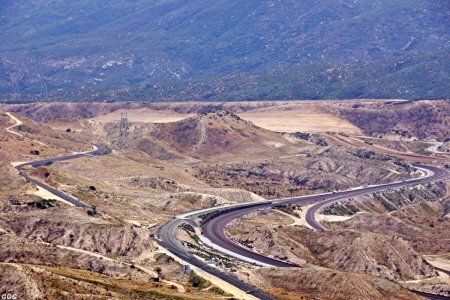 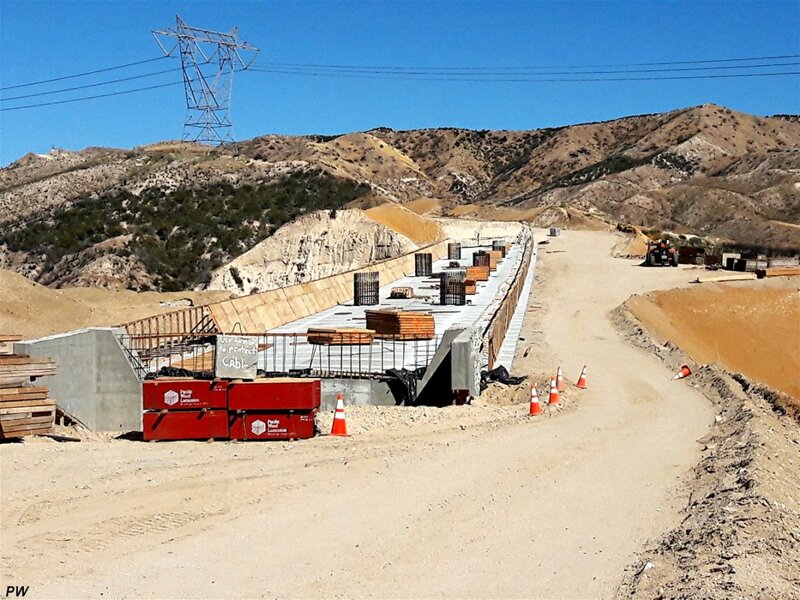 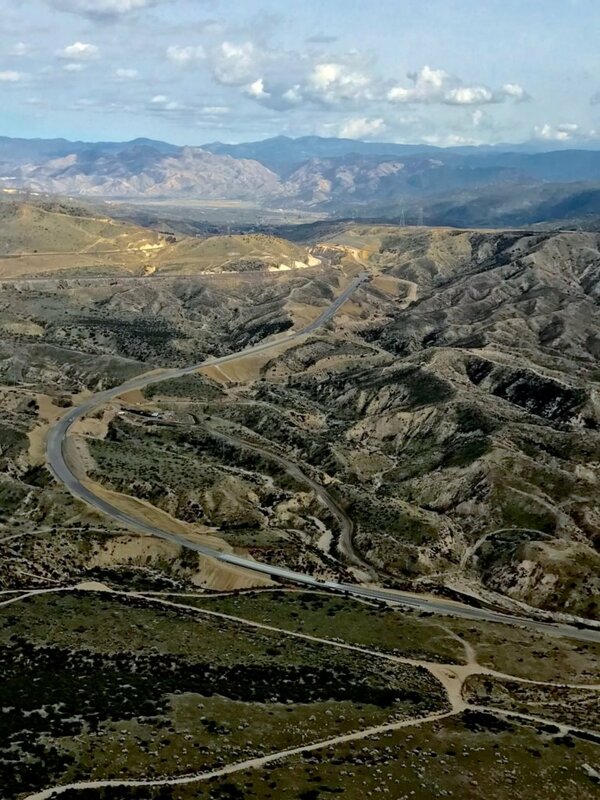 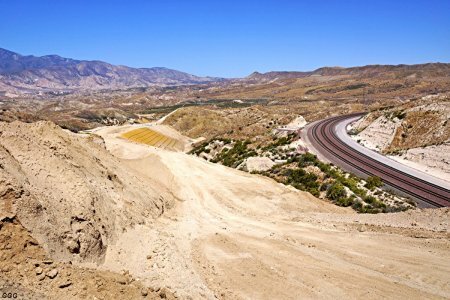 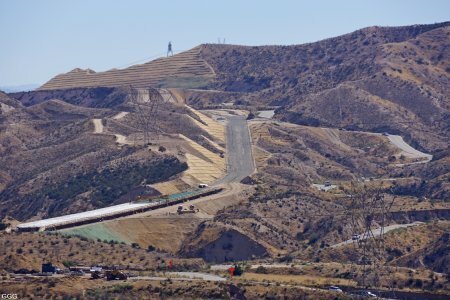 Cajon Pass, CA - On Saturday March 24th 2018 Driving east bound on the NEW Realignment Project on State Route 138 east of Interstate 15 freeway. 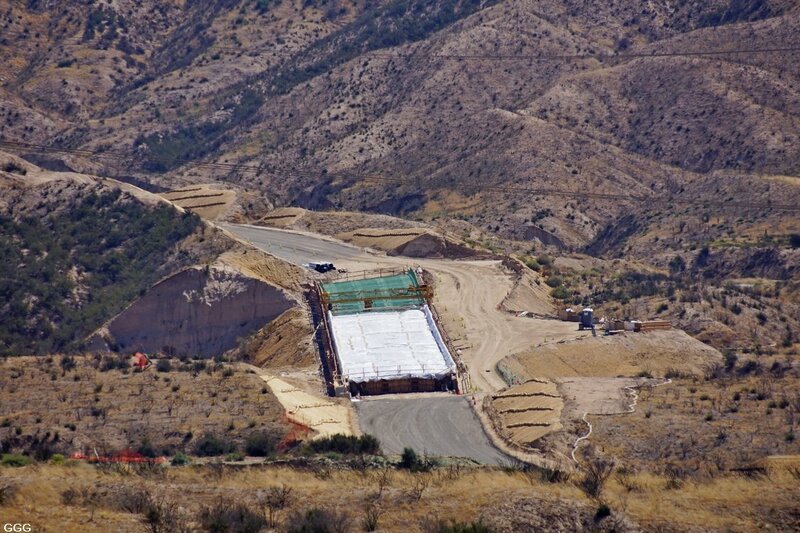 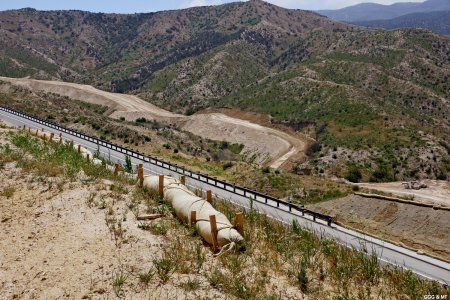 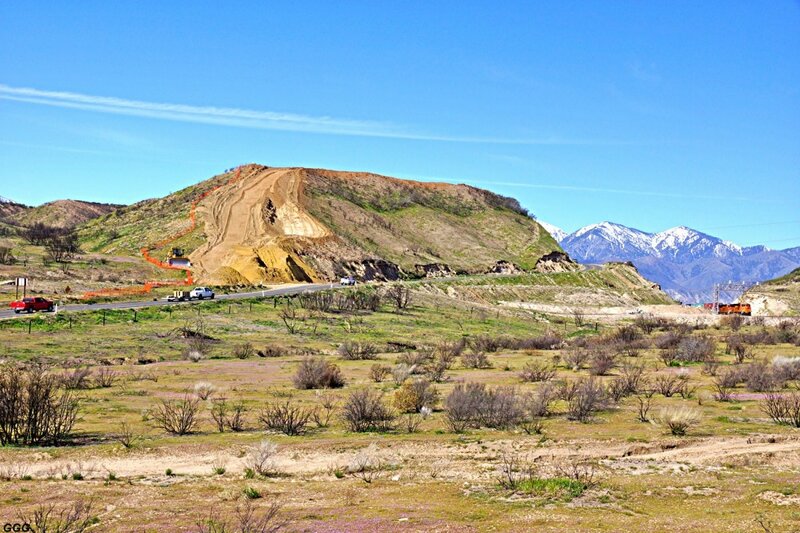 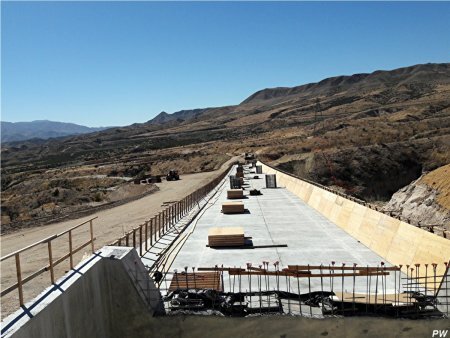 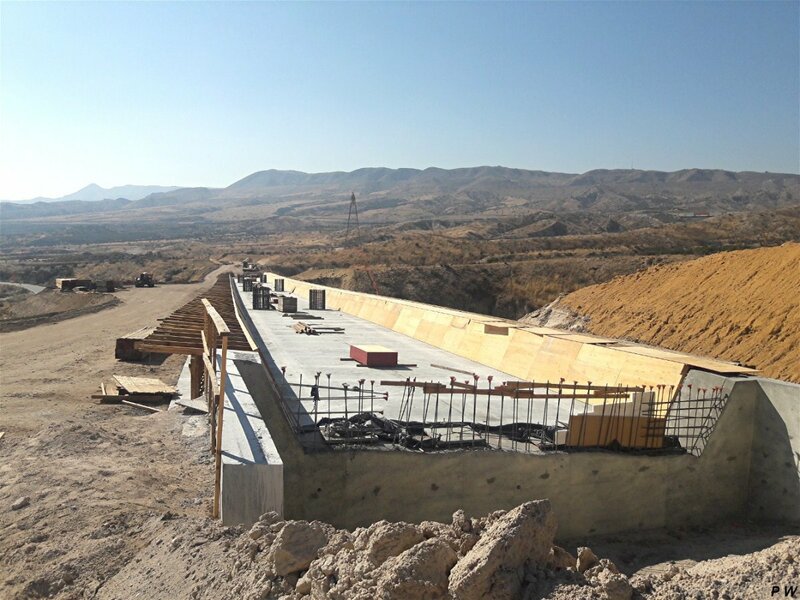 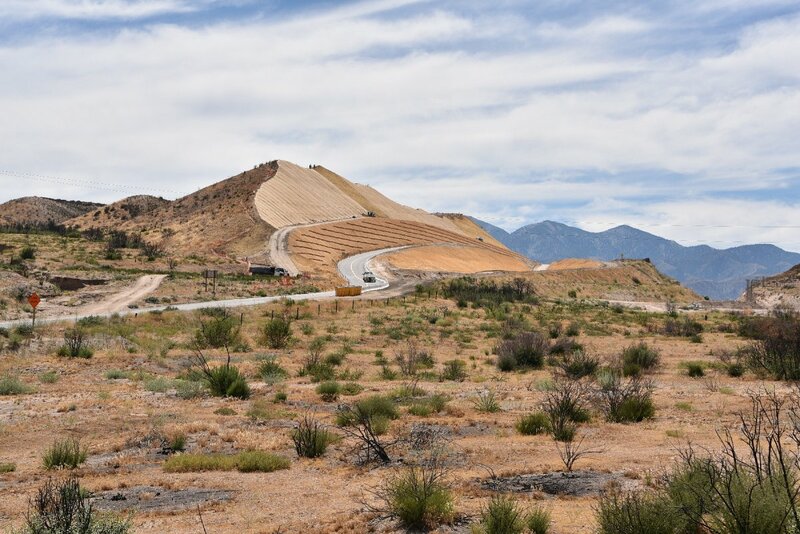 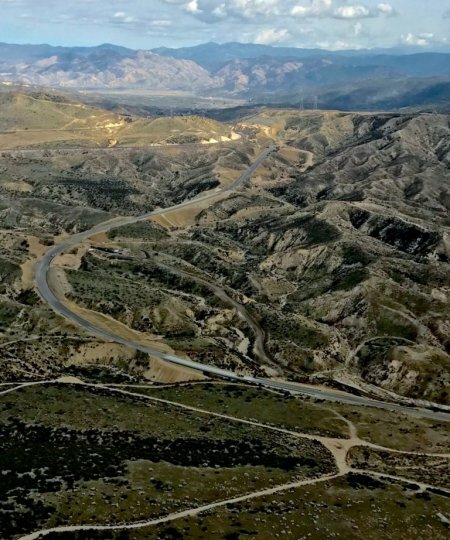 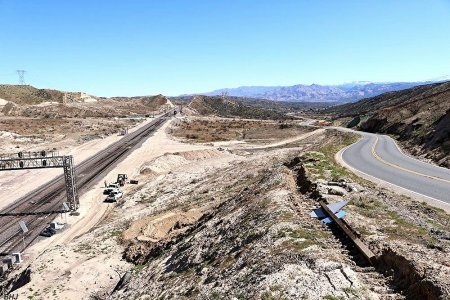 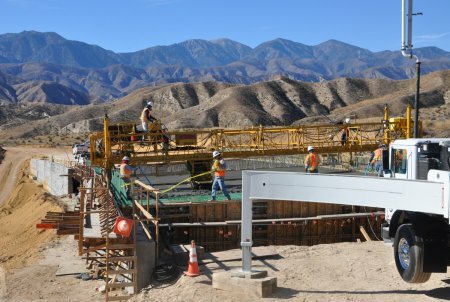 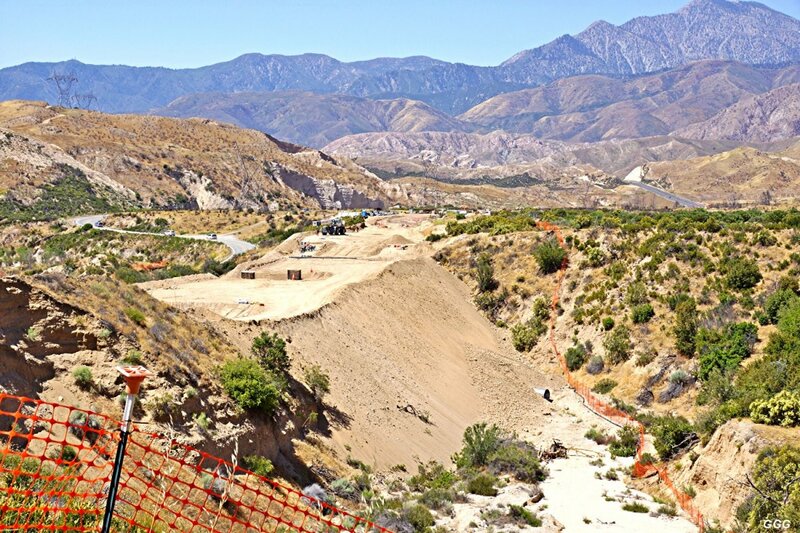 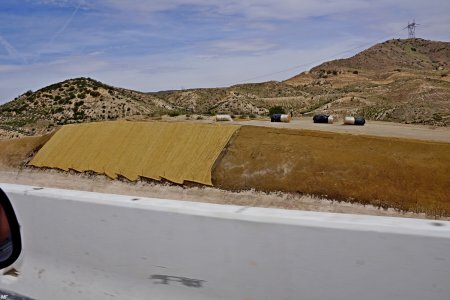 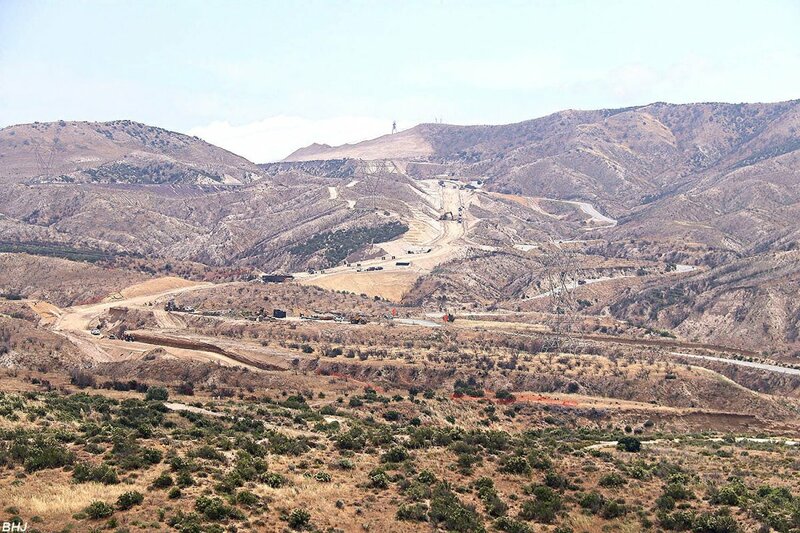 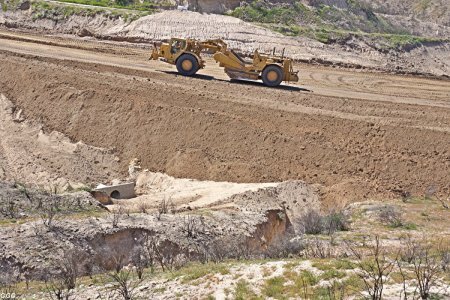 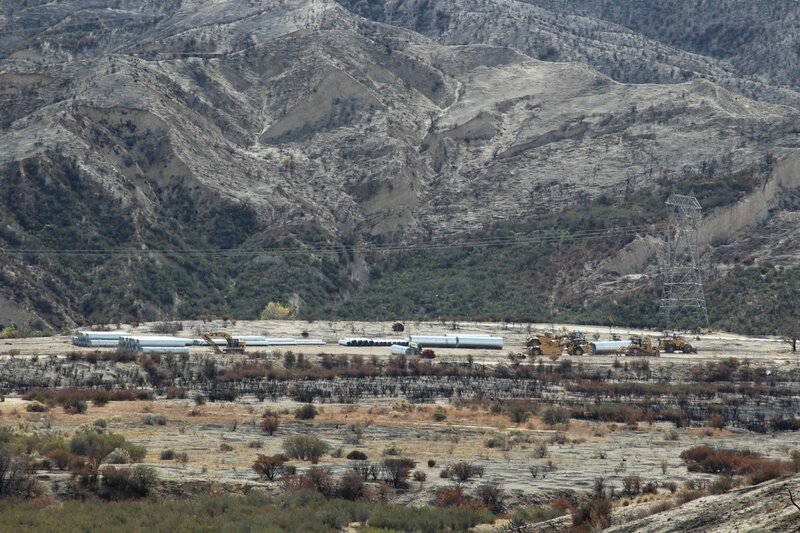 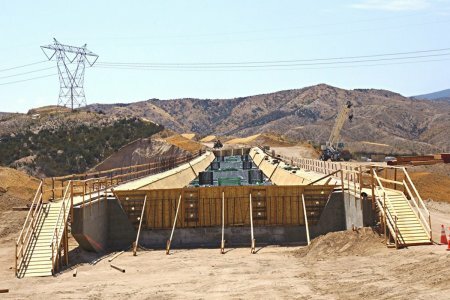 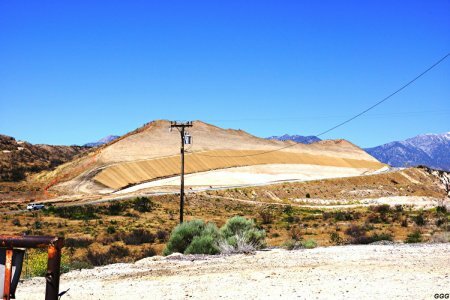 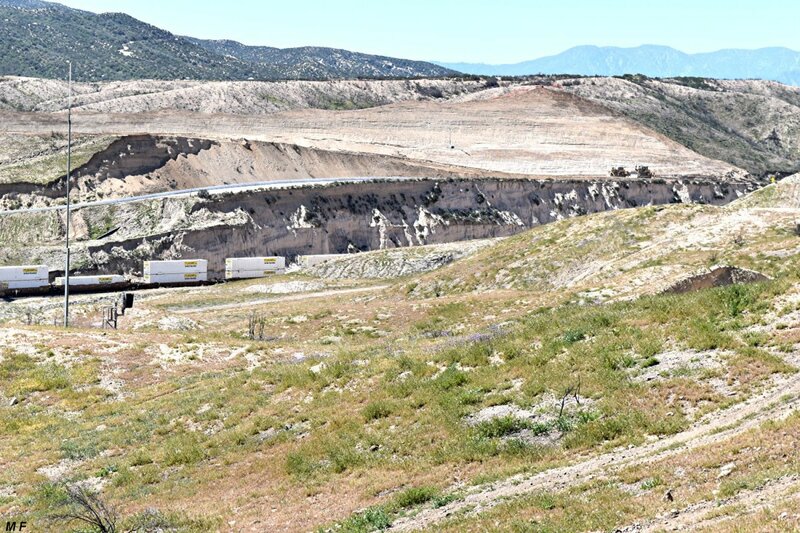 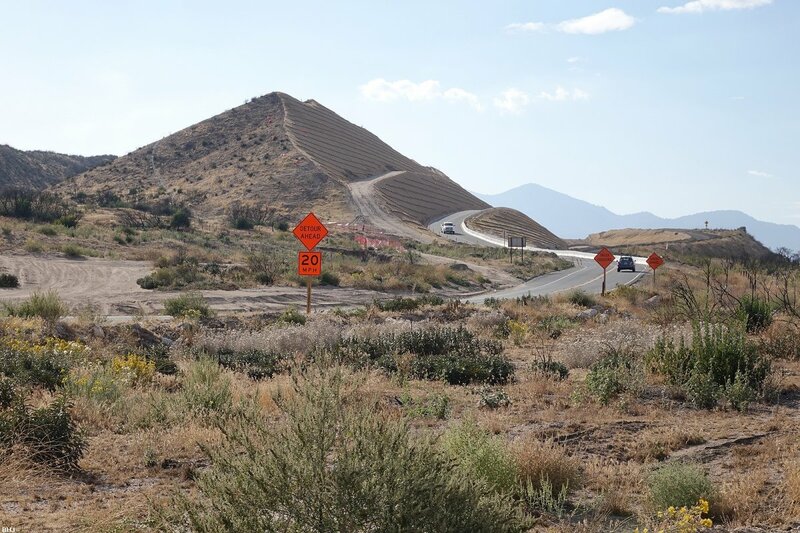 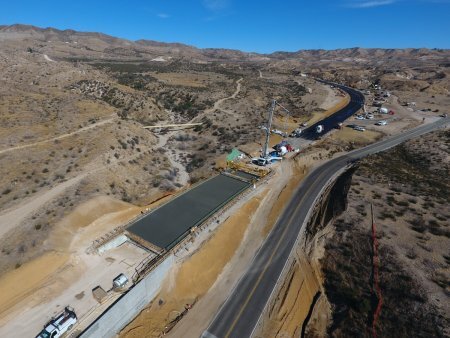 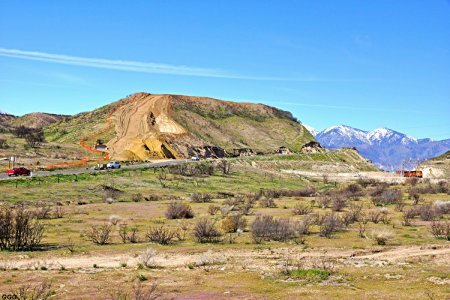 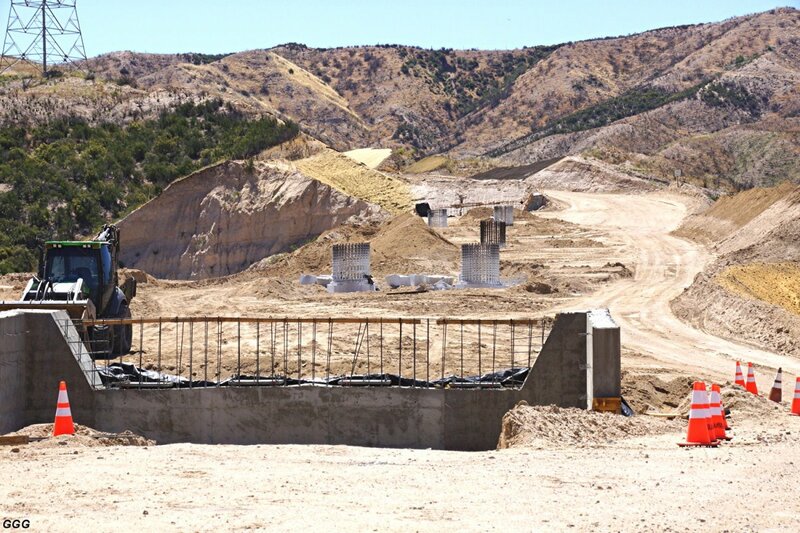 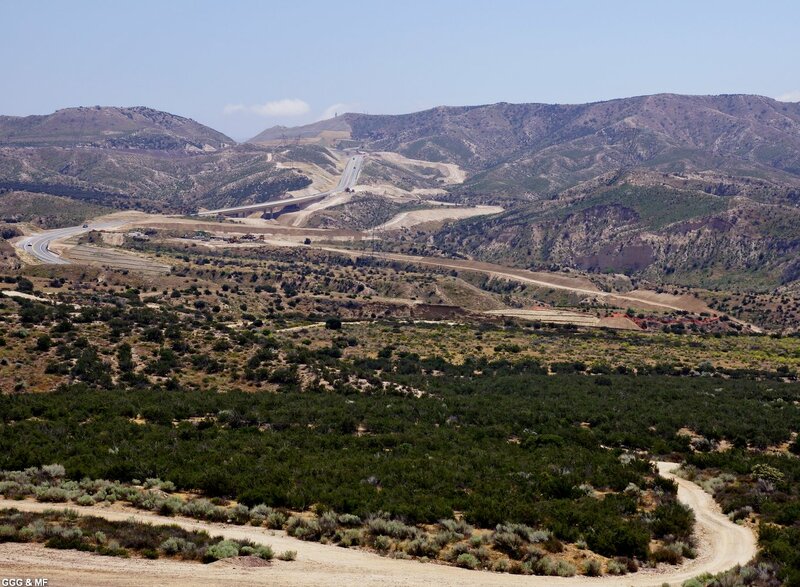 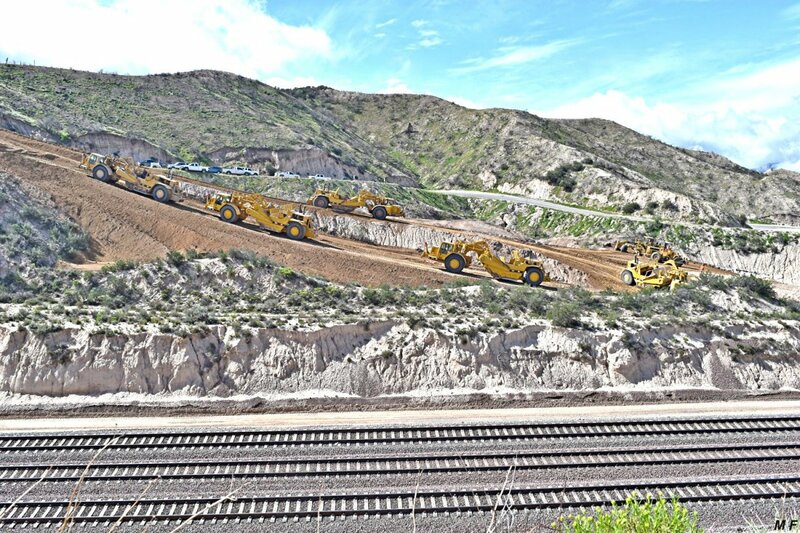 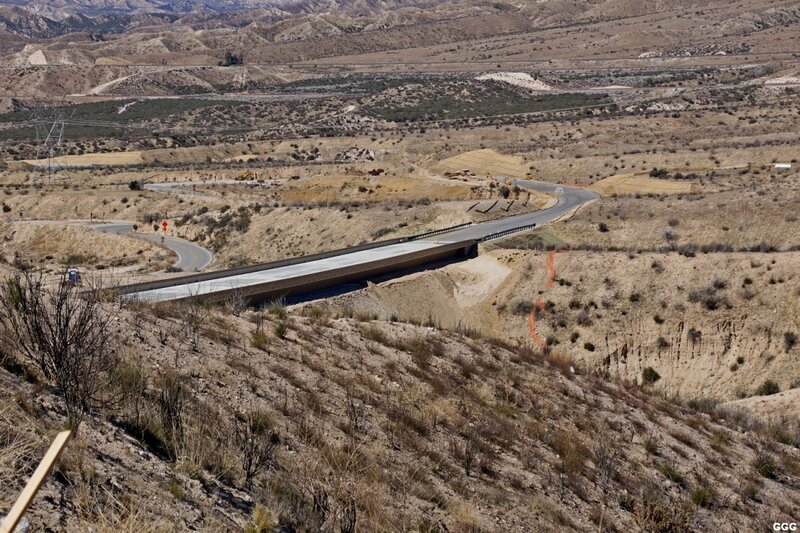 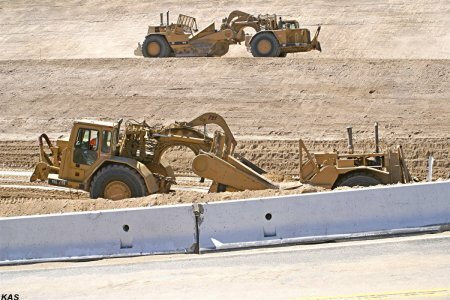 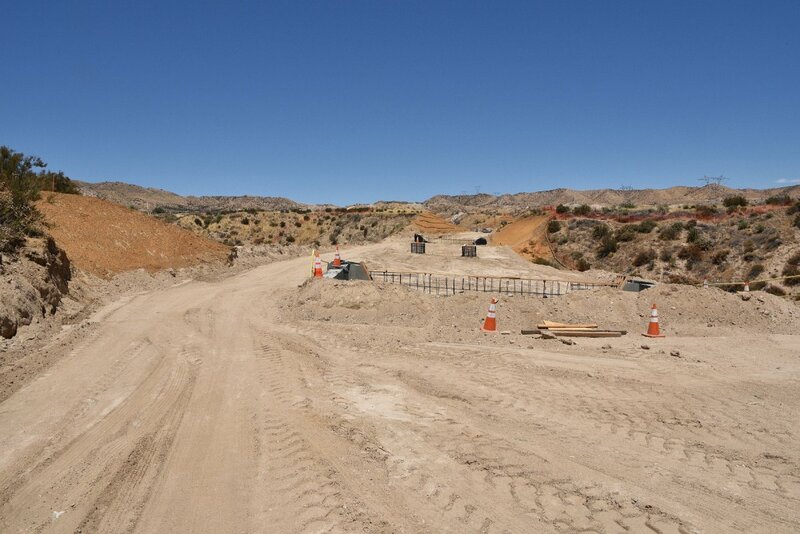 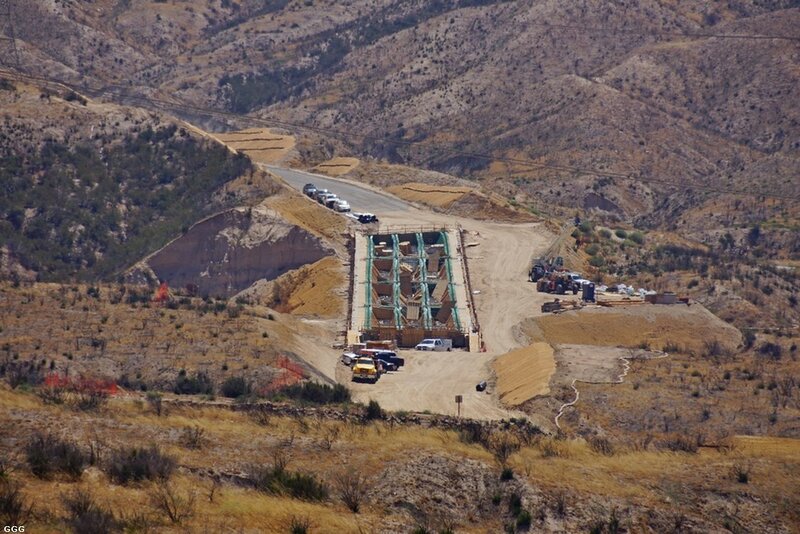 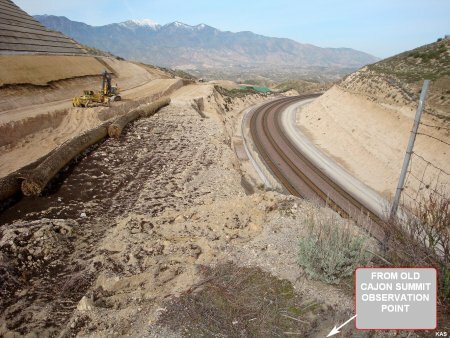 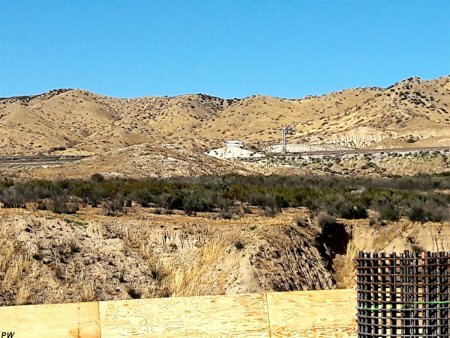 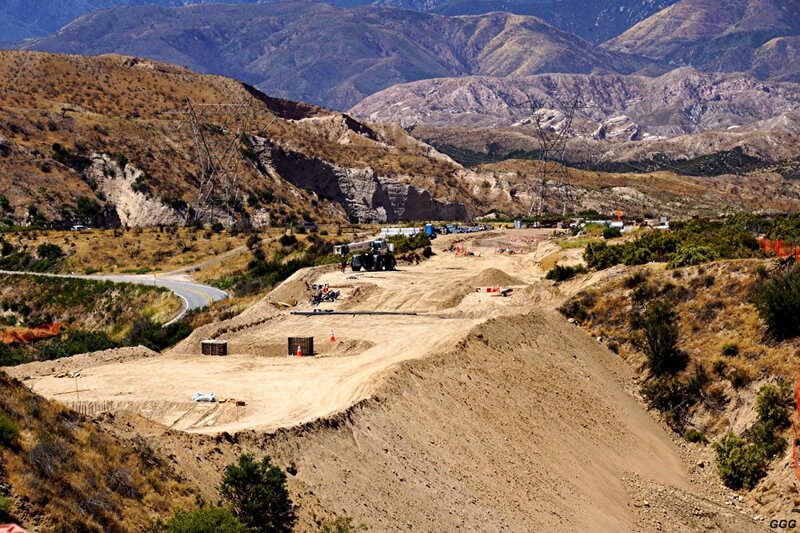 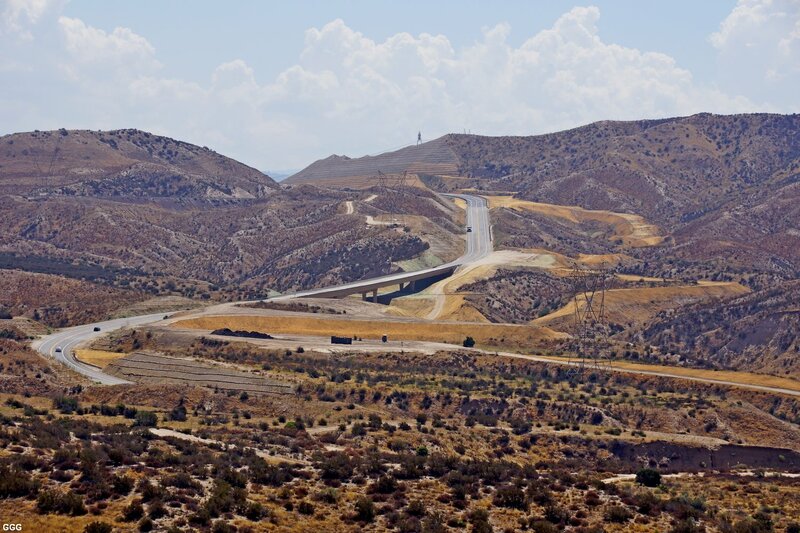 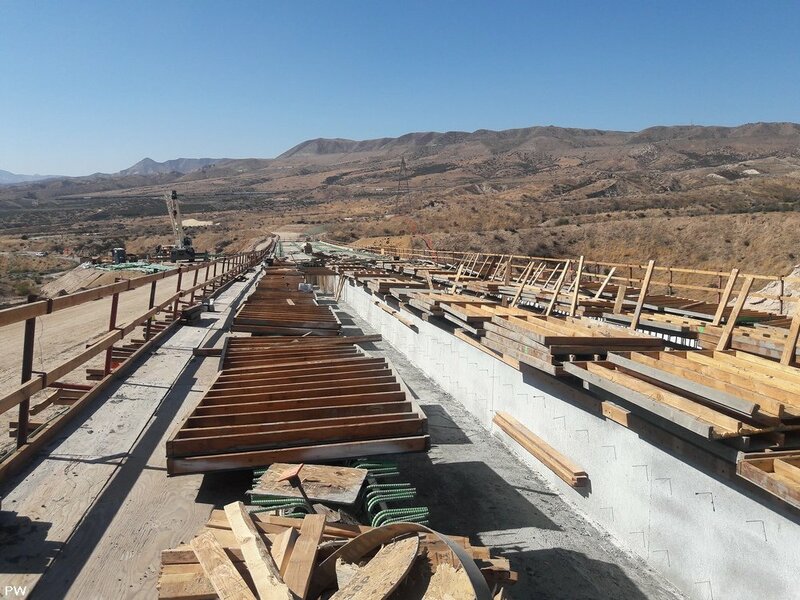 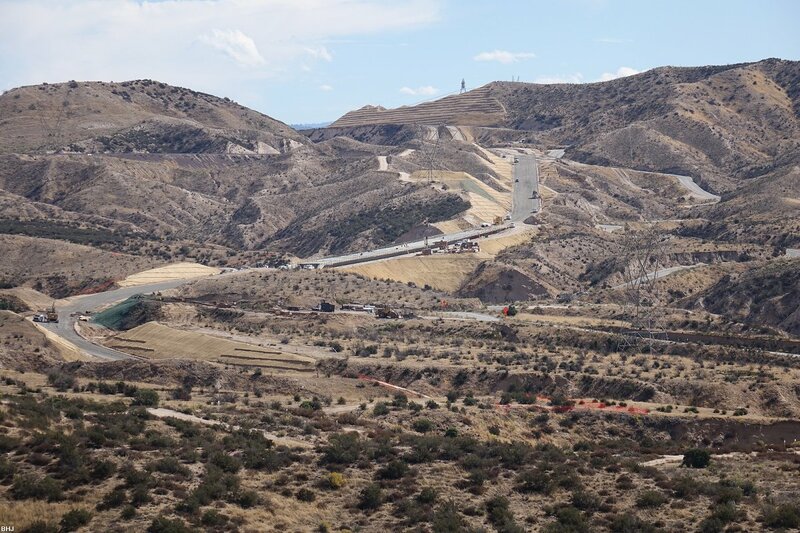 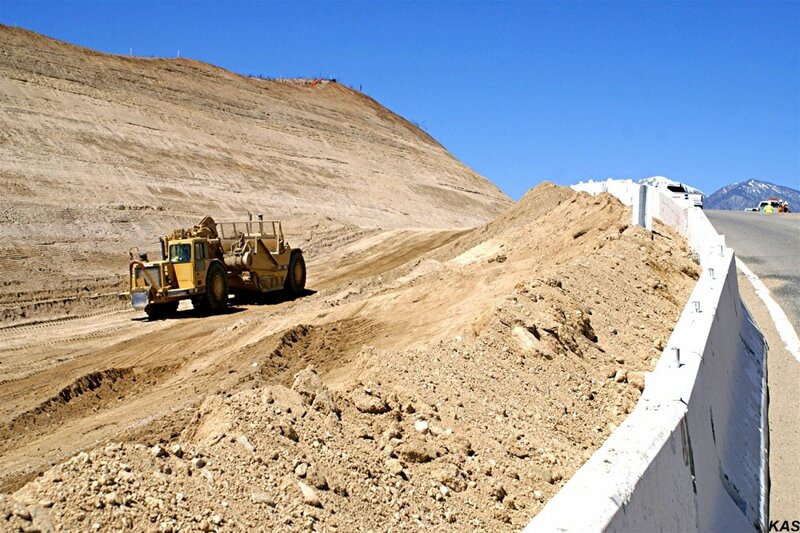 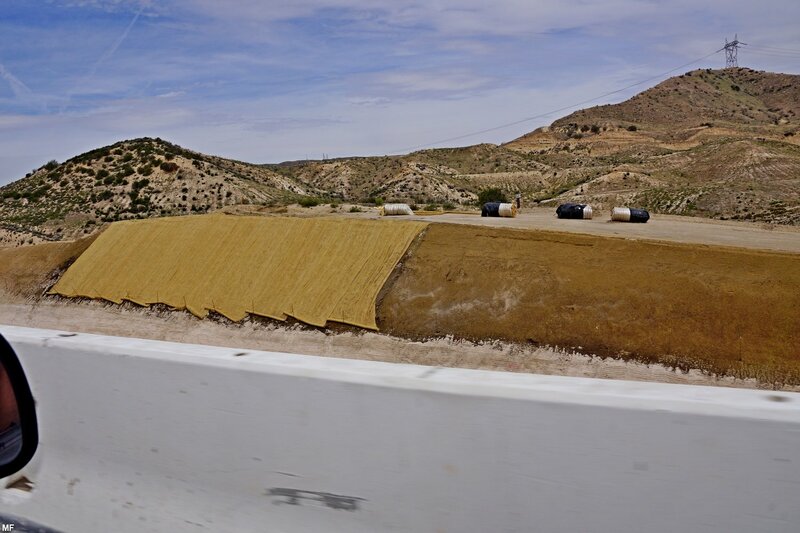 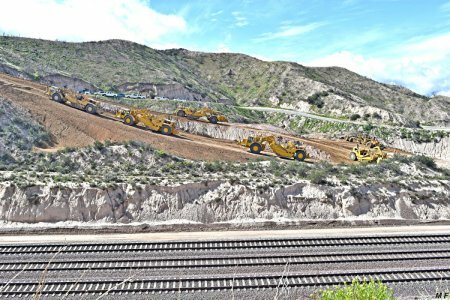 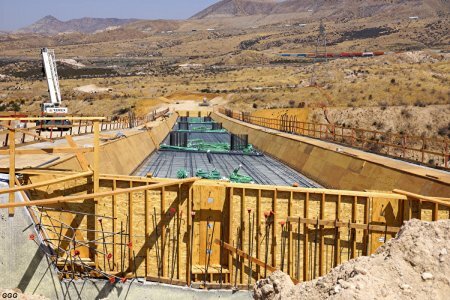 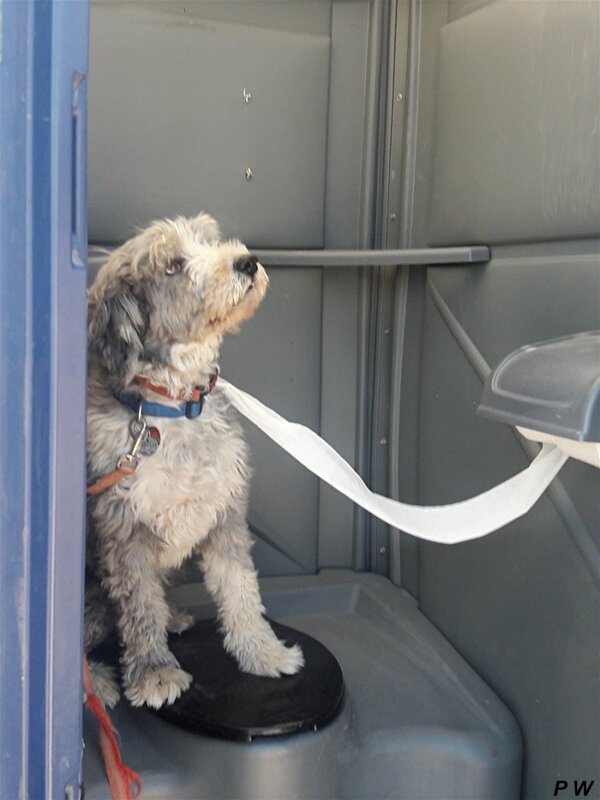 The project is located on SR-138 just east of Interstate 15 to Summit Post Office Road. 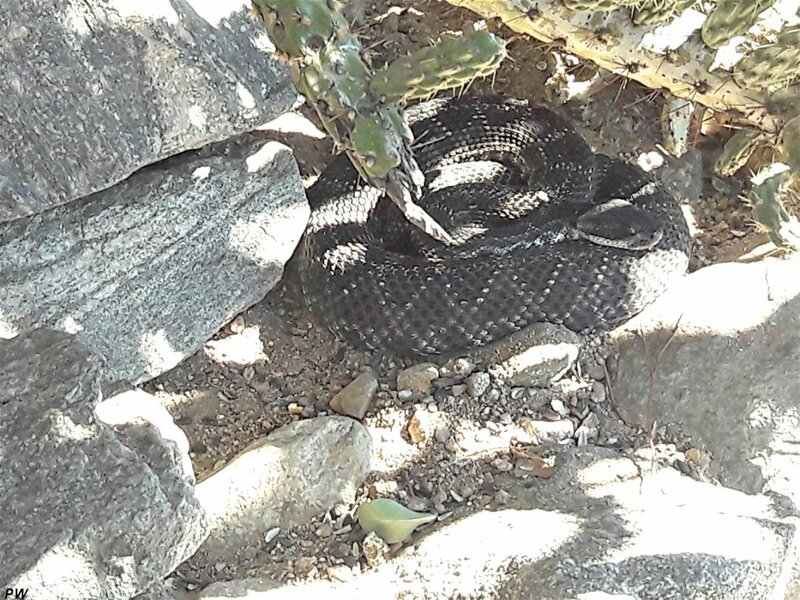 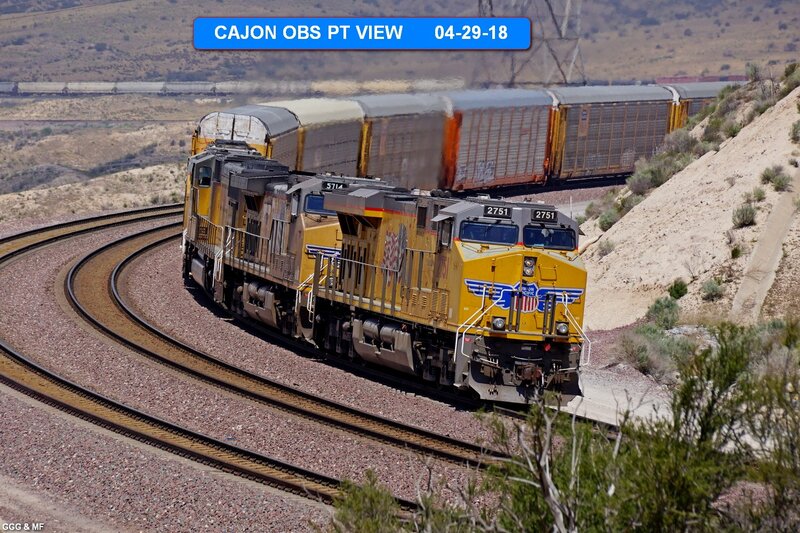 Friend Keith S. visited Cajon Summit on March 31st and sends the attached. 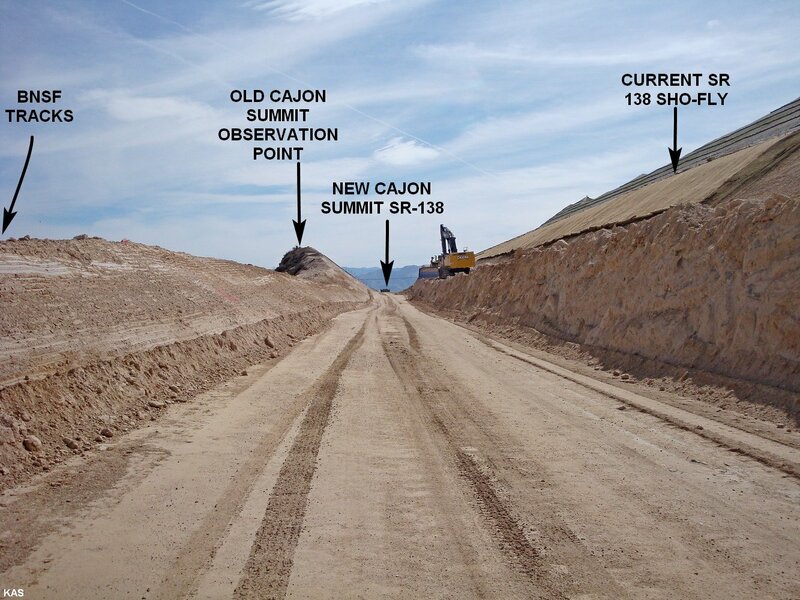 On April 15, Marc & I drove into Cajon to check the progress of the SR-138 realignment. 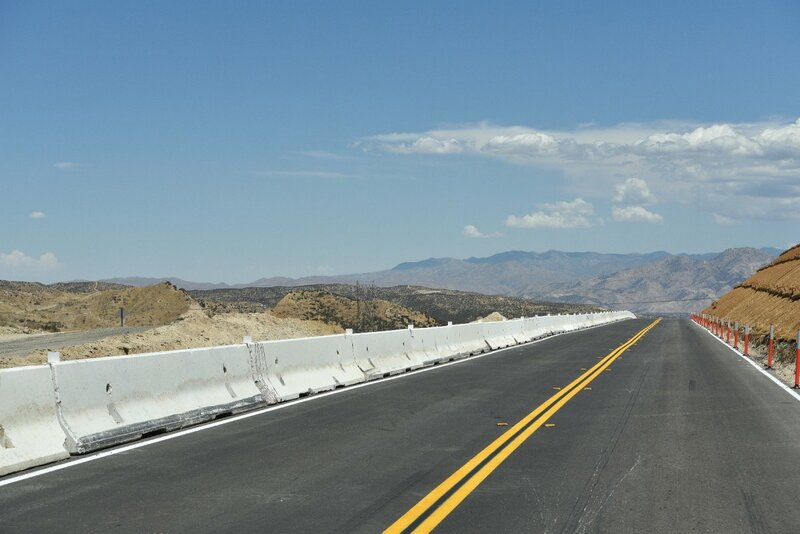 As most know, the new alignment is open between I-15 and the WEST END of the unfinished SUMMIT portion of SR-138. So, the temporary Shoo-fly crossing the Summit is still in use while the contractor finishes the highway. 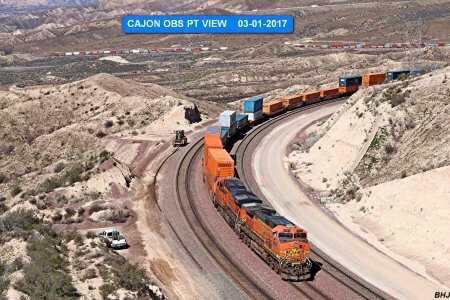 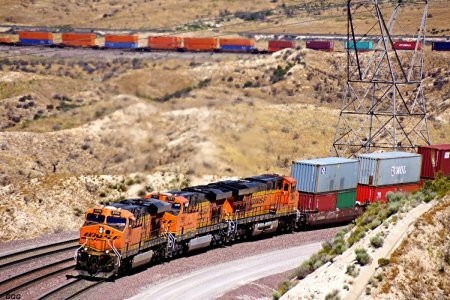 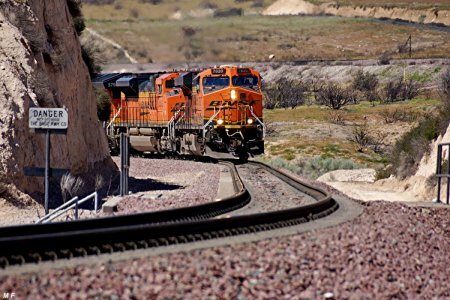 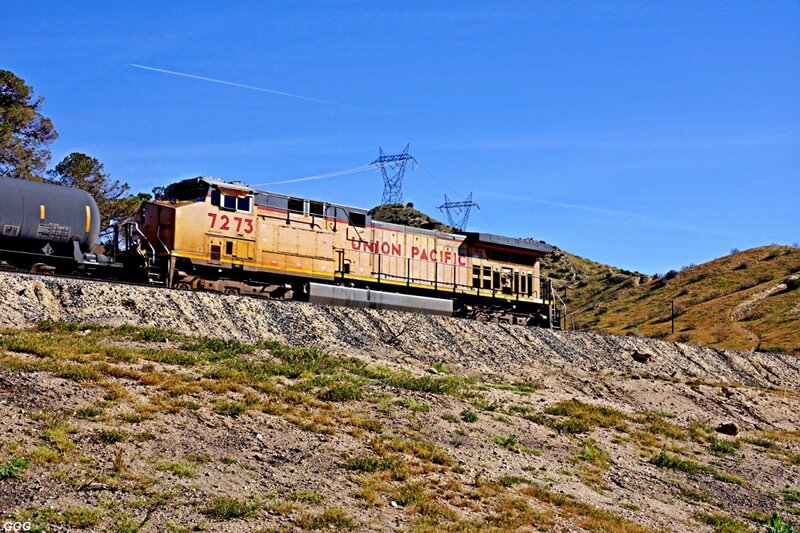 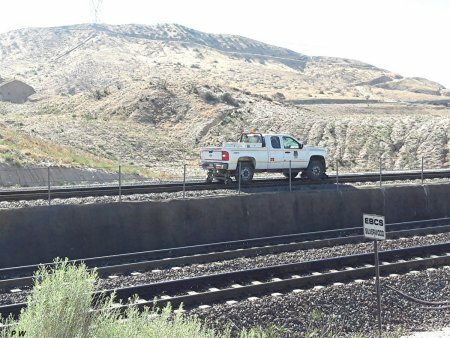 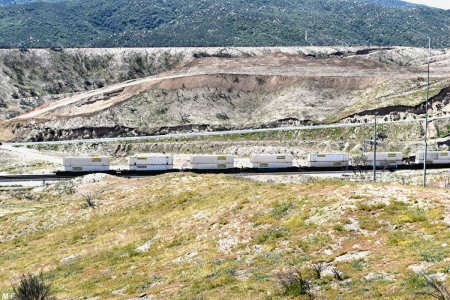 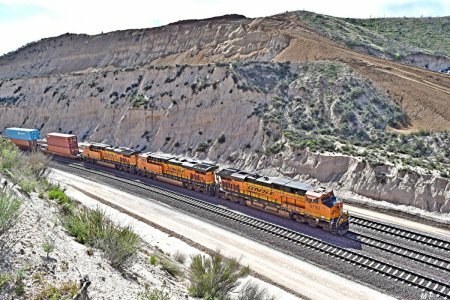 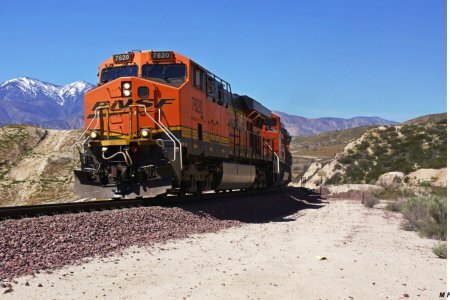 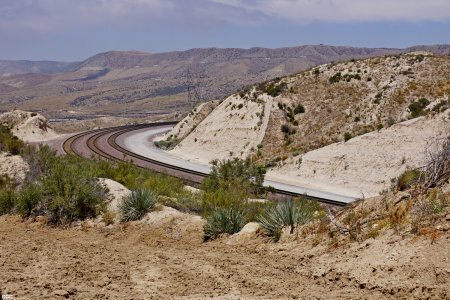 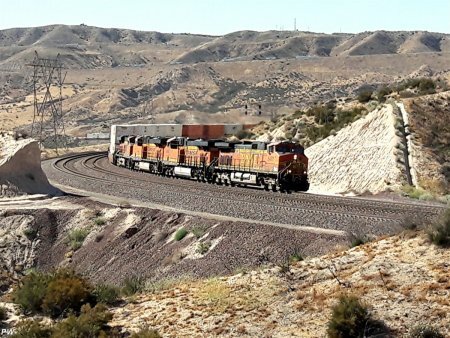 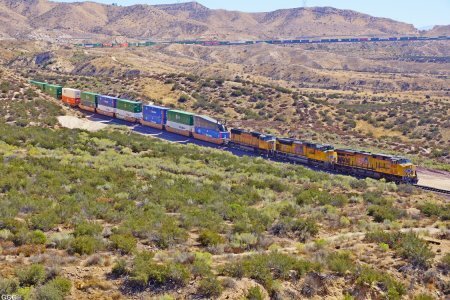 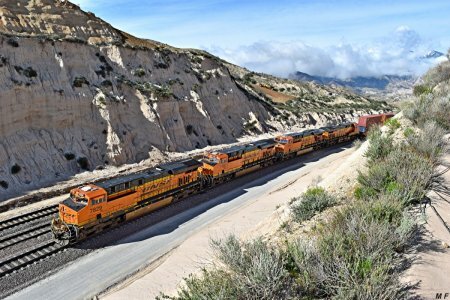 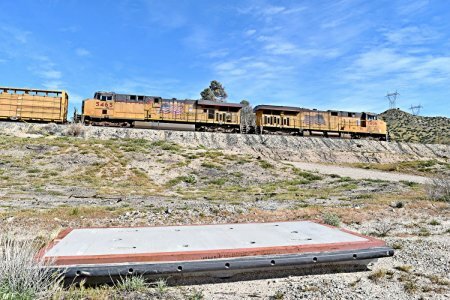 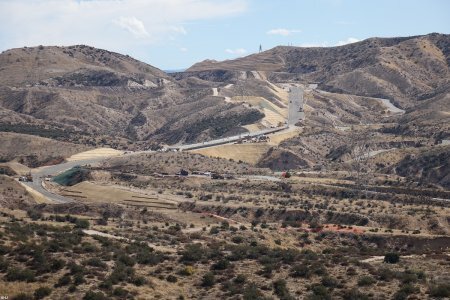 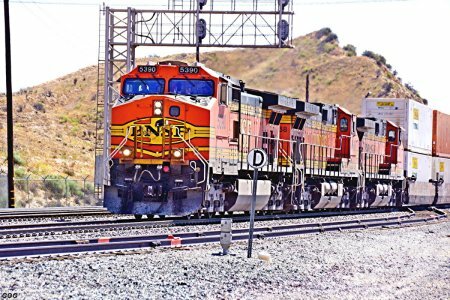 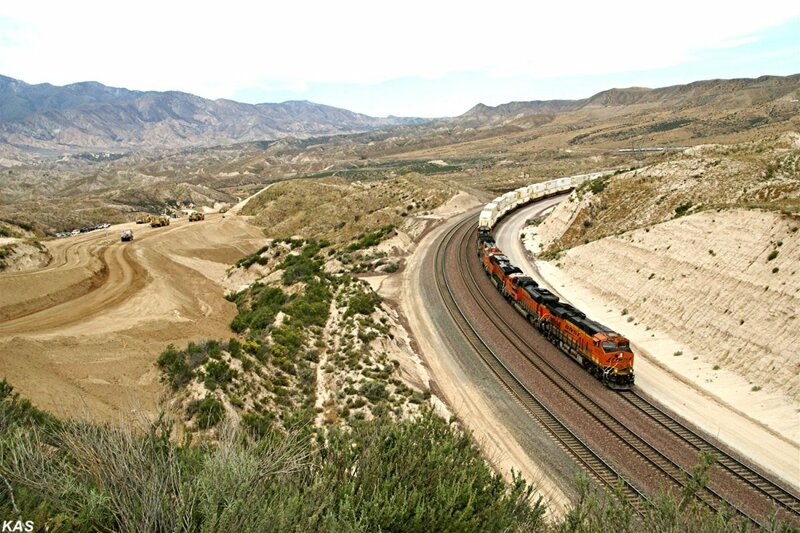 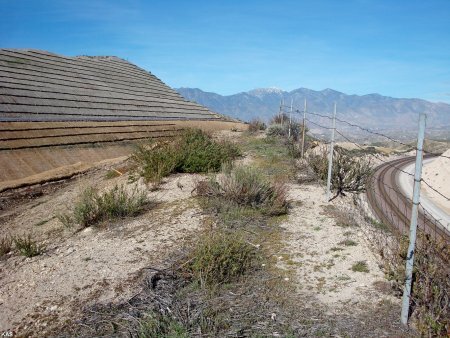 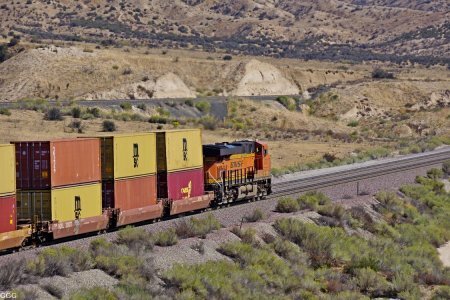 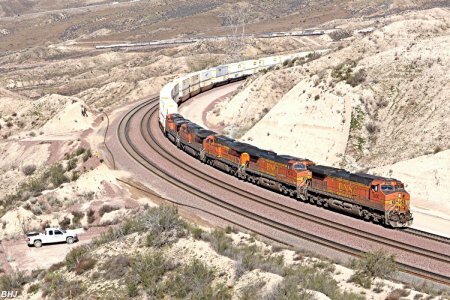 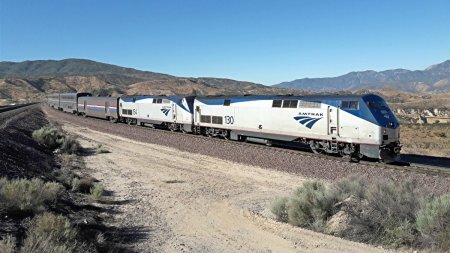 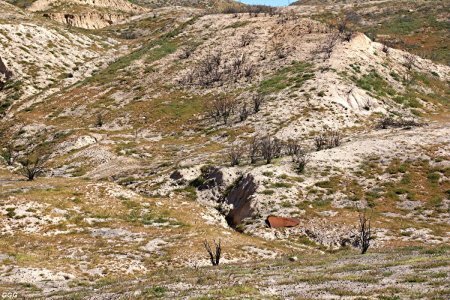 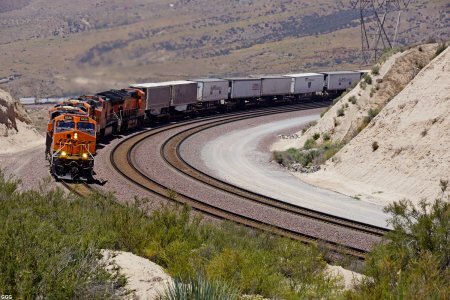 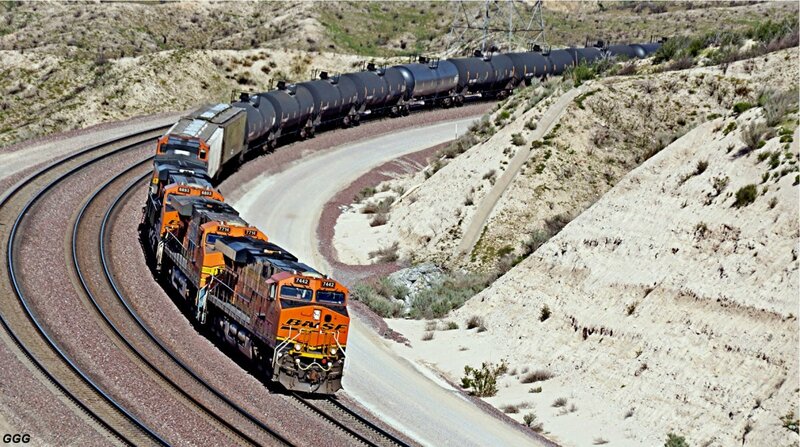 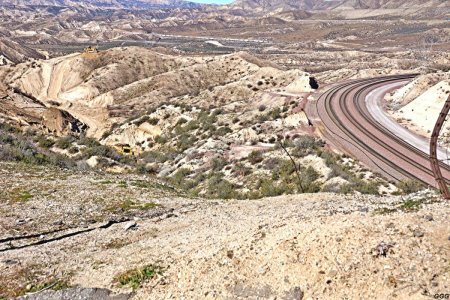 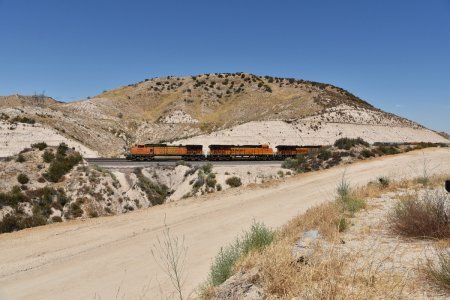 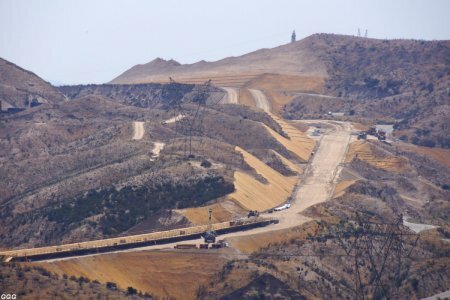 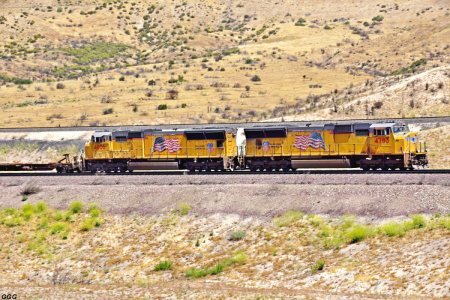 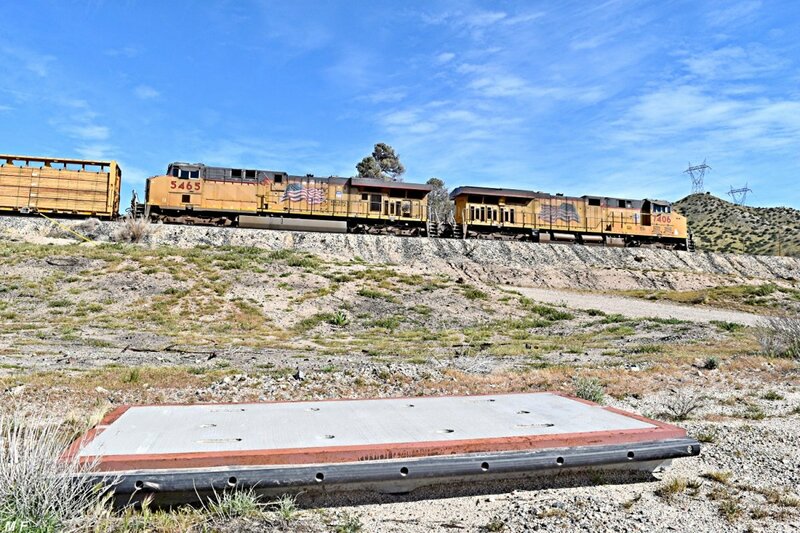 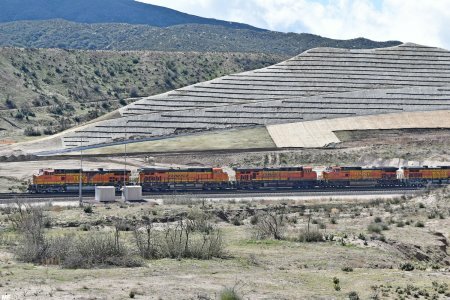 One of the most frequently asked questions concerned the future of the Cajon Summit Observation Point, which ONCE overlooked the BNSF Summit Curve and gave a decent view of much of the Pass. 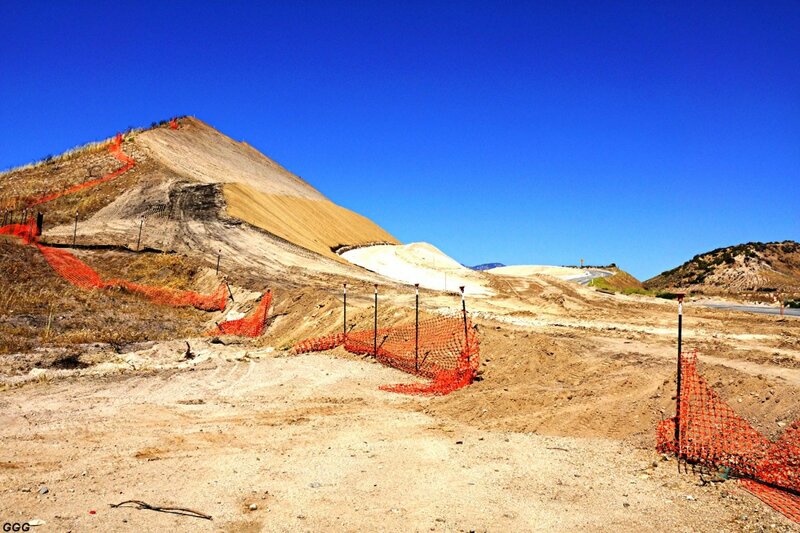 Well, the project has eliminated most of the West end of the overlook --- which was directly above the Summit Curve. The little left there is much lower than the old Overlook and, according to how the safety railings are installed, may be access restricted. 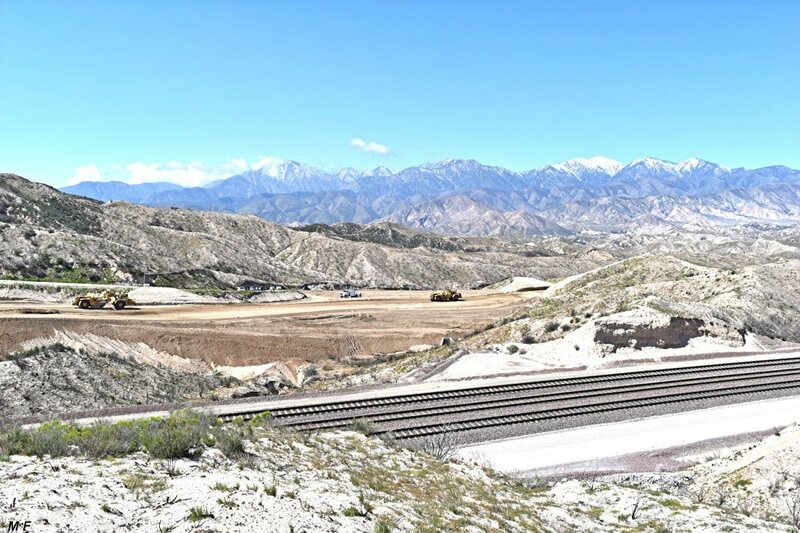 GGG 4/15/18 From the Eastern base of Summit hill looking West. 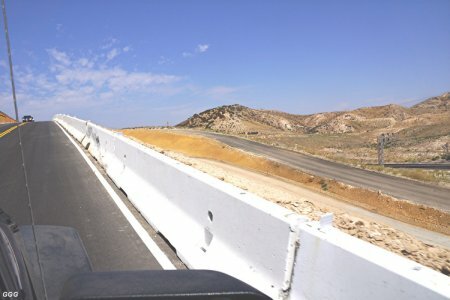 While whats left of the Summit overlook looks promising to photographers, where they place the safety railings will dictate our access. Also, the remaining overlook hill will be very narrow. 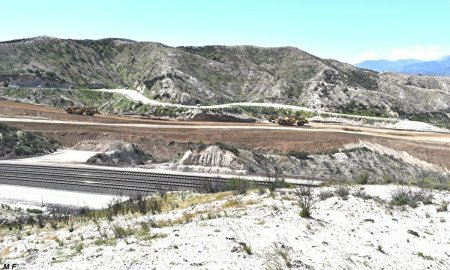 - 212 MF 4/15/18 Looking East at the OLD OVERLOOK. 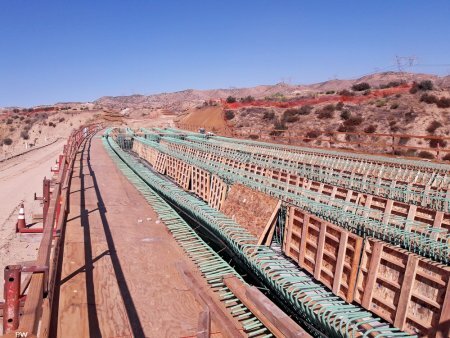 Photos # 219 and 220: Bridge #3 is pictured. As mentioned, the Canyons were filled in so that the three bridges could be built on solid ground --- thus eliminating the need for expensive scaffolding. That fill dirt is now being removed and the land is being restored to its natural contours. 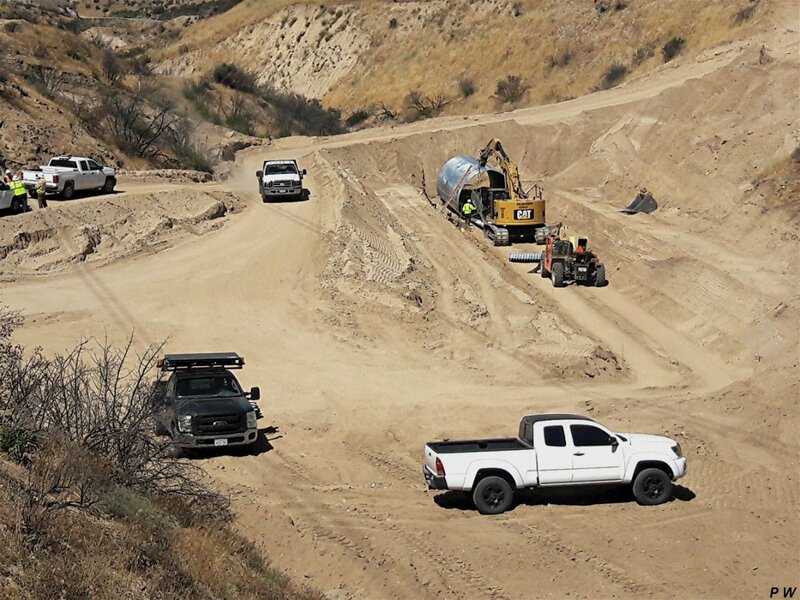 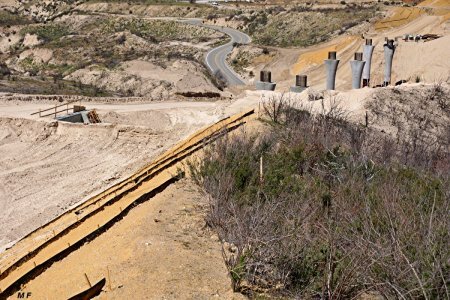 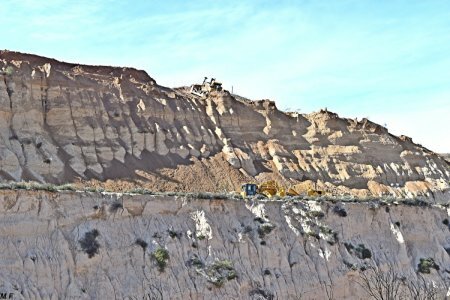 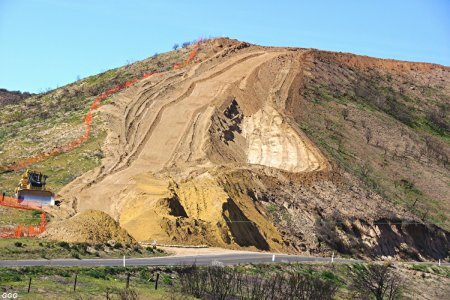 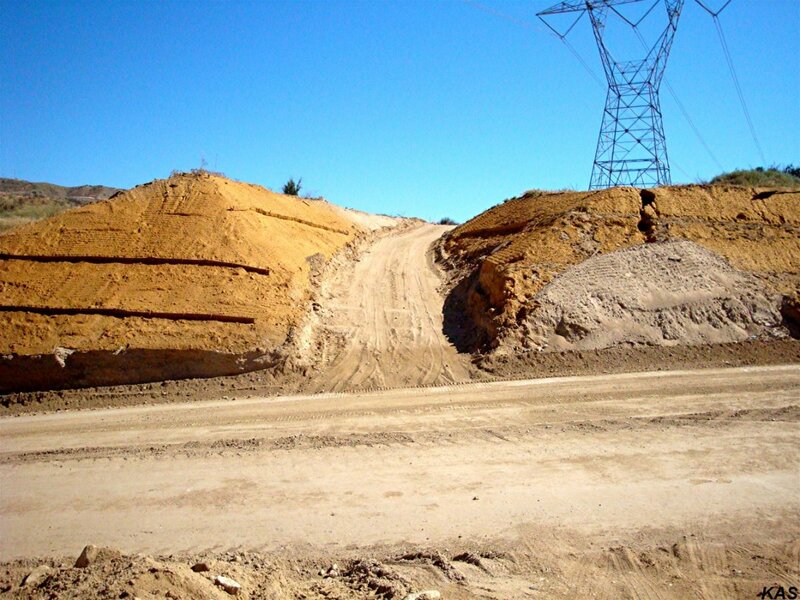 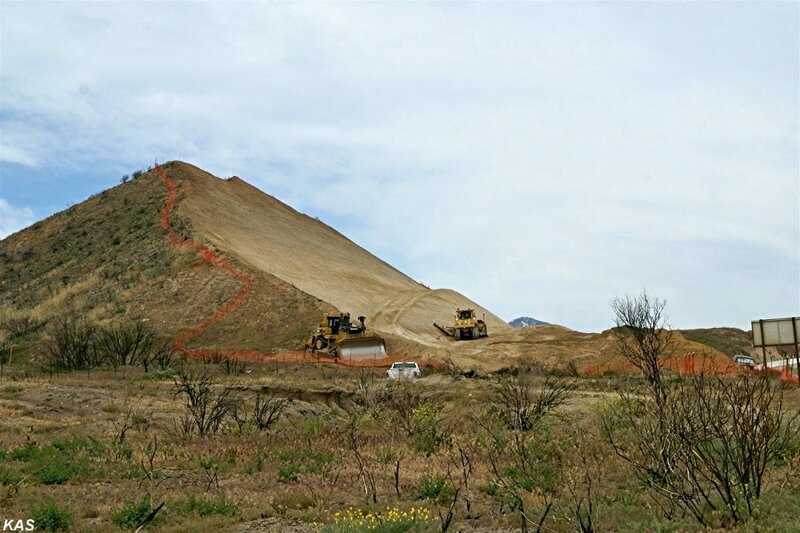 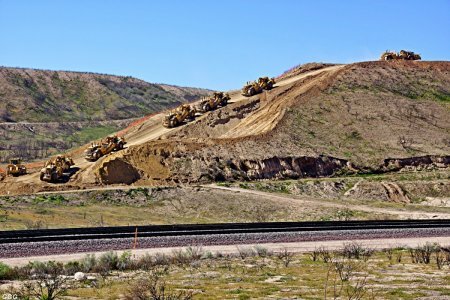 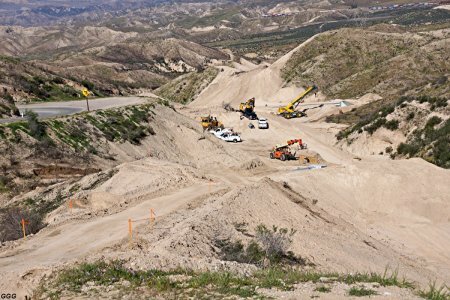 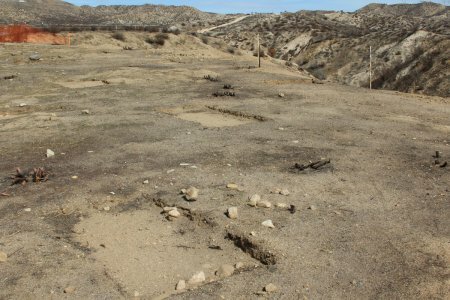 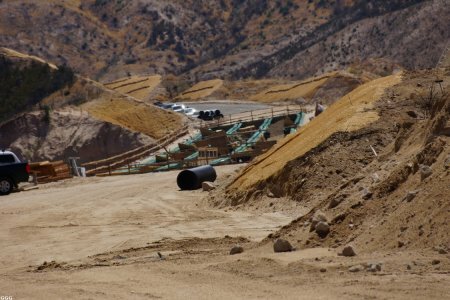 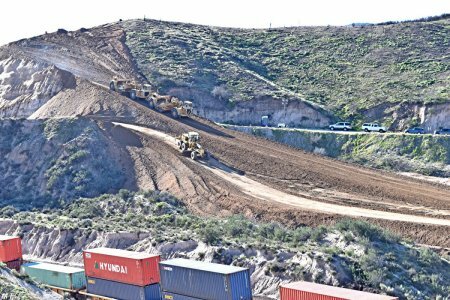 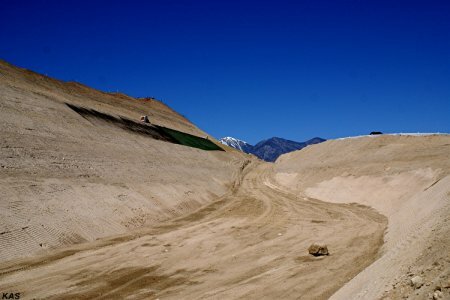 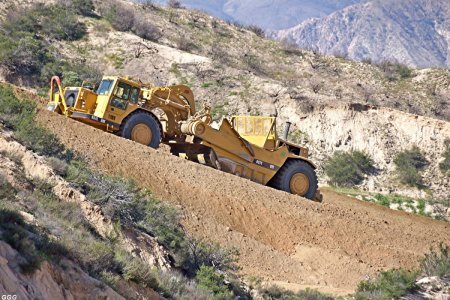 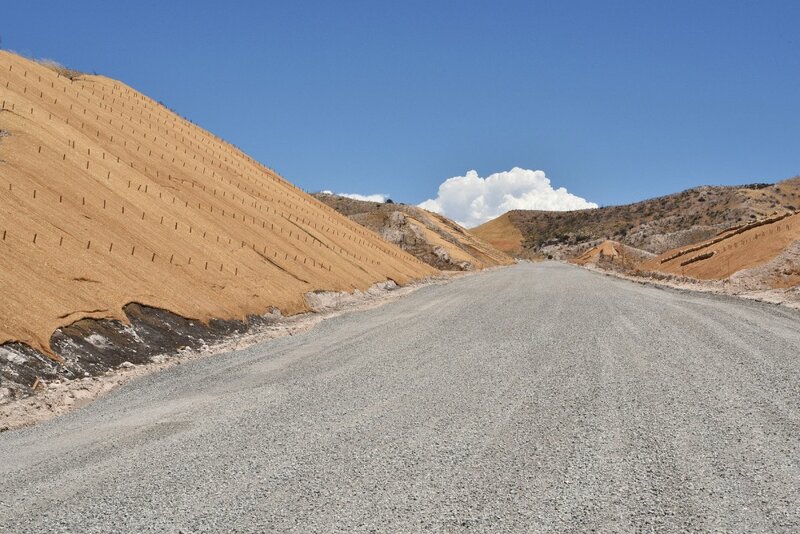 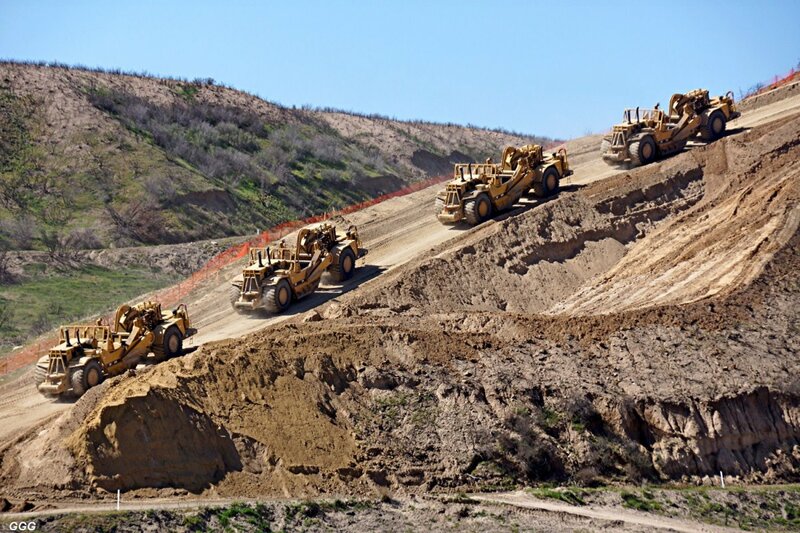 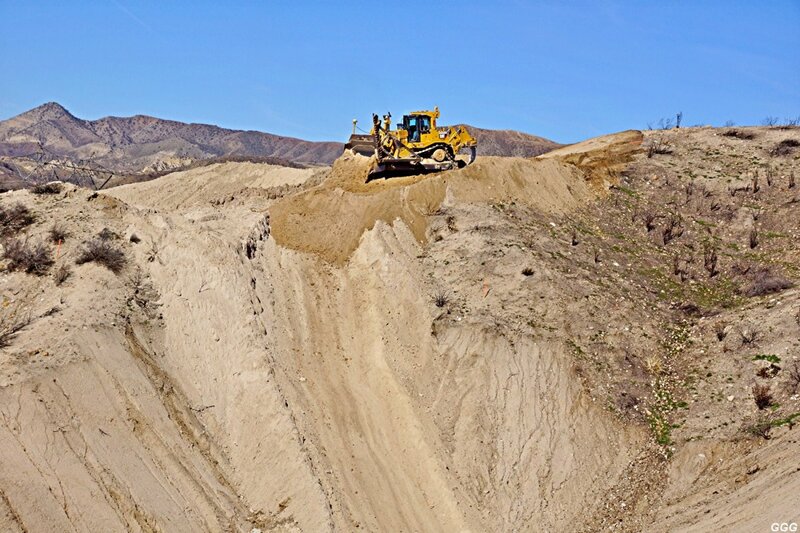 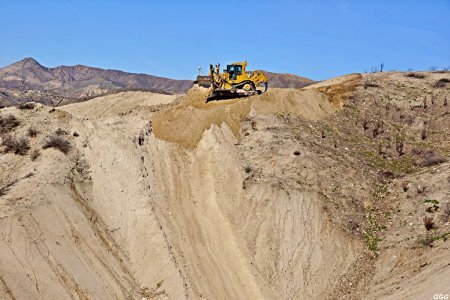 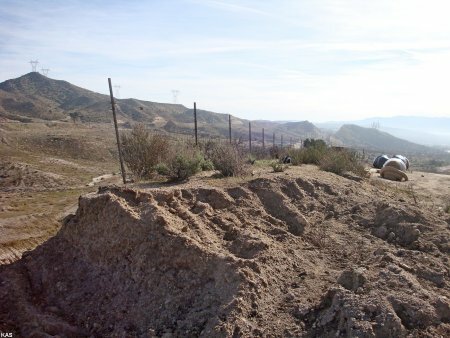 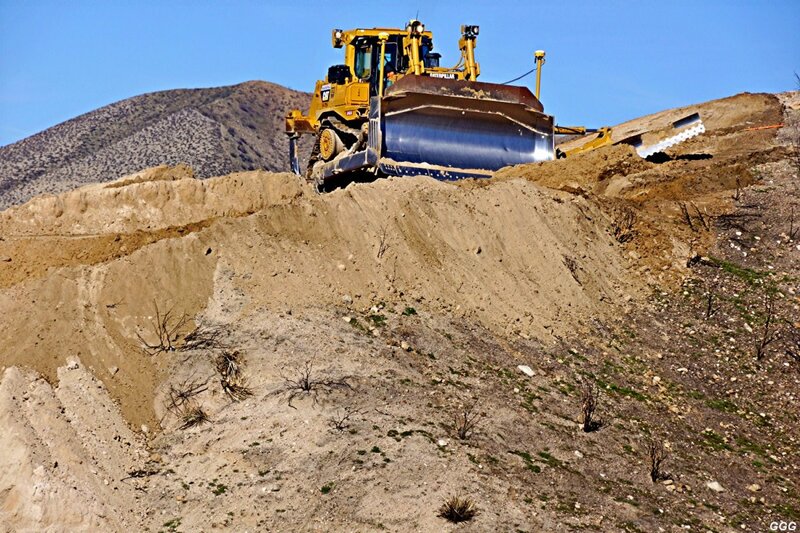 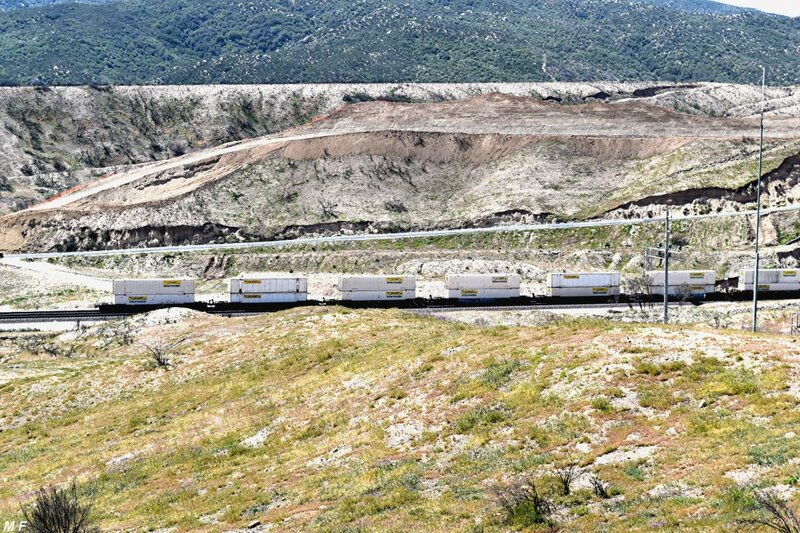 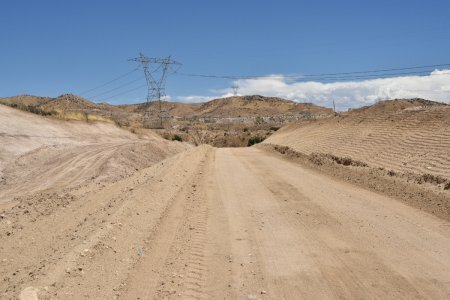 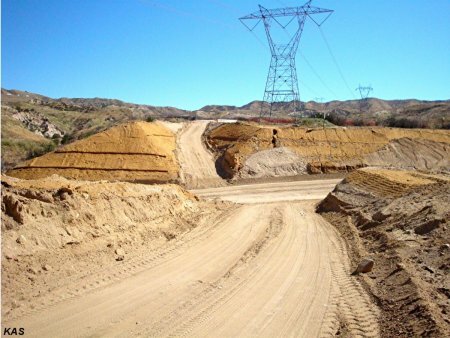 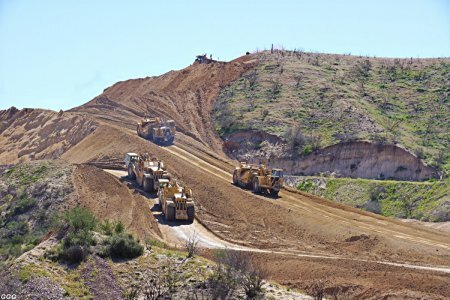 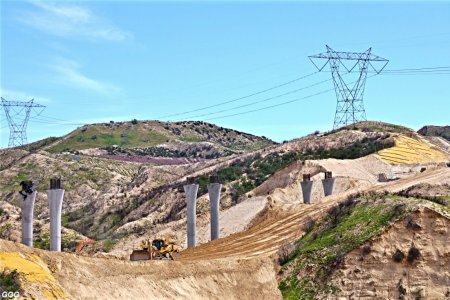 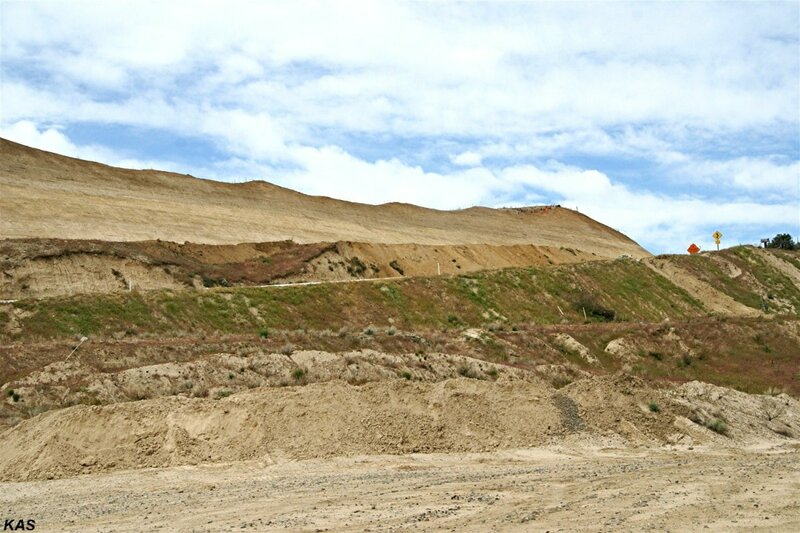 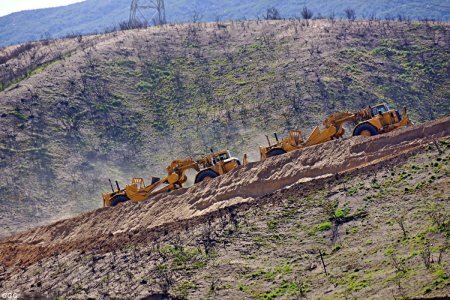 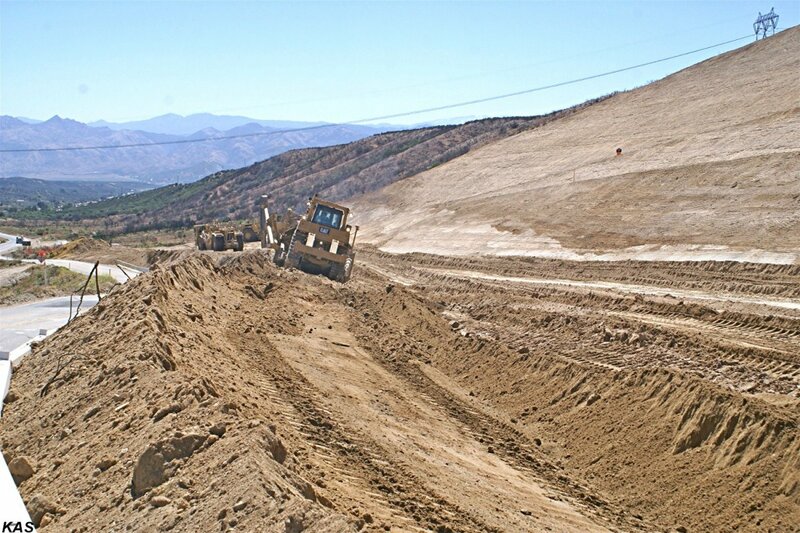 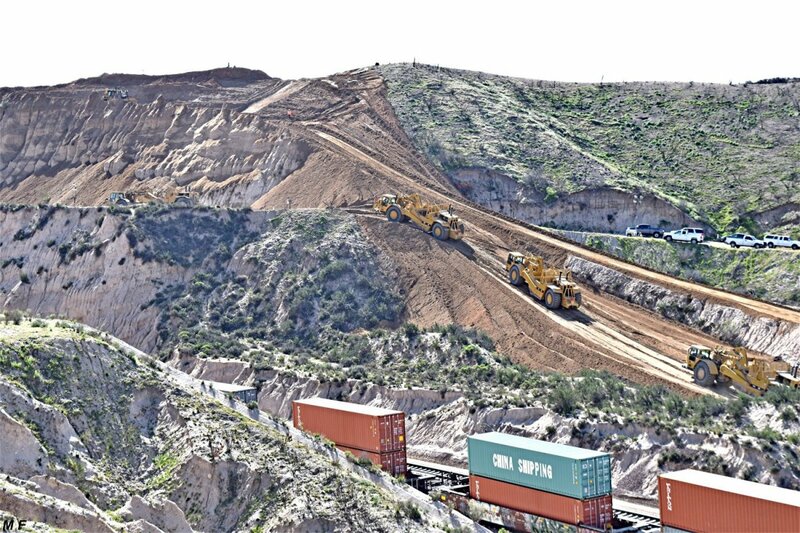 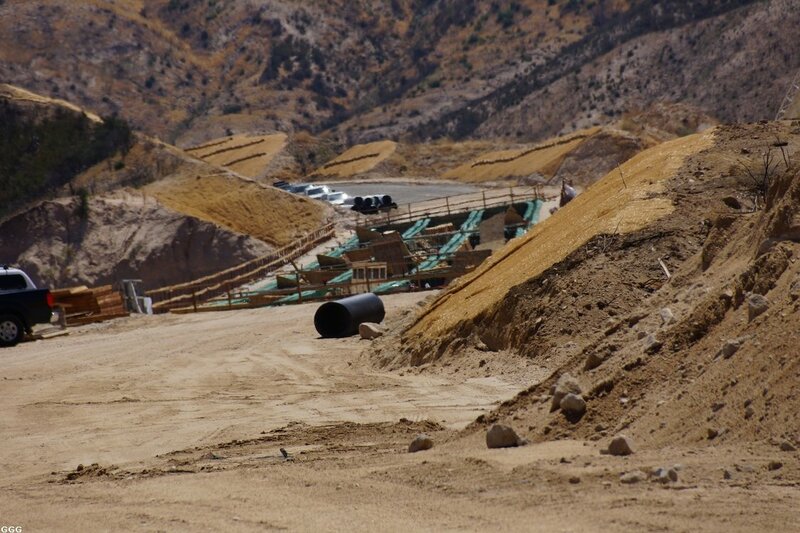 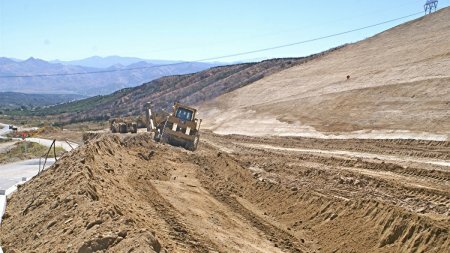 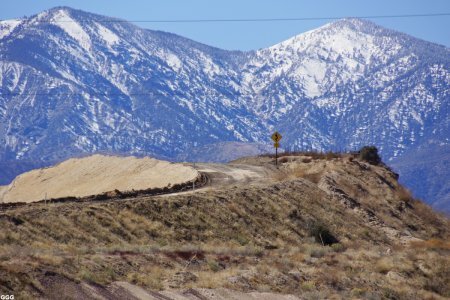 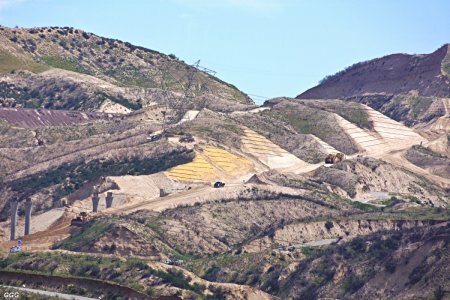 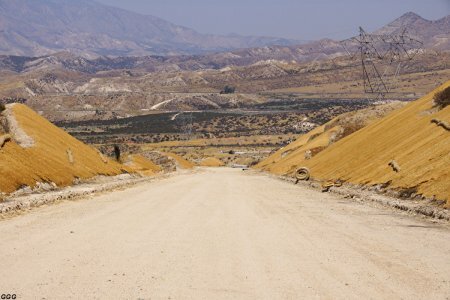 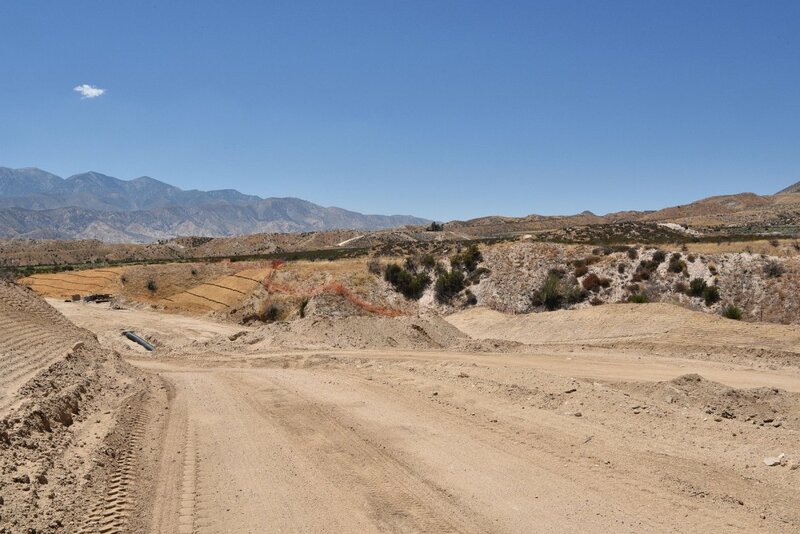 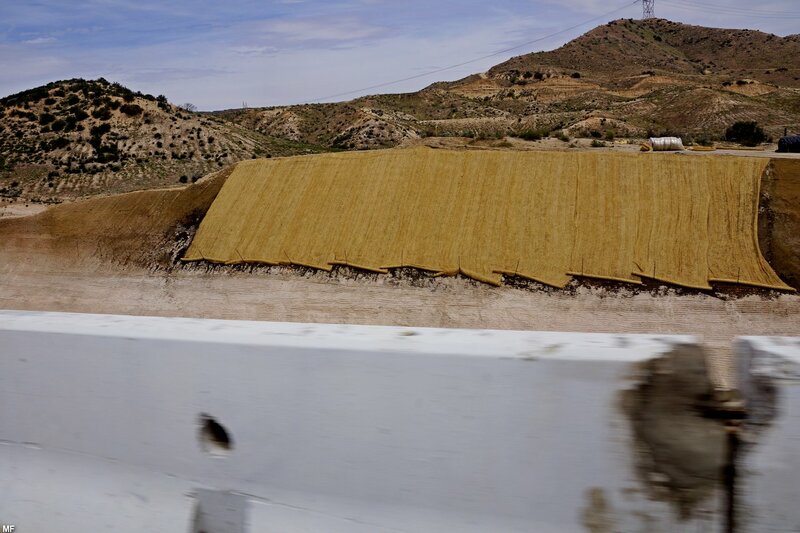 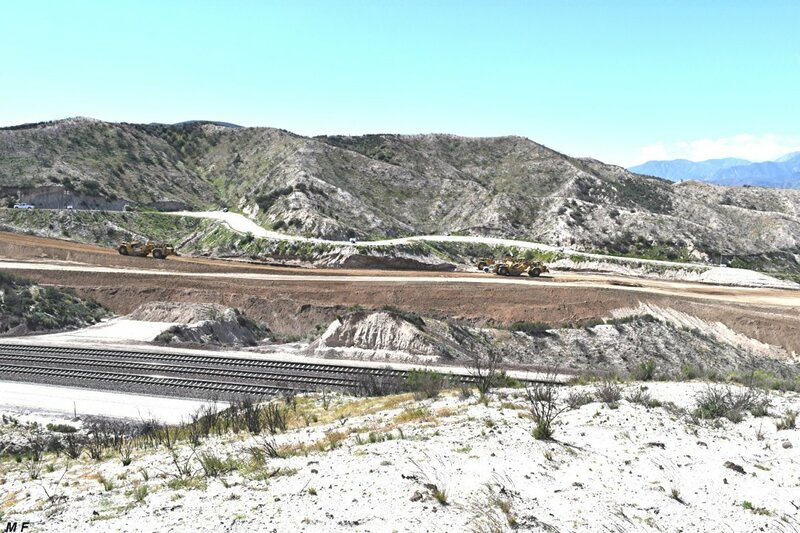 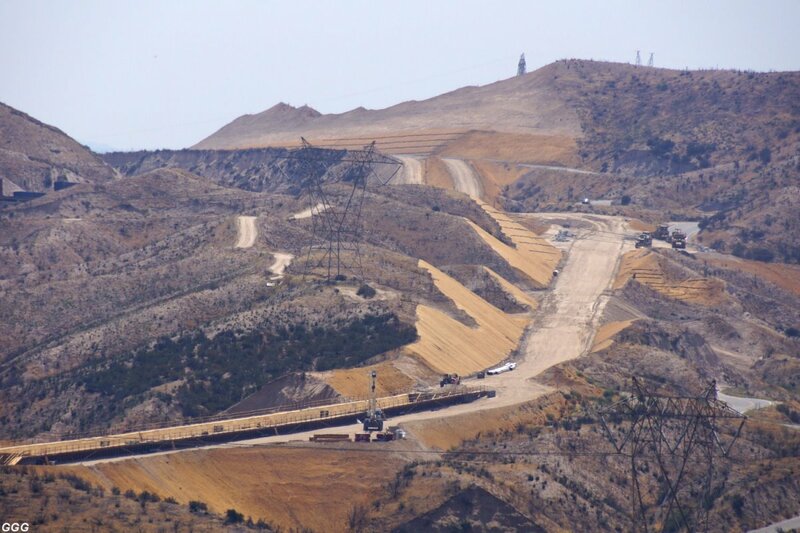 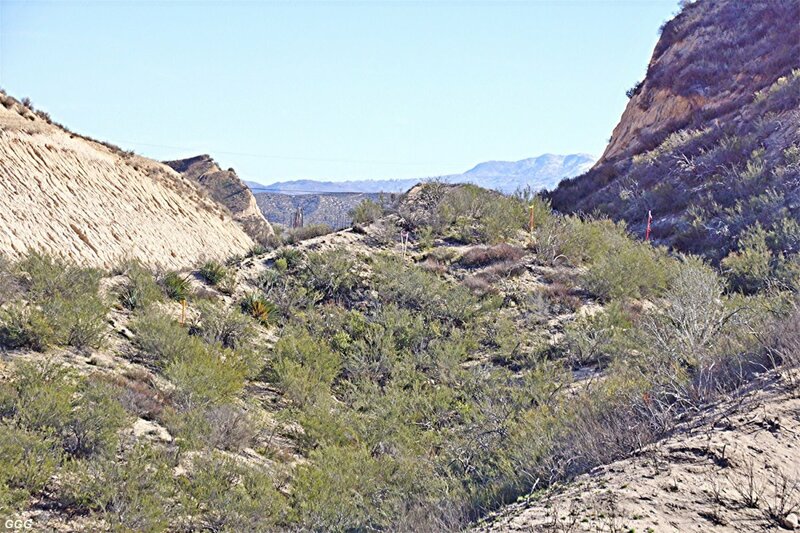 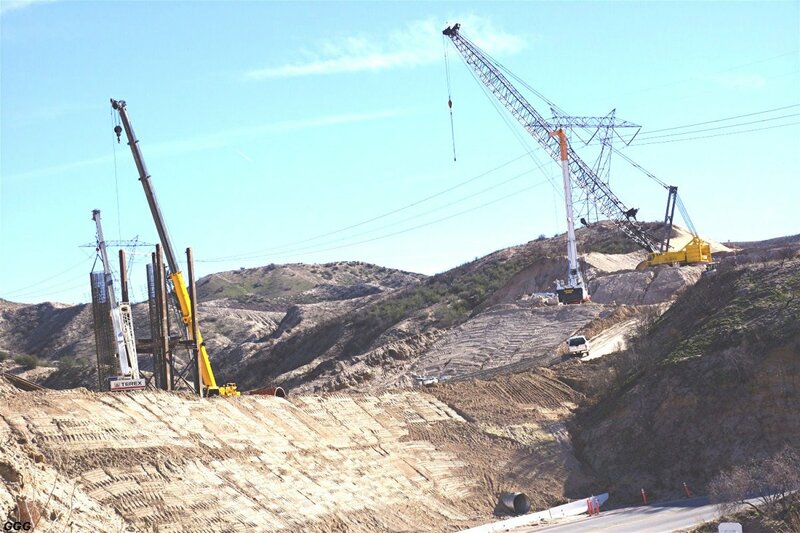 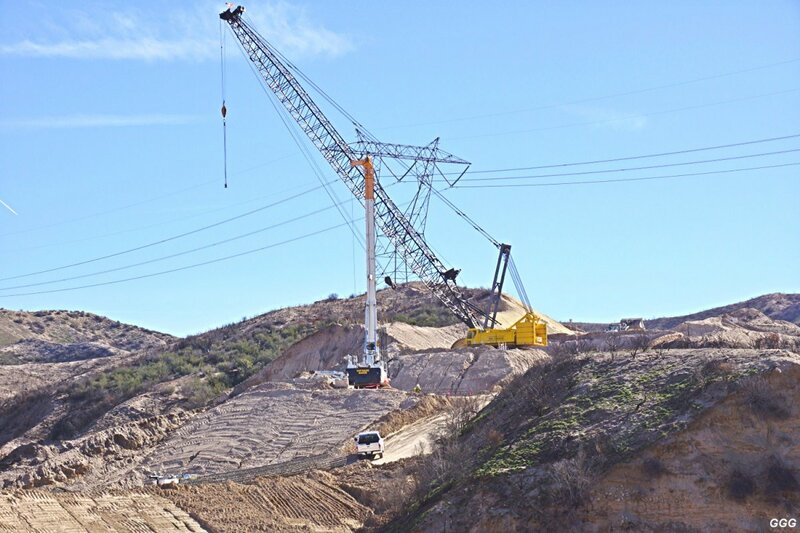 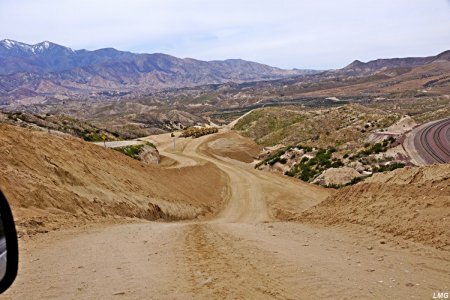 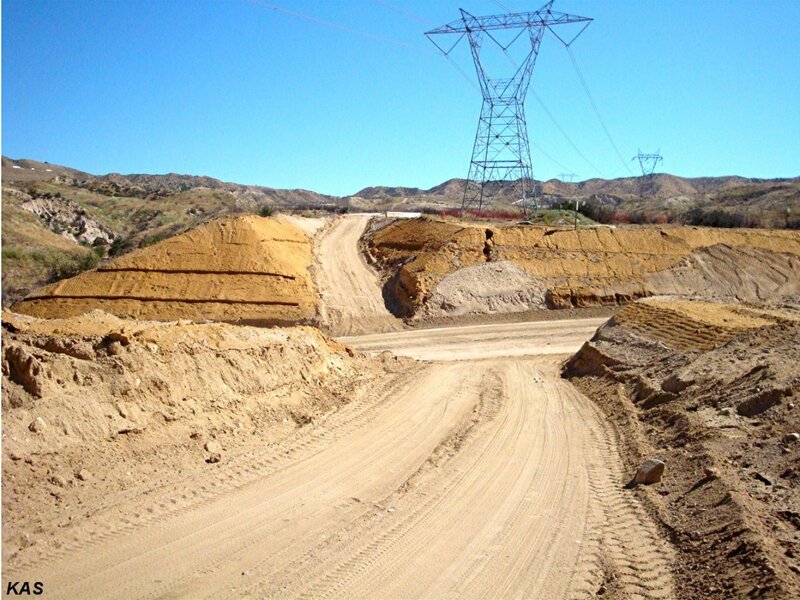 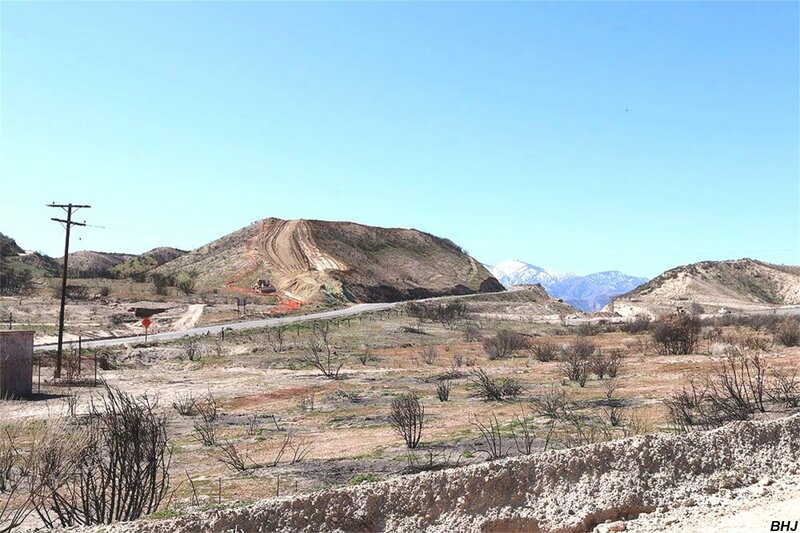 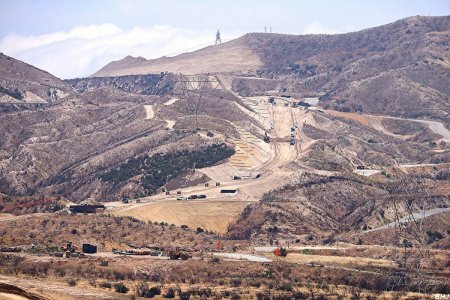 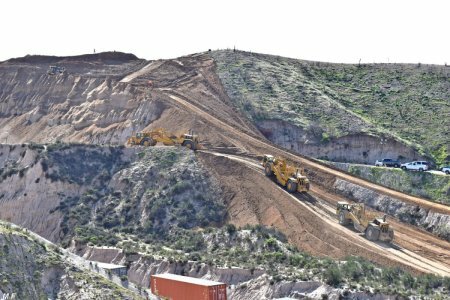 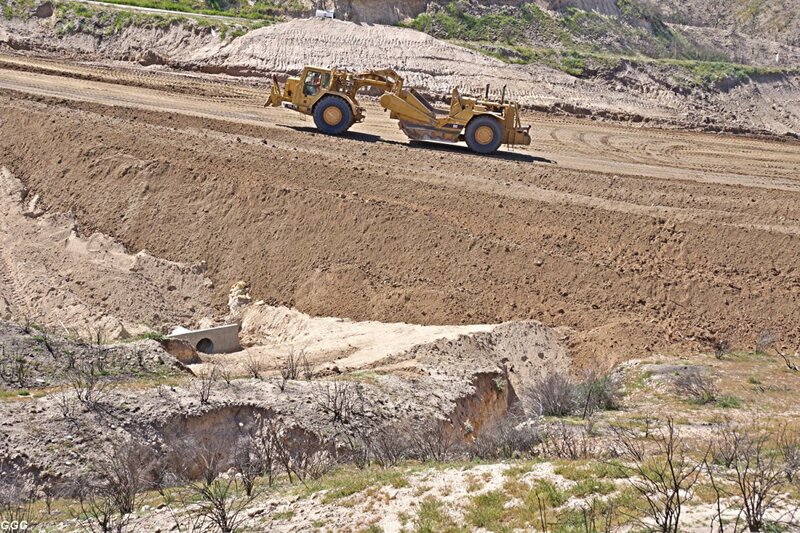 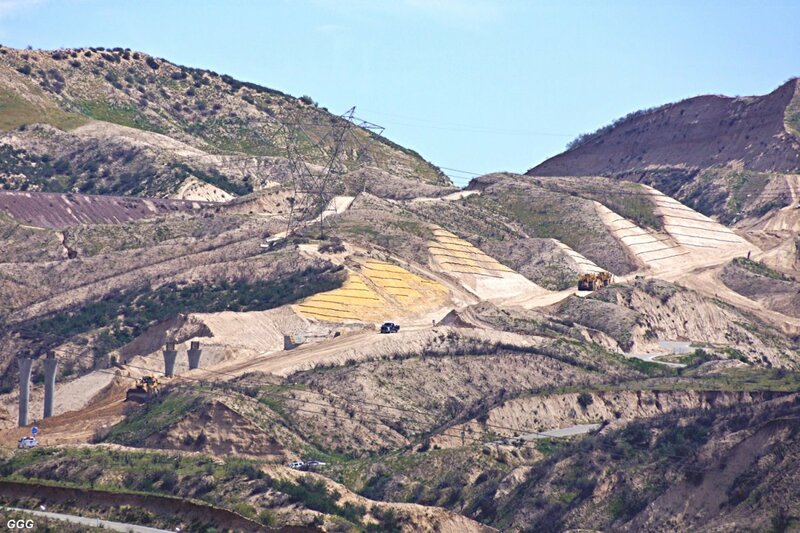 The excess dirt is dumped on the old SR-138 alignment, which will remain to provide access many HIGH-TENSION electrical transmission towers in the area. 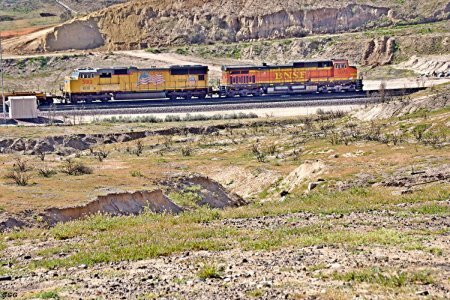 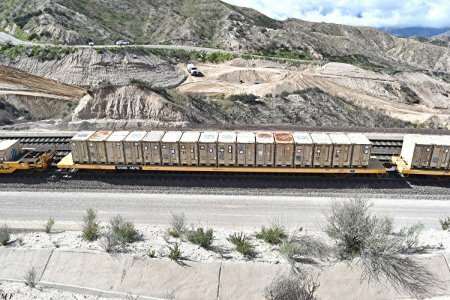 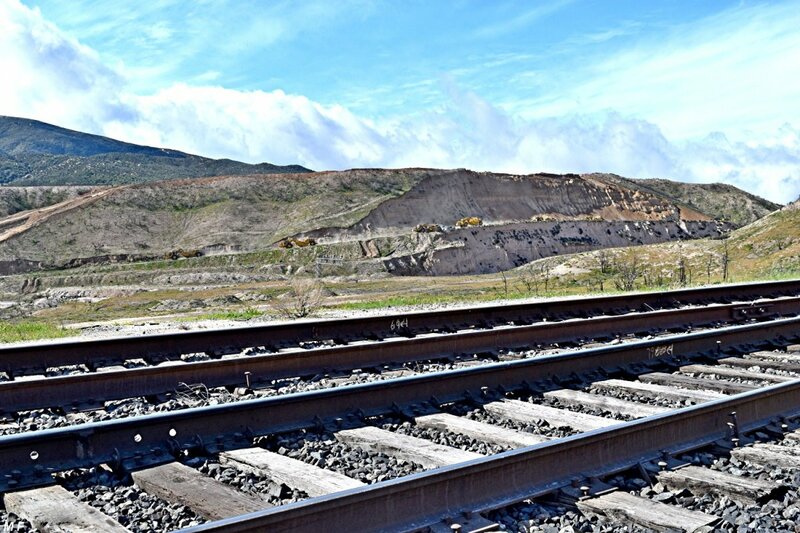 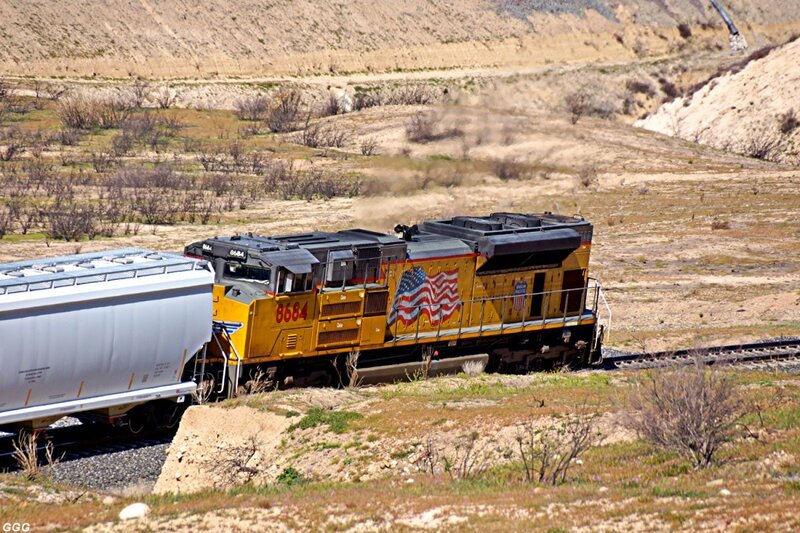 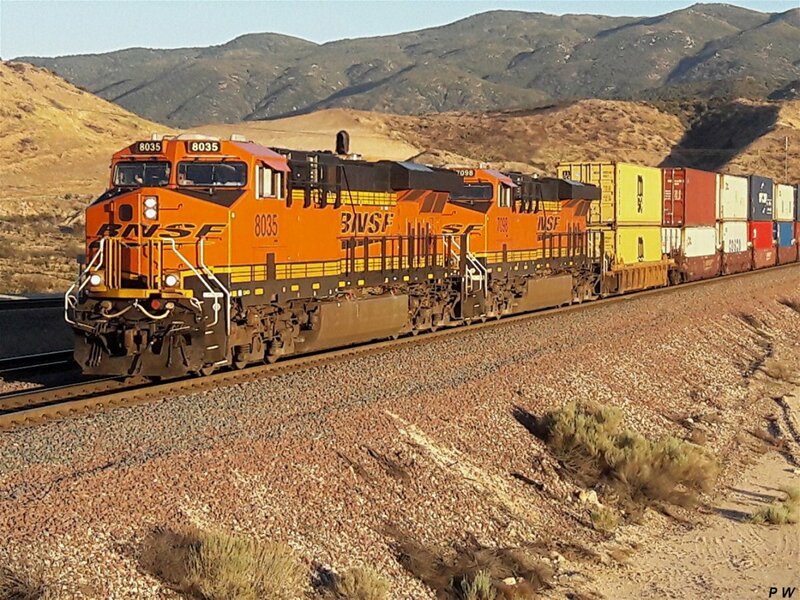 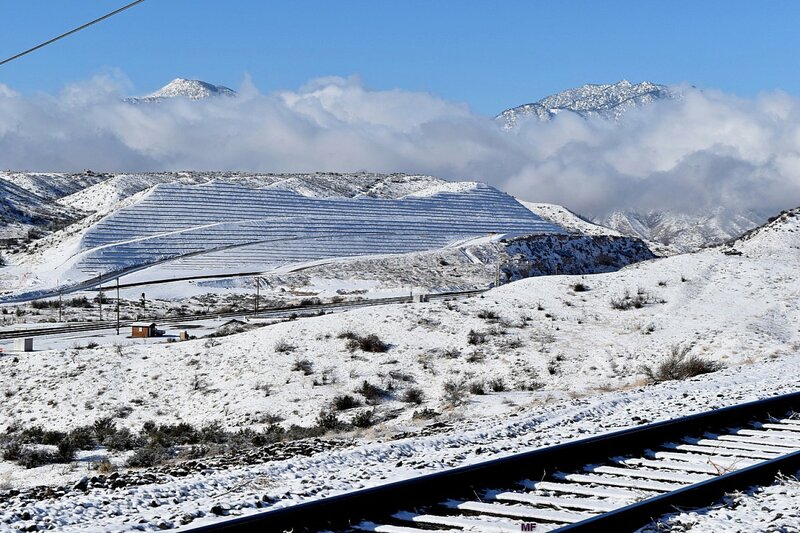 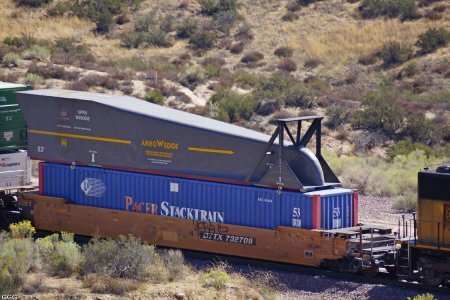 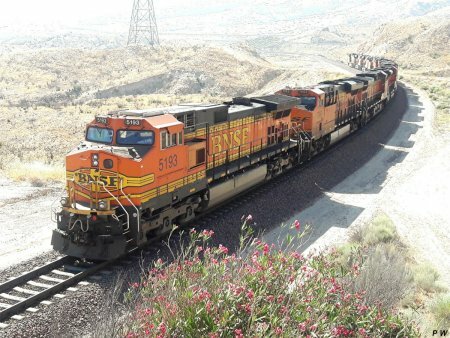 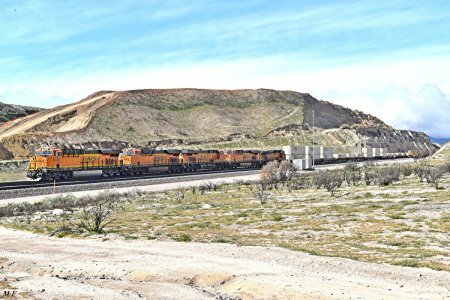 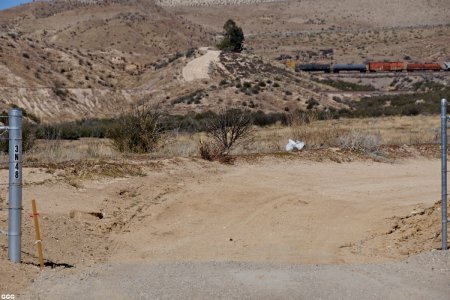 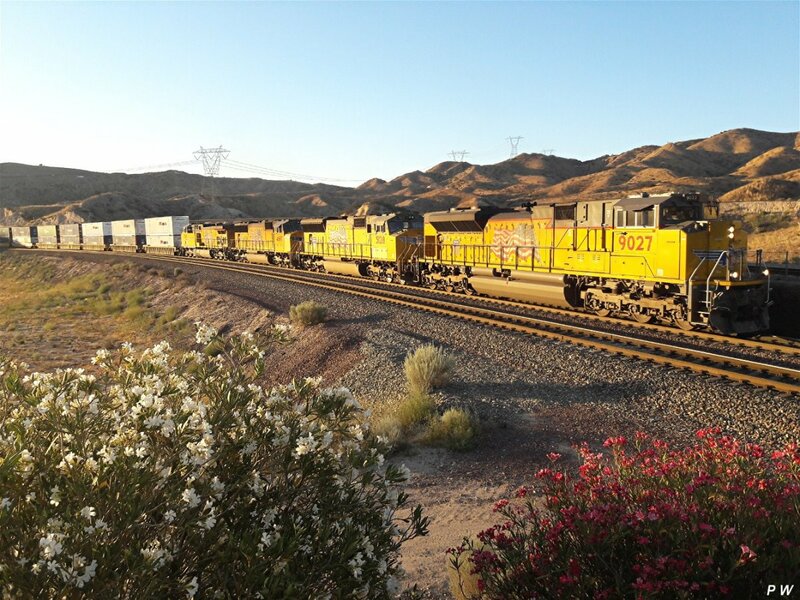 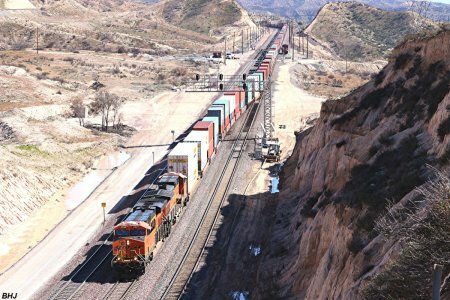 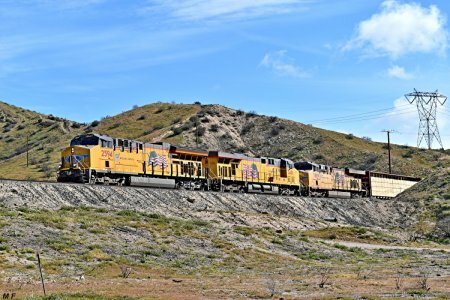 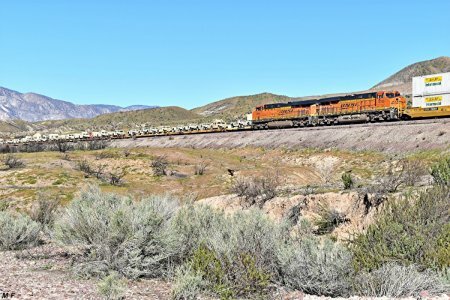 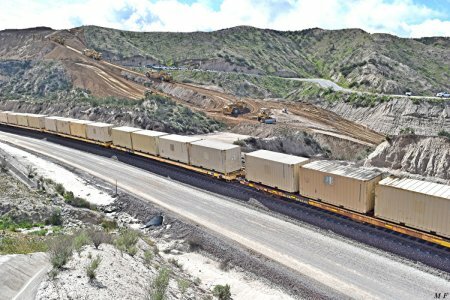 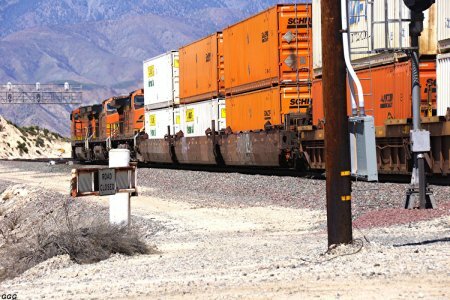 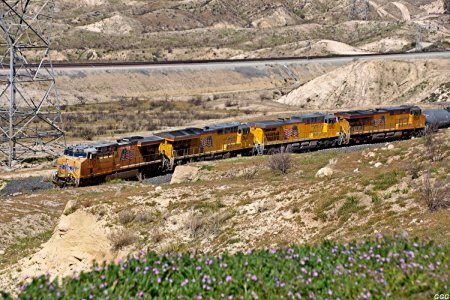 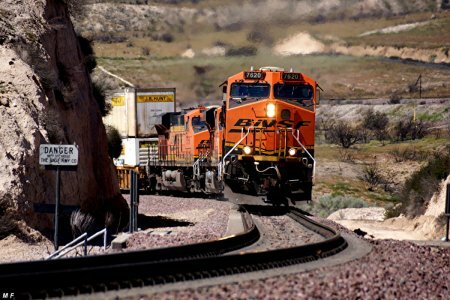 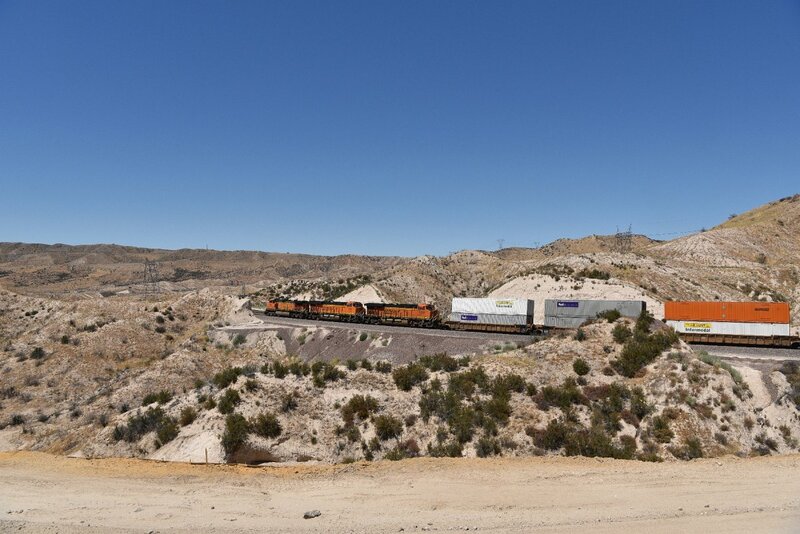 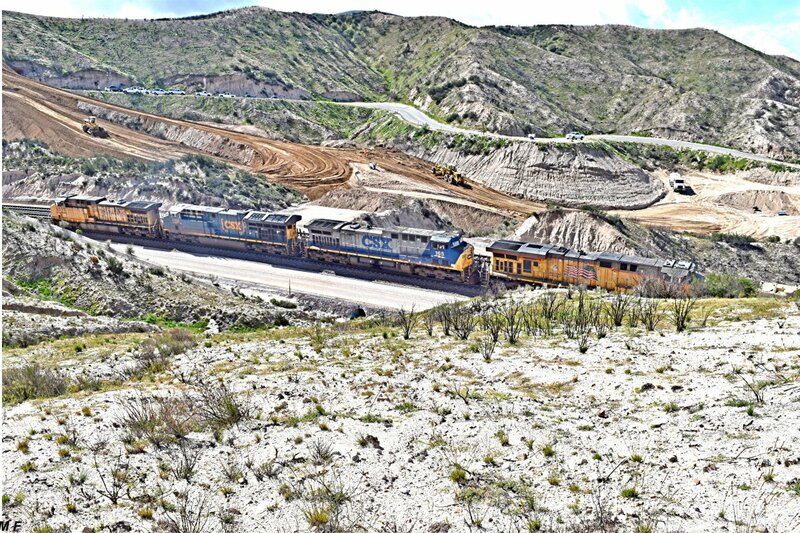 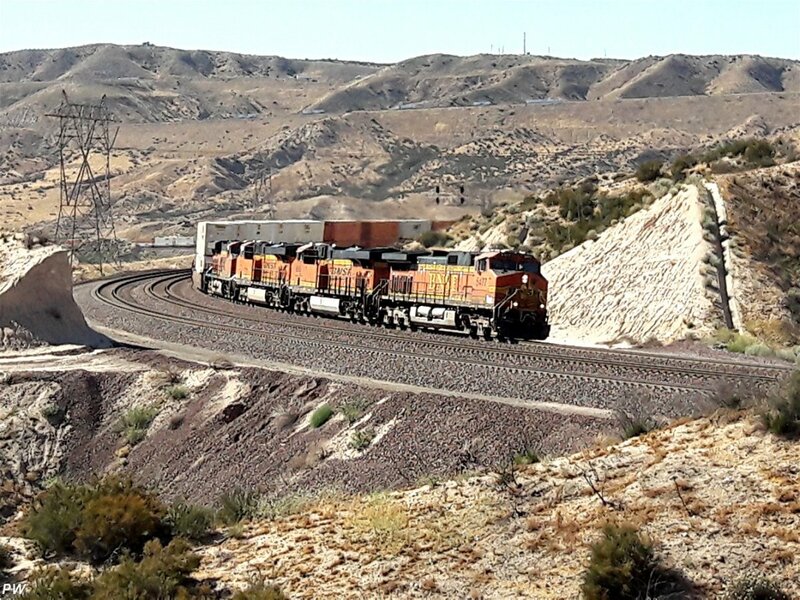 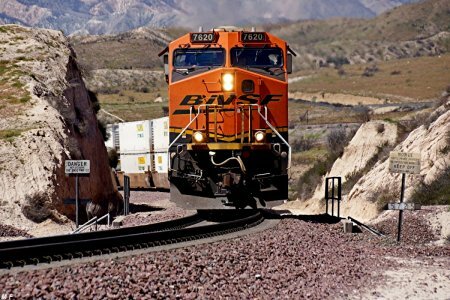 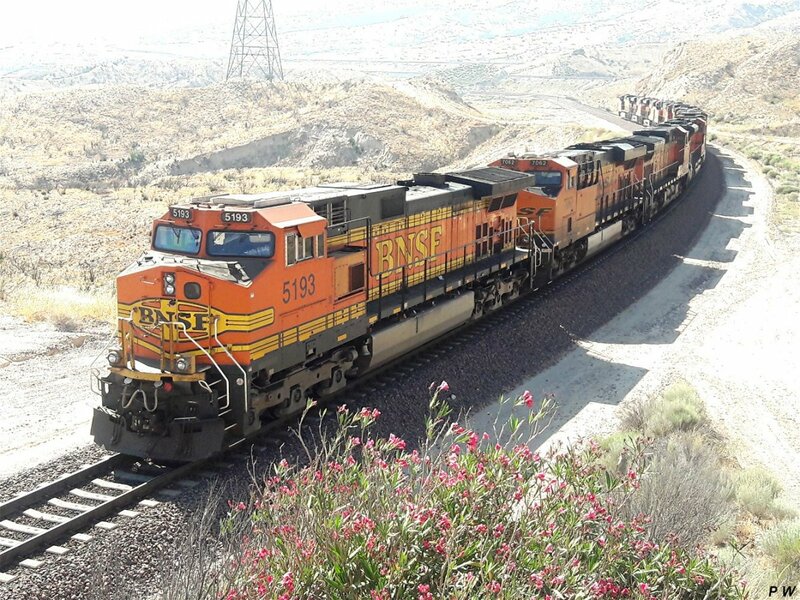 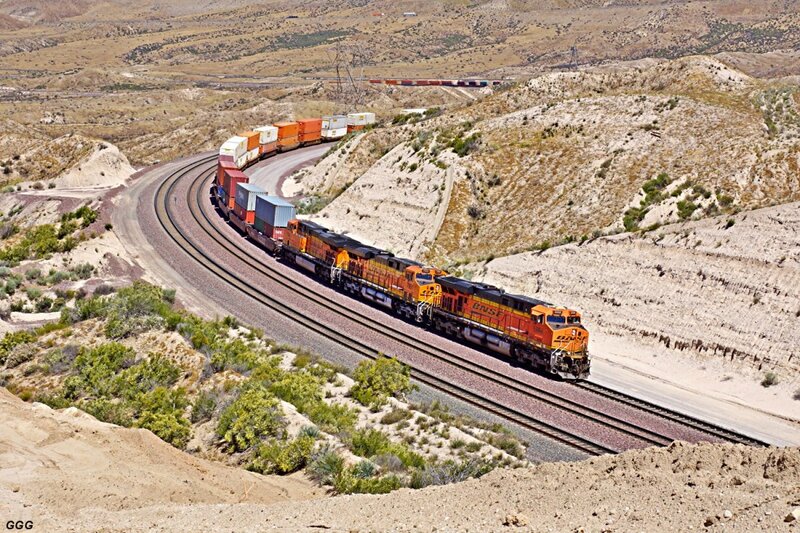 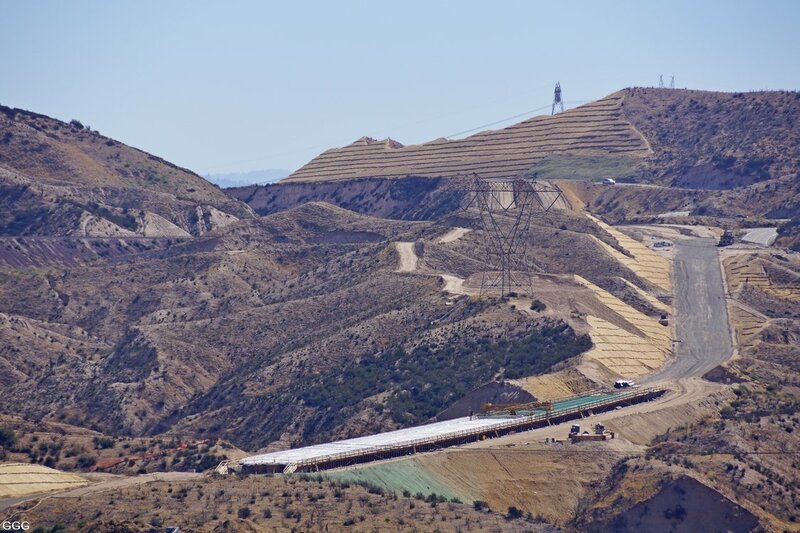 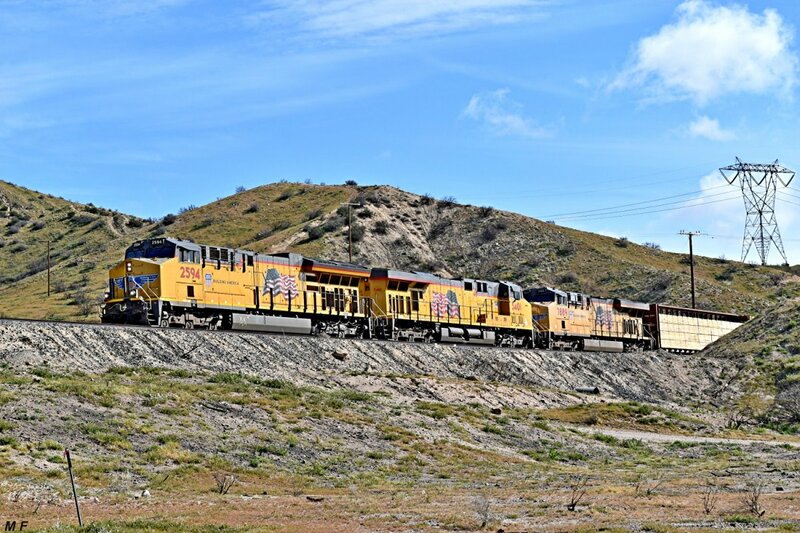 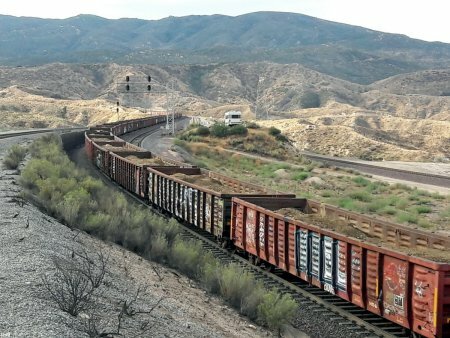 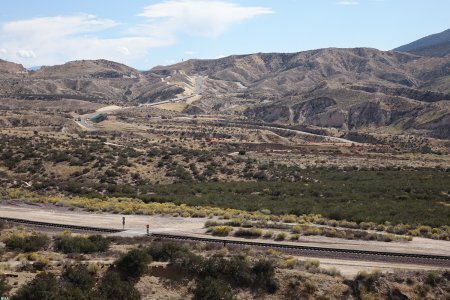 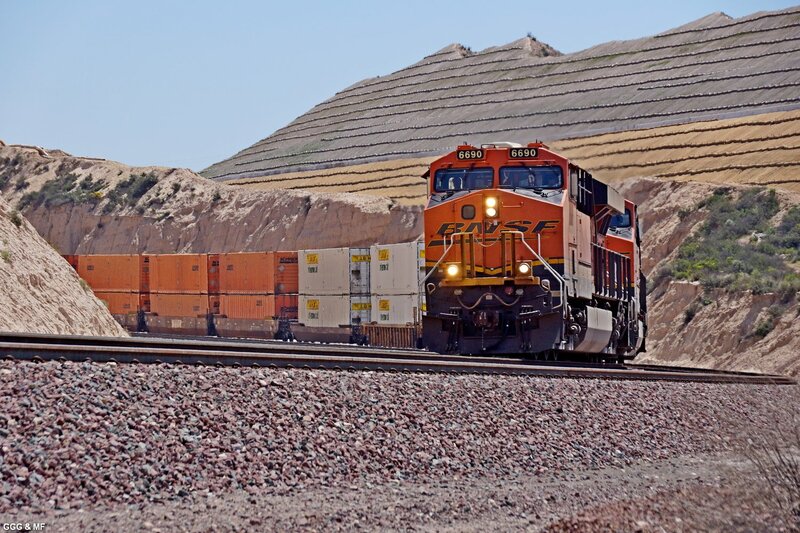 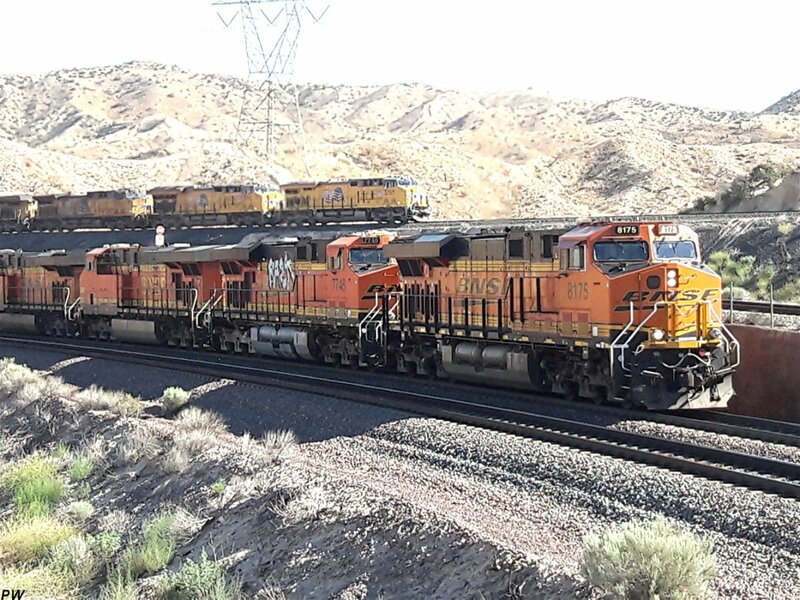 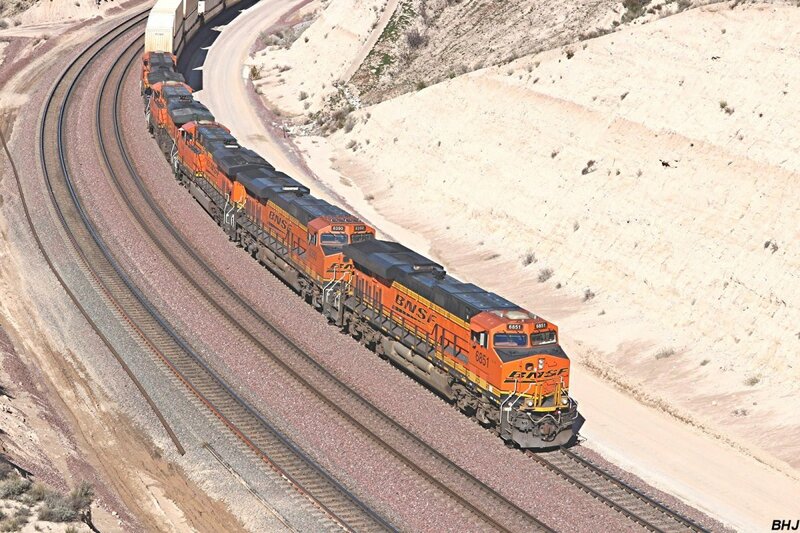 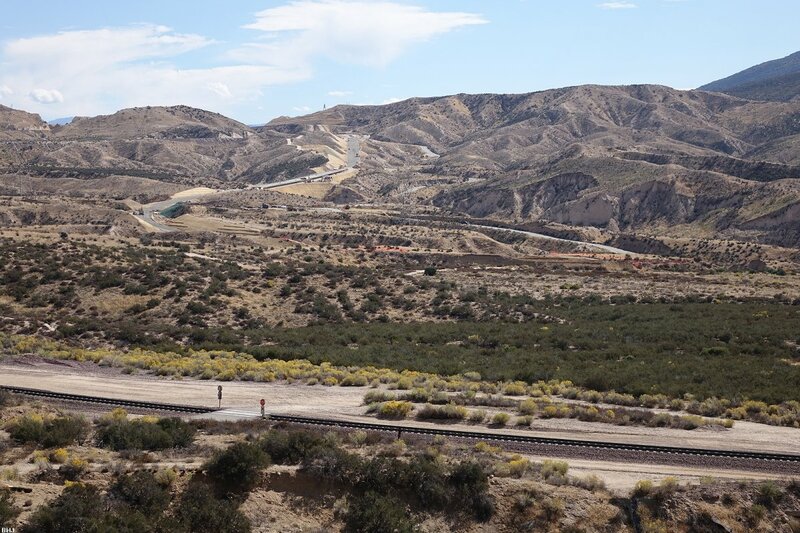 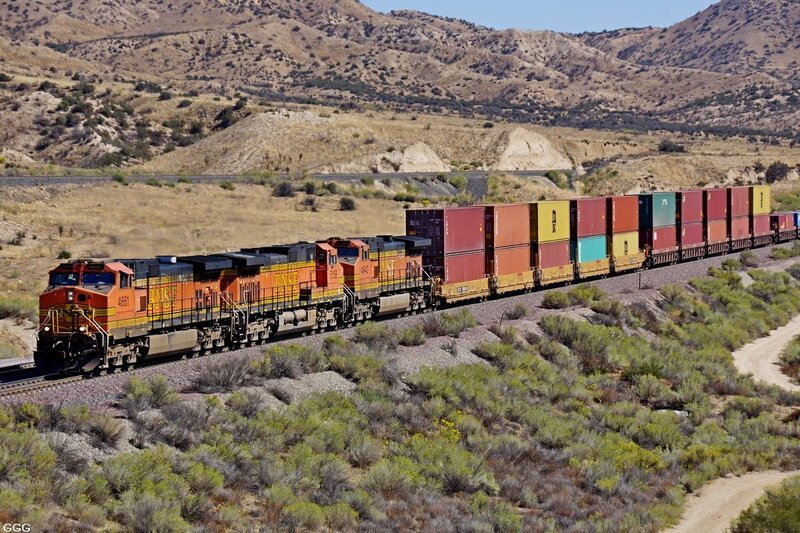 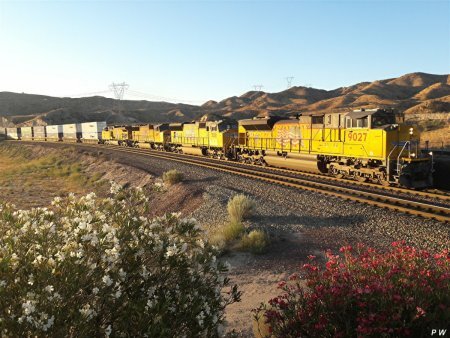 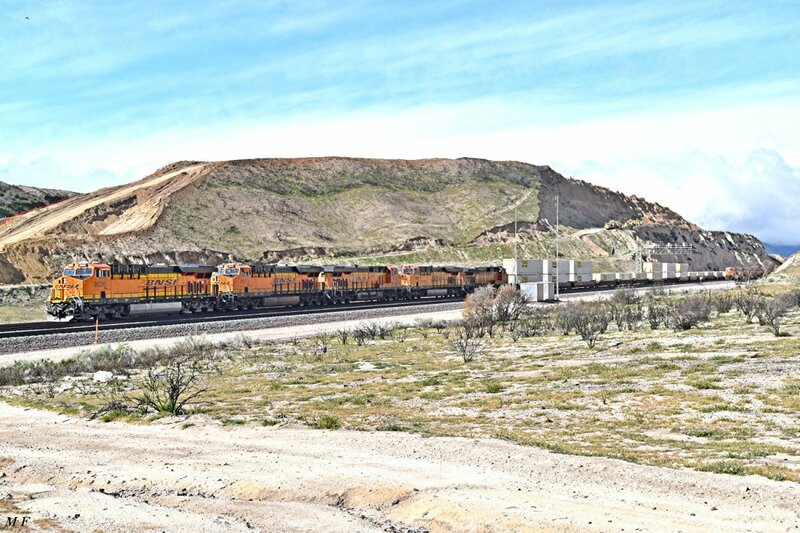 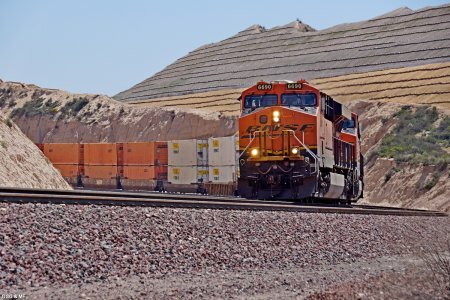 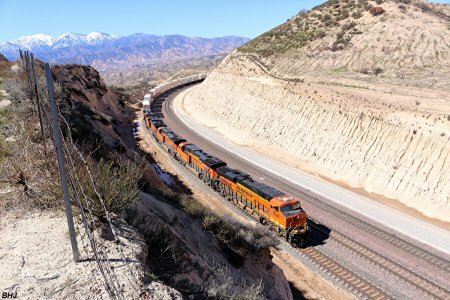 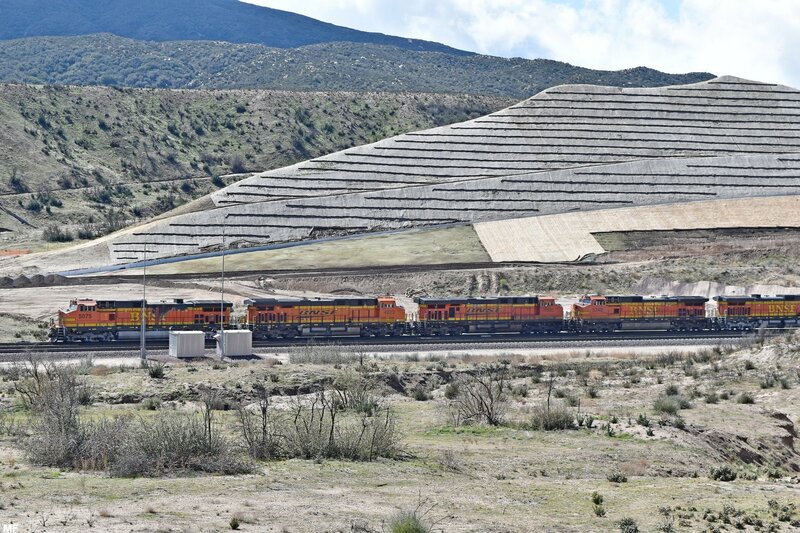 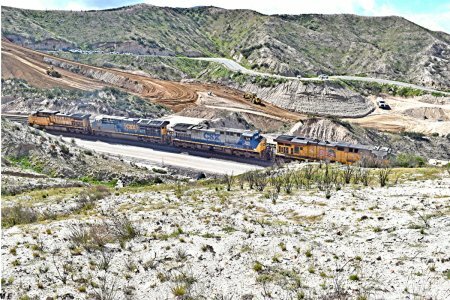 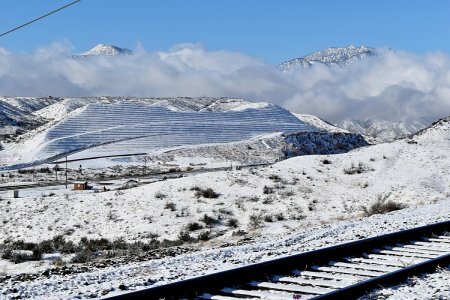 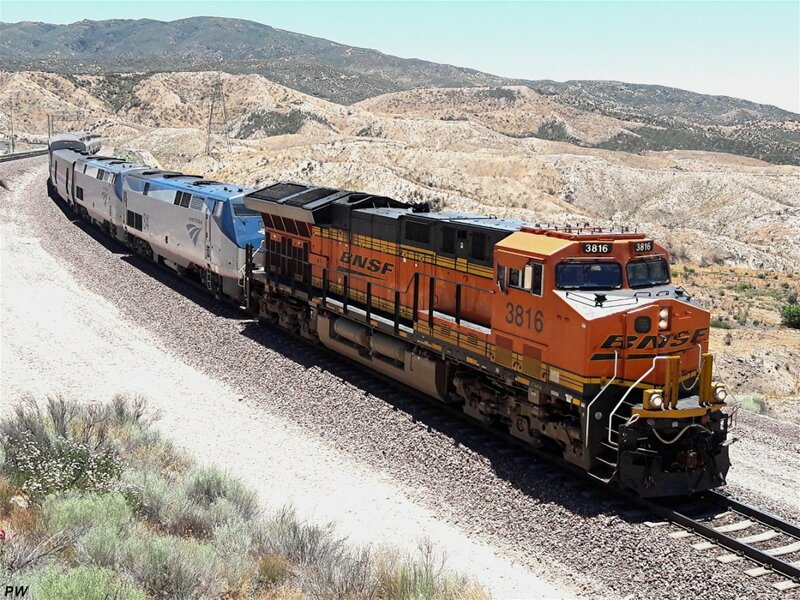 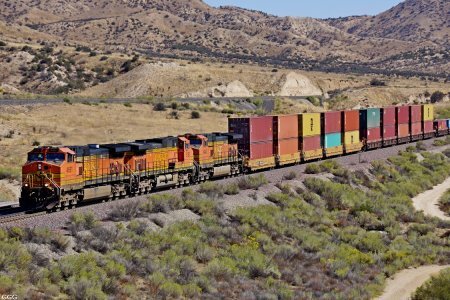 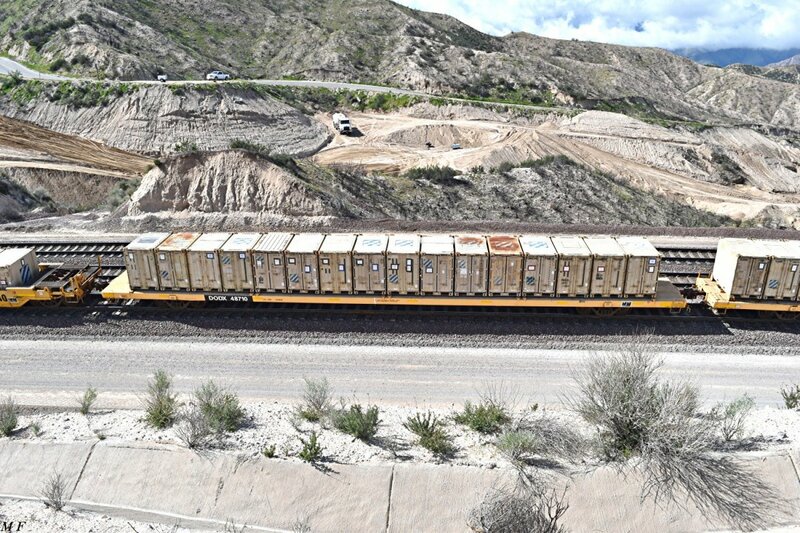 GGG 4/29/18 A labeled picture taken from BNSF MT #3 at the Summit curve. 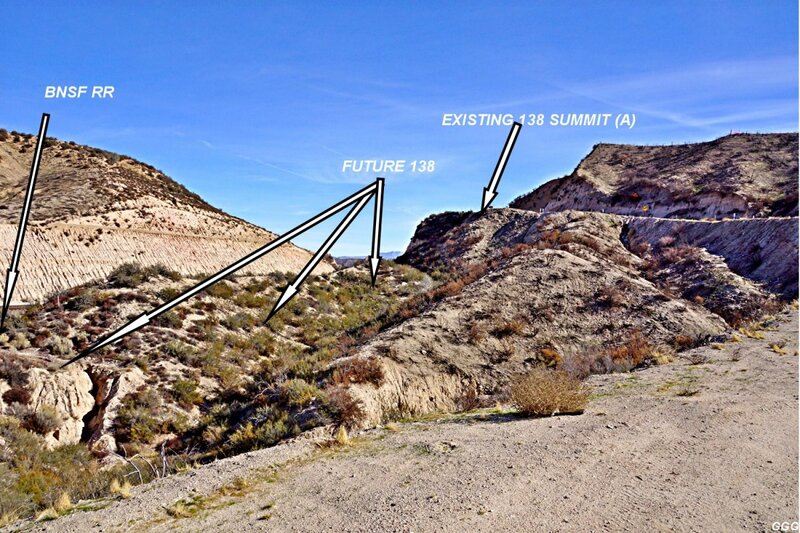 The OLD SR-138 highway and the OLD Summit observation point were almost directly above the NEW observation points and at about the same elevation as the Shoo-fly. 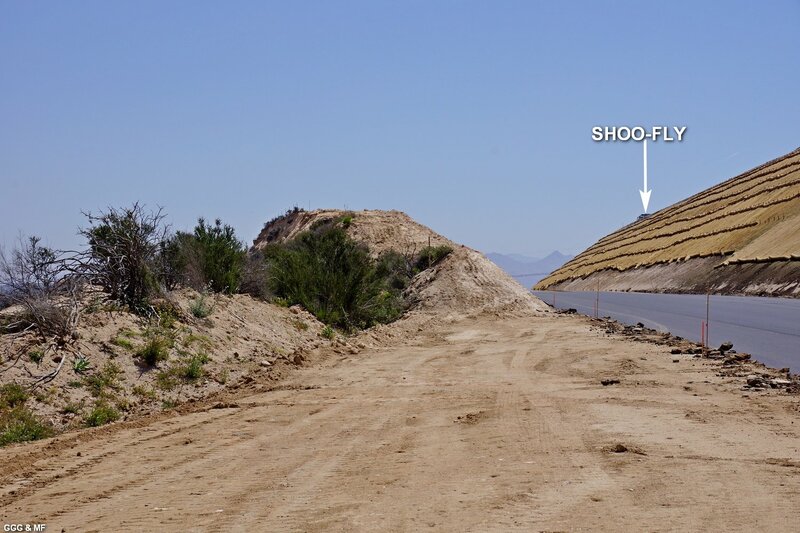 So, we estimate that the new "View" point is 50+ feet lower than before. 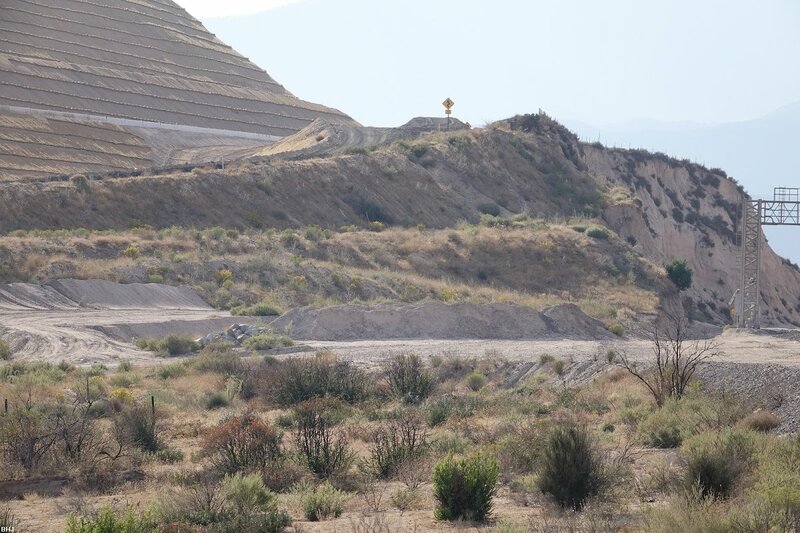 - 224 GGG 4/29/18 The new and very narrow Observation point from the new alignment. It is evident that this small area will need safety railings to keep CA drivers from becoming part BNSF MT-#3 --- and that those railings will probably limit access (especially parking) to the area. The following pictures were all taken near where the old original Summit overlook existed--BUT NOW 40+ feet lower. 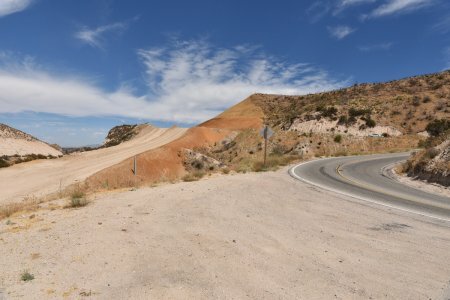 The hill on the left of #234, although not quite as tall as the old summit overlook, gives some idea of the former height of the old SR-138 & observation point. 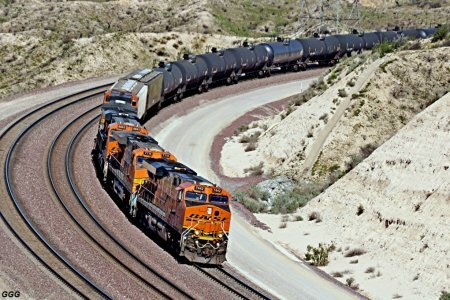 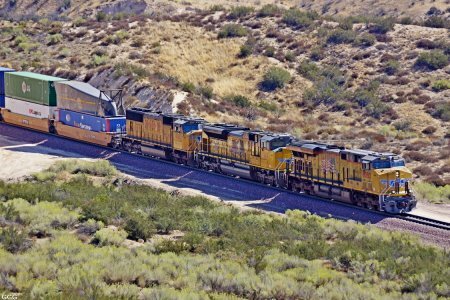 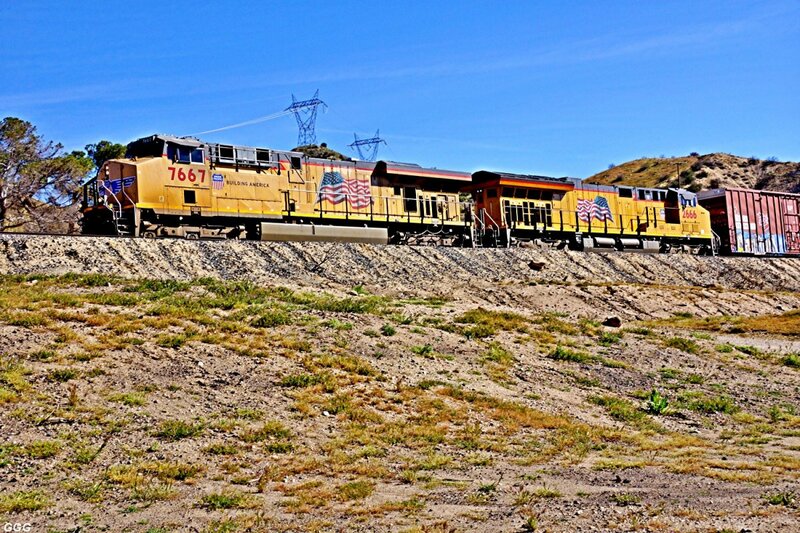 BTW, there was a railfan with camera, on top of that same hill --- quite a climb and looks a bit dangerous. 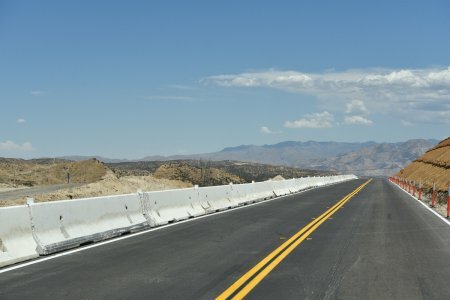 Anyone visiting the area should remember that the new speed limit is 55 MPH ---- which means 75 MPH to most Kalifornians. Entry & exit from this viewing area should be accomplished with GREAT CARE. 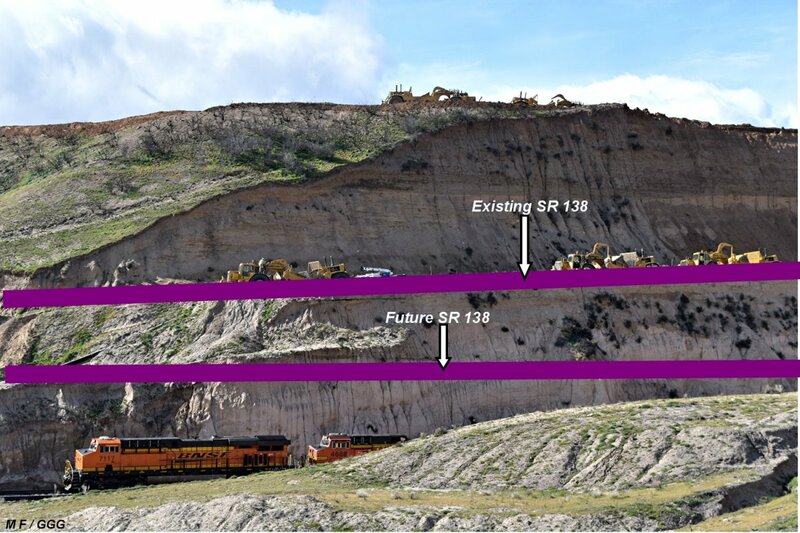 #234 & #235: At the West end of Summit Hill, between the hill pictured in #234 and the guard rail pictured in #235, there is an opening and a small area which will accommodate a few cars and allow a view of the BNSF Summit curve --- unless more guard rails are installed.